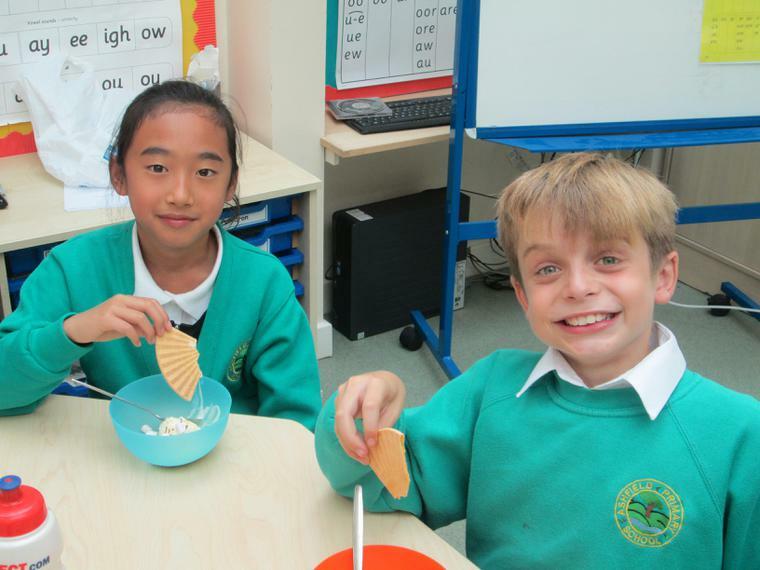 Welcome to another busy Autumn term here at Ashfield Primary, we hope you all had an enjoyable summer break. The children seem to have settled back into school-life well today. We would like to take this opportunity to formally welcome back Mrs Davison from maternity leave. She is teaching in Rowan Class Y4 Wednesday to Friday along with Mrs Archer Monday and Tuesday. We also welcome Mr Nowell, who is teaching in Y5 Elm. We’re really pleased that our own Mr Ross has received his teaching qualifications and he is still with us but in a class teacher role with our Maples. We are also pleased to welcome Miss Milnes as a new teaching assistant who will be working in Willow Class Y2. Please look on our website for more details and photographs of who is who. 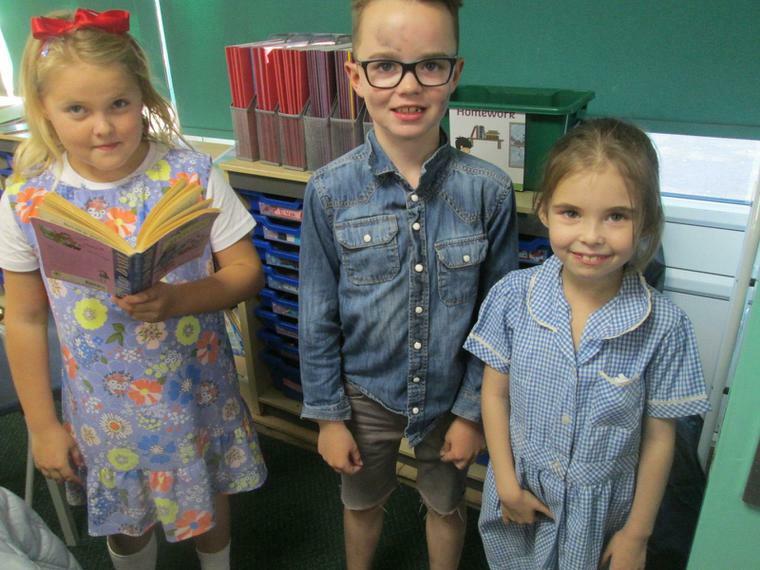 It’s lovely to see the children back at school and looking so smart in new and revamped uniforms. Over the holidays, staff have been busy making the school look smart as nearly everyone has swapped classrooms and designed their learning environments. Here is a brief overview of dates for the rest of the academic year, which will be sent in more detail later. 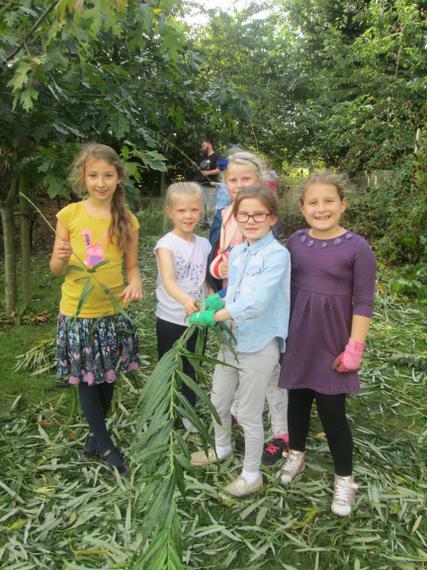 As well as these events, we are delighted to let you know that, as from next week, we will starting a number of After School Clubs from 3.15pm-4.00pm, which I am sure your children will enjoy being part of. There will be a small charge of 50p per week which will be required at the beginning of each half term; however, Homework Clubs, Choir and Film Club will be free. Letters will be coming out shortly asking whether your child wishes to sign up to any of these clubs. Homework Clubs (as last year) are by invitation from the Group Leaders and Film Club is on a first come, first served basis. We hope your children will enjoy the diversity of these Clubs and that you will encourage them to take part. I look forward to another happy and successful year with you and your children and thank you for your continued support. If you have any concerns or ideas in which you feel we can improve our school, please do not hesitate to come and talk to me. I will always endeavour to help you in any way I possibly can. 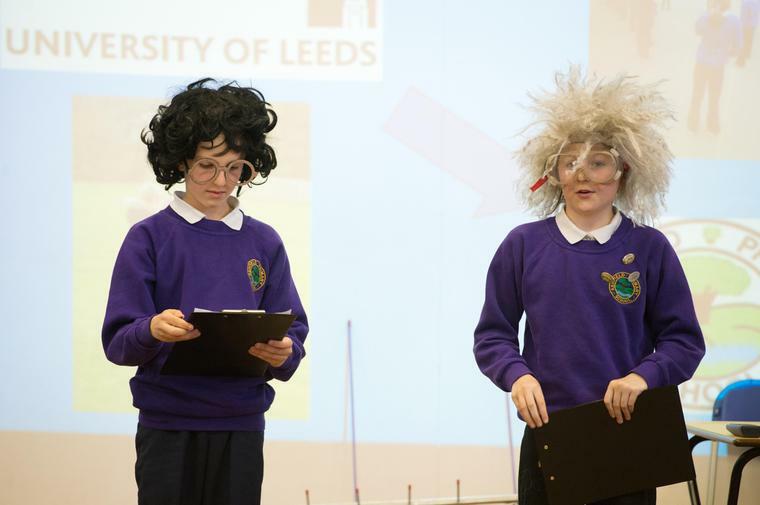 Students form Prince Henry's Grammar School and Lister Park School in Bradford visited our Y5 and Y6 pupils to share their art work and poems all about self image. Our pupils asked some great questions and were a fabulous audience. 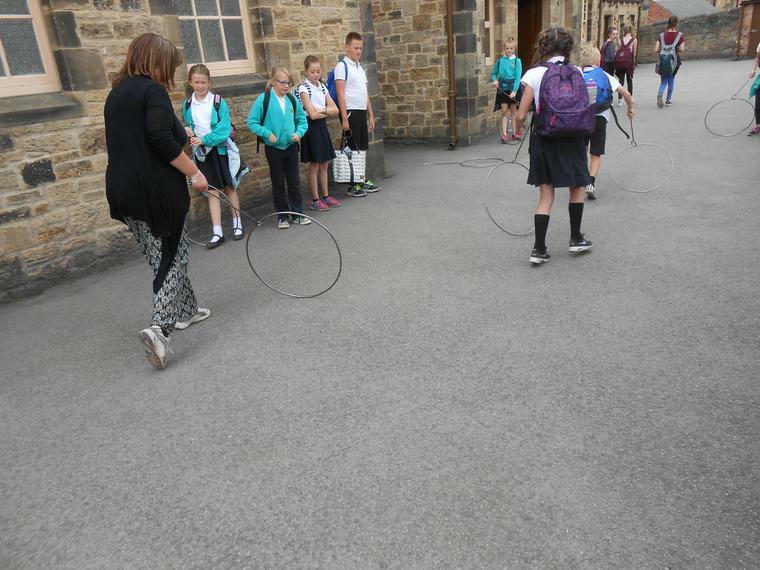 Ashfield joined with the other schools in Otley, Pool and Bramhope to buy in a range of fun and energetic activities for our pupils in the run up to our health week. A big thanks to all the parents and carers who helped out, to Sally Fox HT at Pool for organising the event and to PHGS for hosting. School Council helped Mrs Farrington to design some new playground markings to keep us more active at play times. 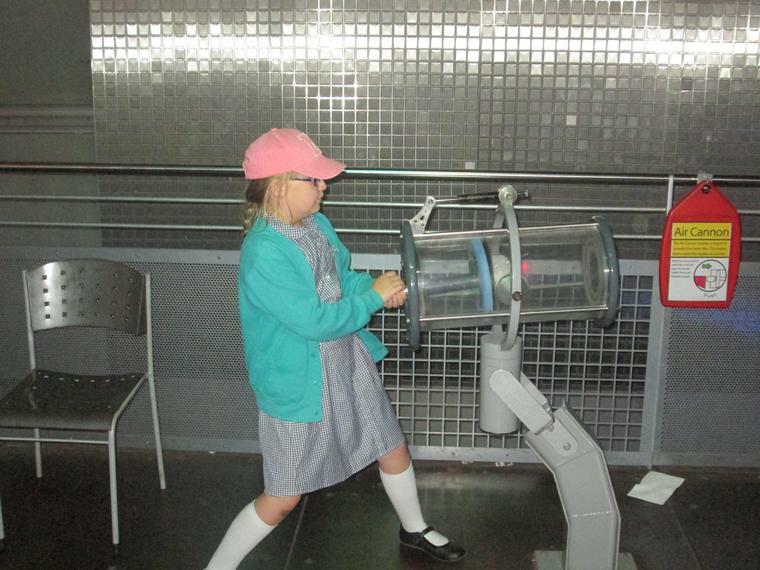 They've also helped to choose other equipment to keep us moving. 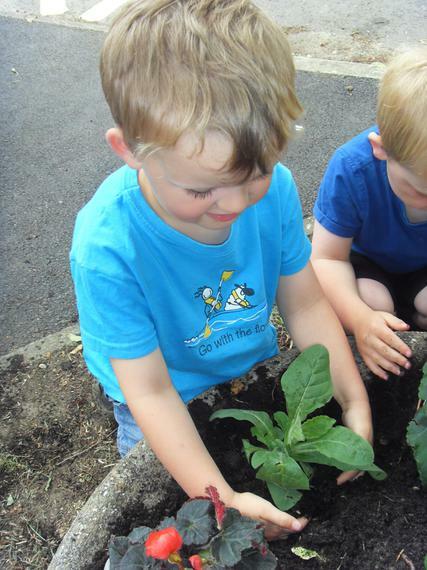 It's been great to see them used so much with the children having a lot of fun in the sun this week. The annual Flower Festival at the Parish Church looked glorious. 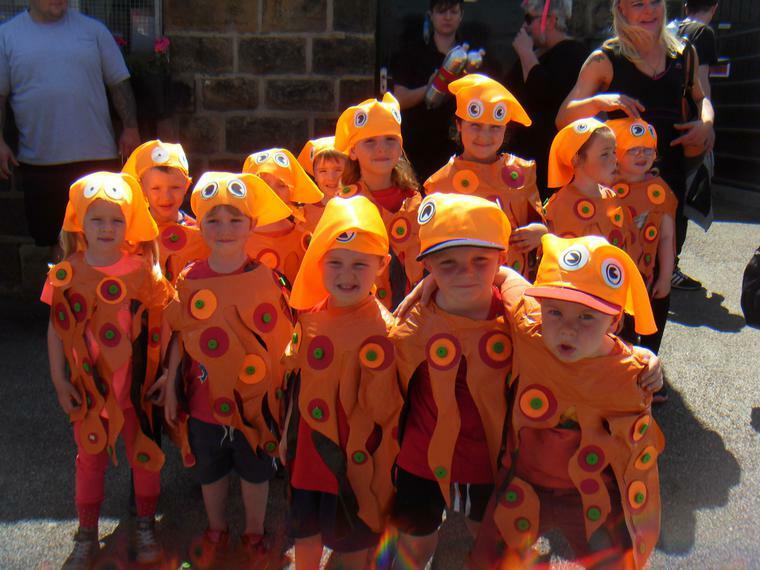 This year's theme was 'who put the colours in the rainbow?' 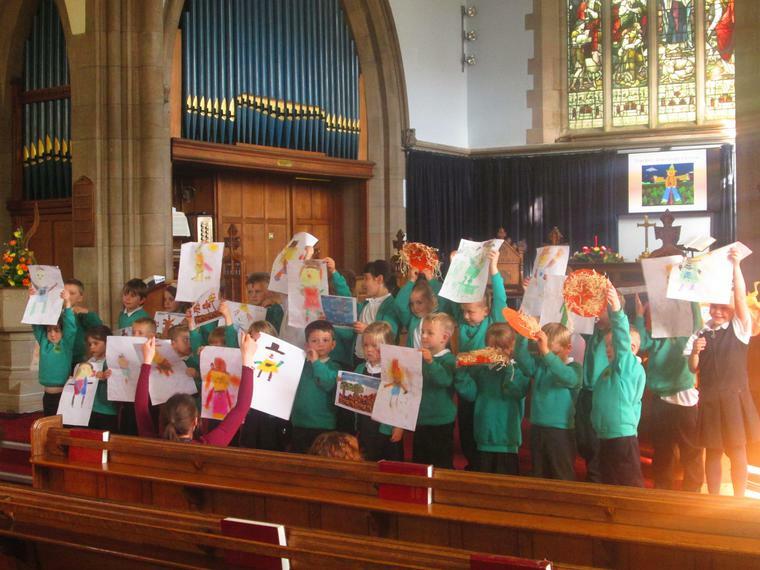 The local schools and children's groups were asked to contribute by making trays of flowers from various materials and they have all been put together down the aisle of the church to create a rainbow carpet. 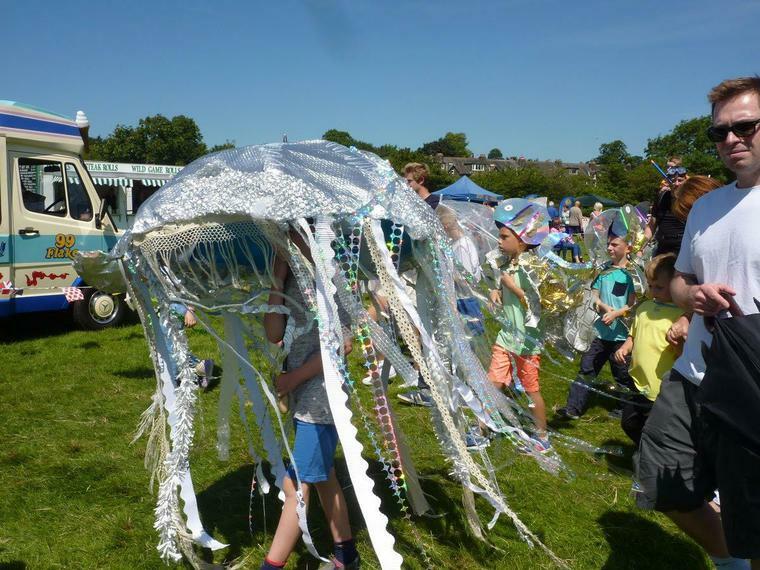 The festival is on today, tomorrow and Sunday (it's free entry!) 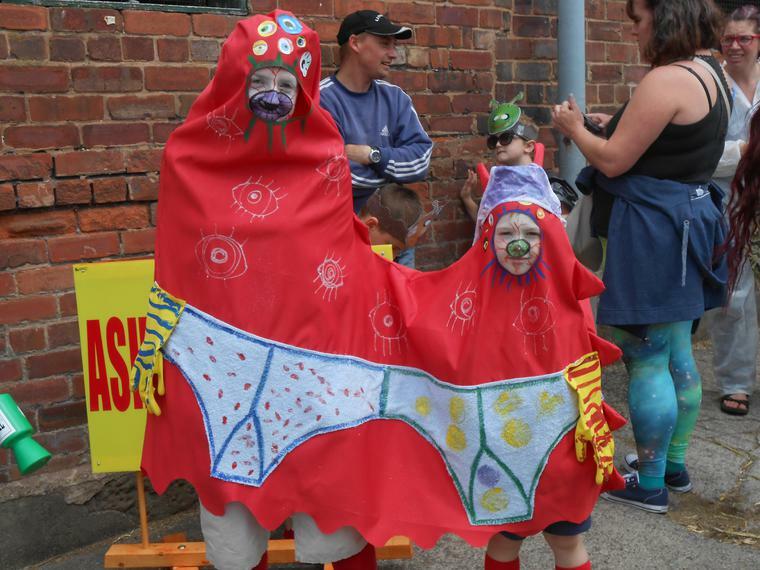 if families want to go and see if they can spot their child's designs. 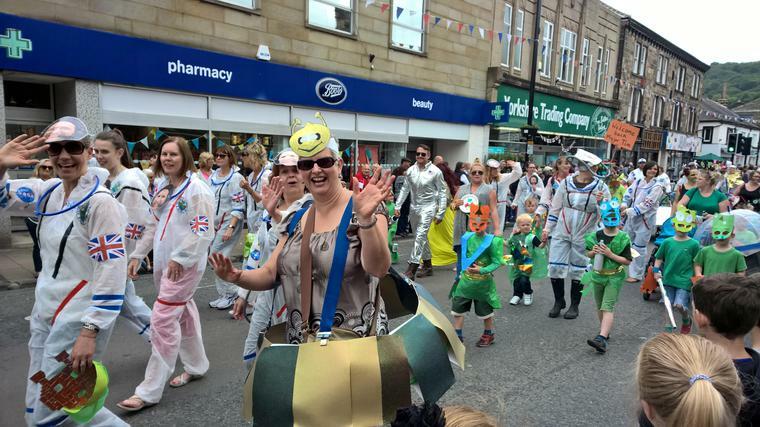 We had a fabulous time at the Otley Carnival today. Luckily, the 70% chance of rain waited until 4pm. 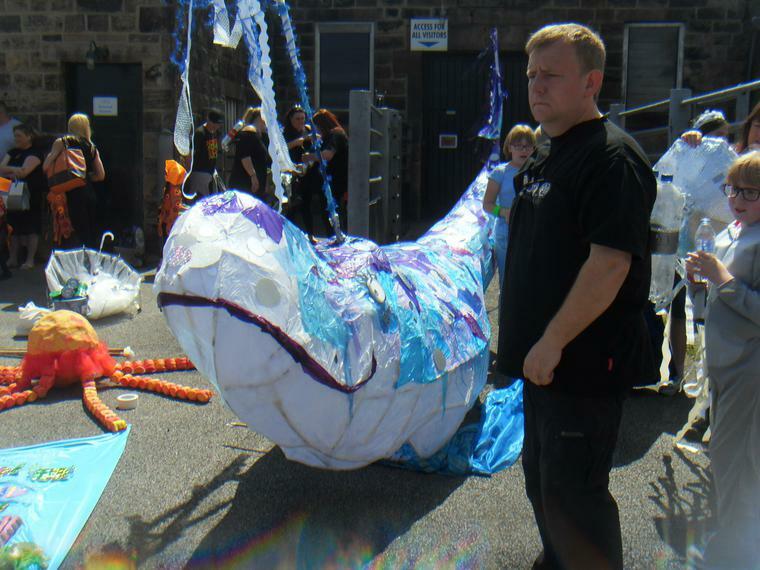 Ashfield's entry of 'Mythical Creatures' won first prize in the walking schools category. Our costumes were amazing. 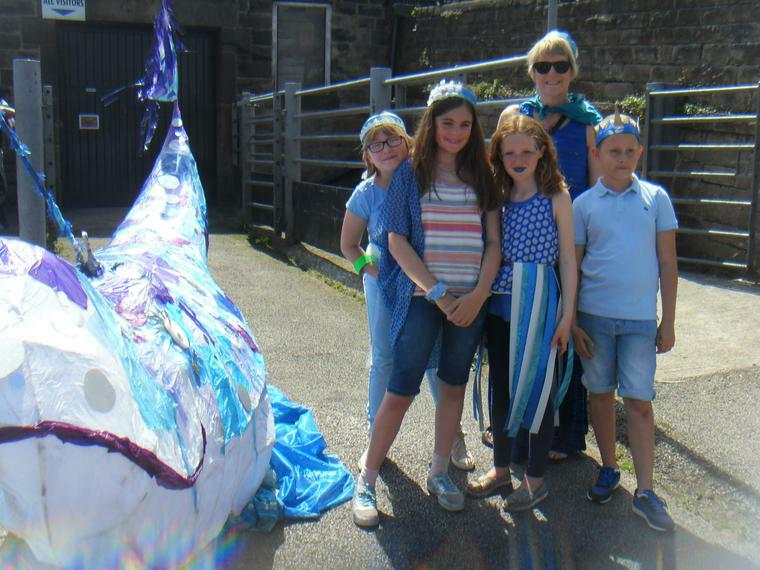 Many thanks to the Friends of Ashfield led by Maz Springham for designing and creating many of the costumes, the dragons and banners. 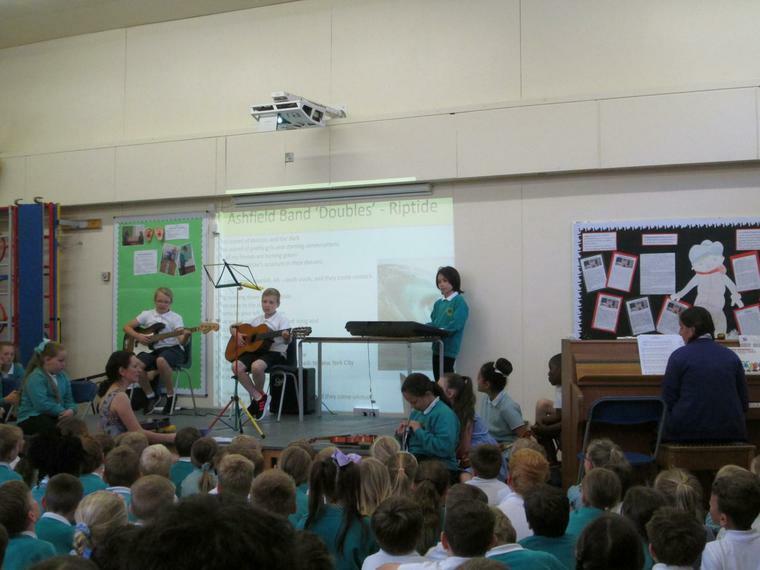 We also had a samba band led by Miss Carpenter with new instruments paid for with a music award bid. 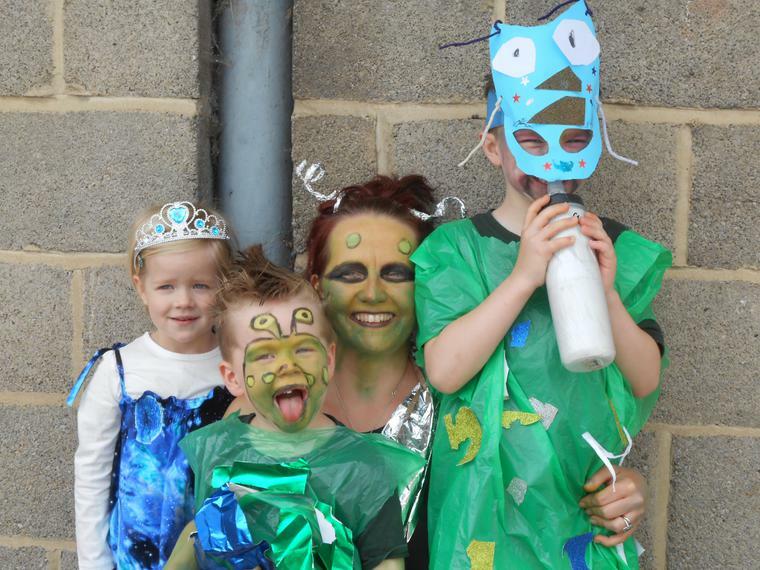 This event would not have been so much fun or so successful without our costume volunteers, parents accompanying children, families cheering us on route, staff helping to organise and children looking absolutely fabulous. Many thanks. The children really enjoyed watching the women's race of this year's Tour de Yorkshire come straight past the school. 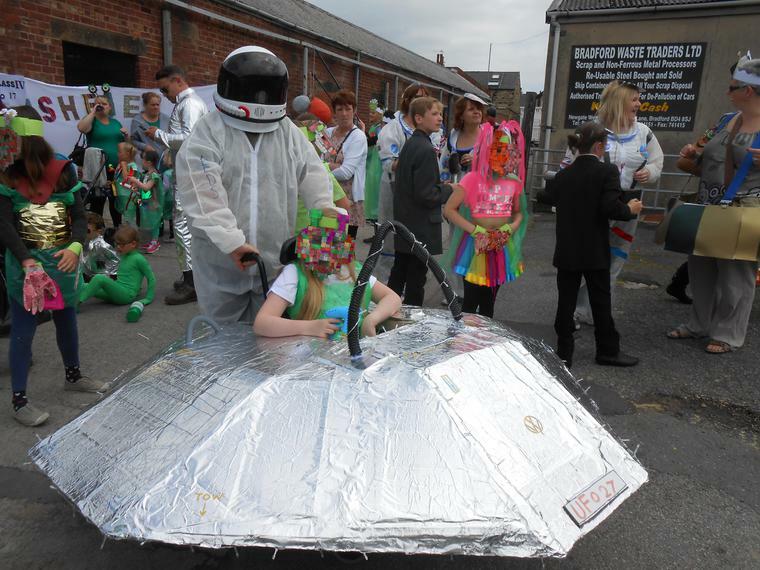 I'm sure that the contestants got the loudest cheer from our pupils. The television cameras picked up a bit of the land art you can see in the pictures. 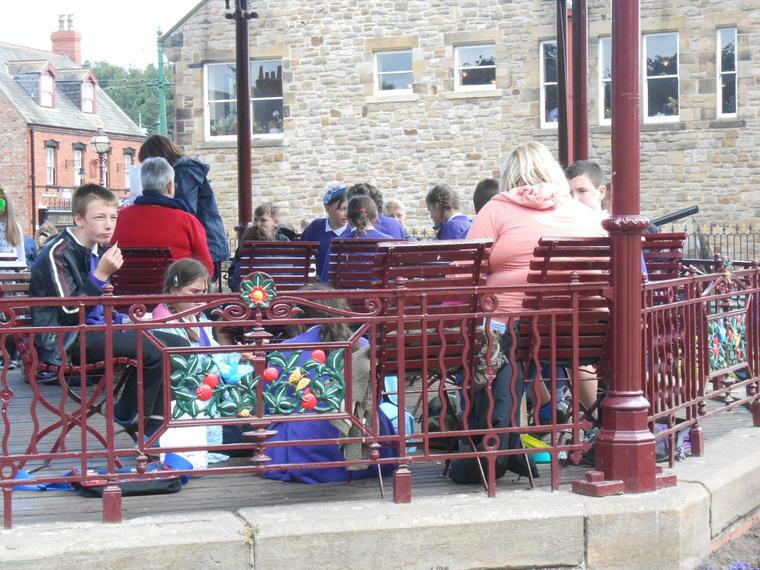 As well as cheering and waving our flags, we enjoyed a picnic in our grounds. What a fantastic day. We enjoyed our cycling playtimes. A special thanks to Mr Bradley for his support with this. Thank you to all pupils, parents and staff who cycled or scooted to school in this fortnight. 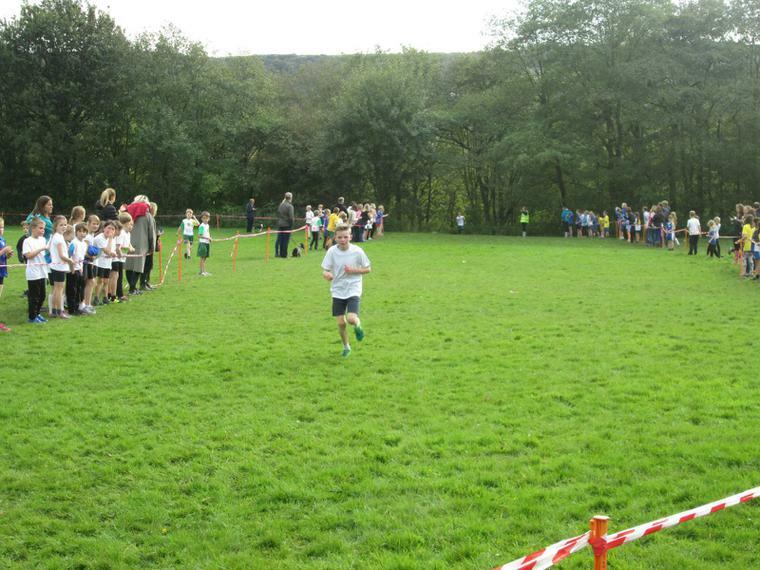 The results place Ashfield 3rd in Leeds and 214th overall. Thank you to all our parents and carers for working with us and for taking the time to fill in our parent questionnaires. I'll have the results to you after sharing with our governors. 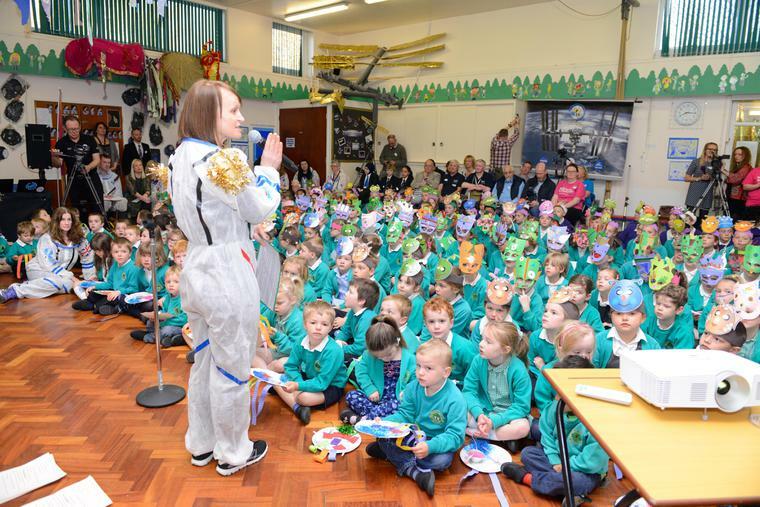 To celebrate British Science Week, Mrs Dolamore set plenty of challenges for our pupils to promote their exploration and discovery skills. 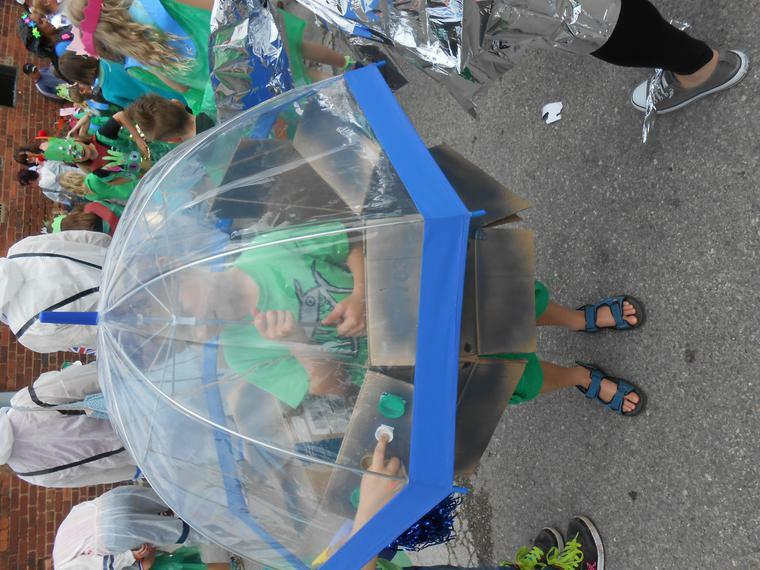 It culminated in a competition to set your own science challenge. 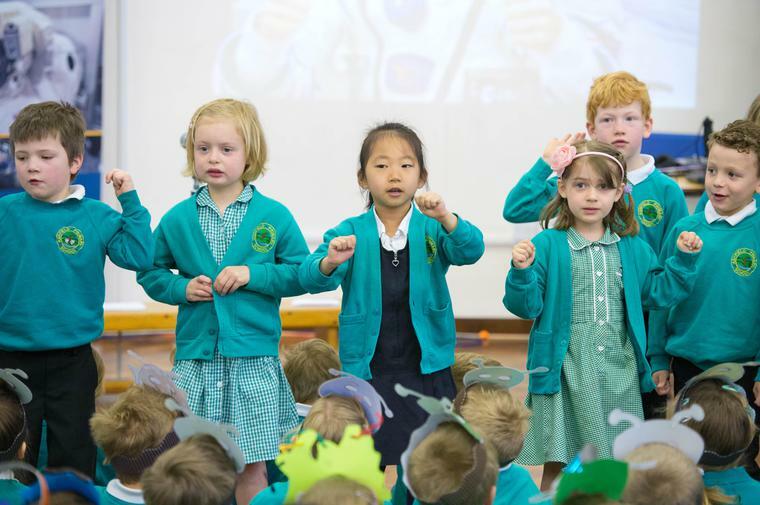 The winners celebrated in an assembly led by Dr Marty Jopson, who showed them fun science with bubbles. 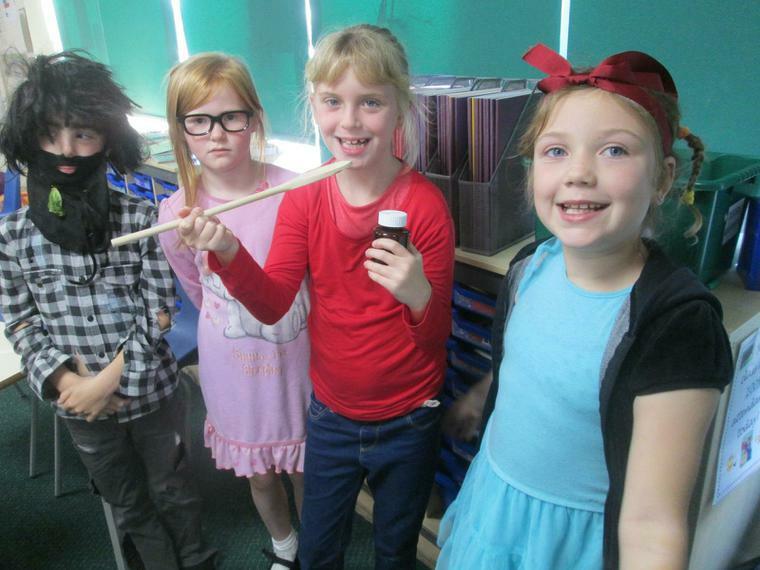 We celebrated out postponed World Book Day today. 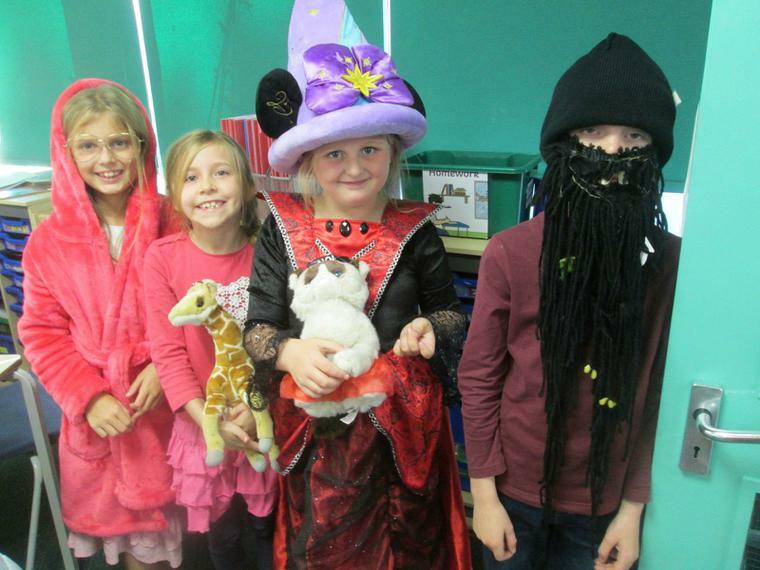 We dressed up as book characters. Here are some photographs. The teachers had fun changing classes for story time. Each class had a mystery book to read and then feed back to Miss McLaughlin. What strange characters in our assembly! Wednesday 28th February 2018 We had great fun in the snow today. I'm pleased to be able to share with our new Ofsted report. Paper copies went home tonight with the children. I got a treat today joining Year 1 for a walk around our locality looking at different types of housing. We looked out for terraced, detached, semi detached, flats and bungalows. Some of the children had their eyes out for houses made from straw, wood and bricks and any sneaky wolves trying to blow them down! 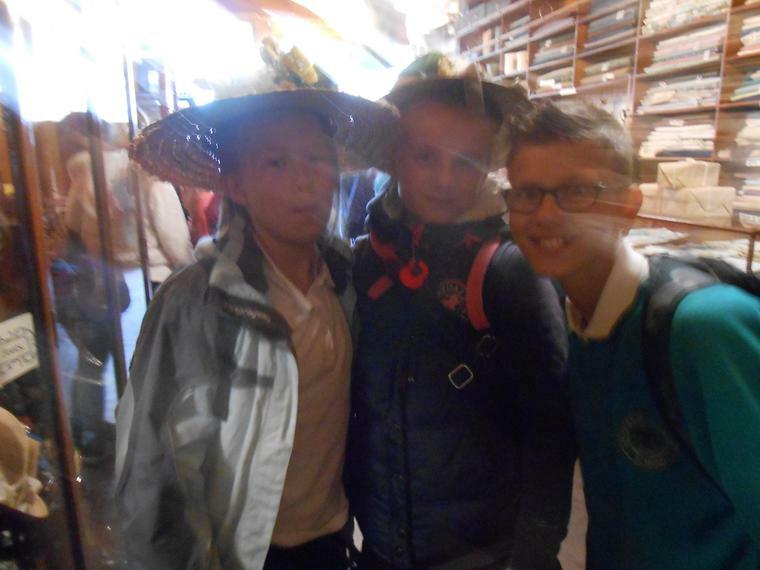 Year 6 visited Eden Camp. 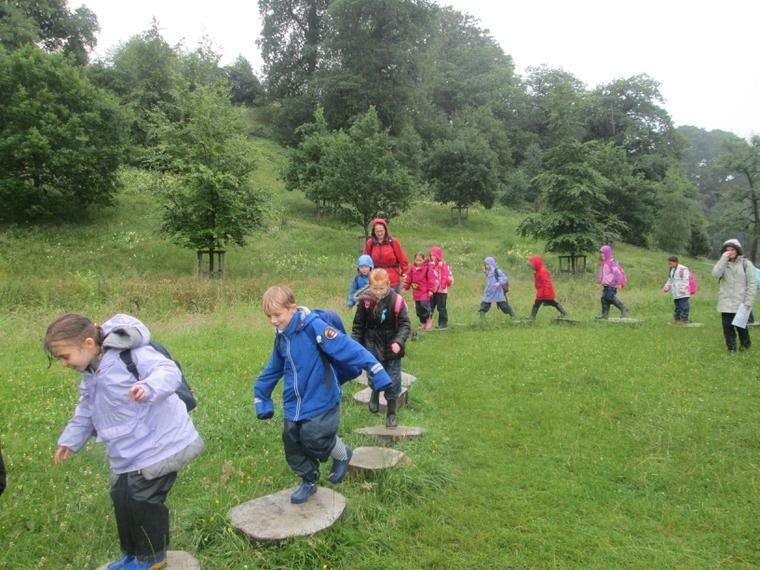 The children were enthusiastic from start to finish despite the miserable weather. 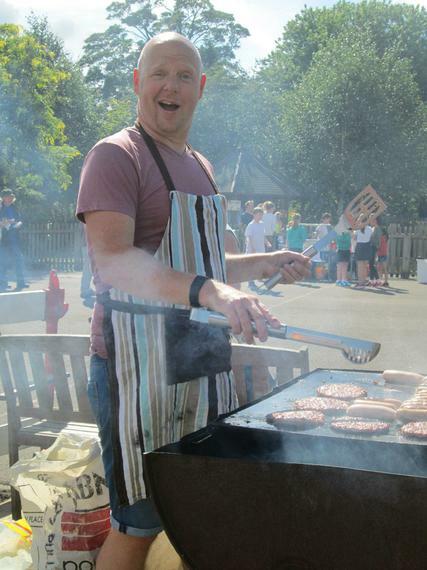 All staff were extremely proud of their conduct and positive attitude all day. We had a long awaited visit from Ofsted today. 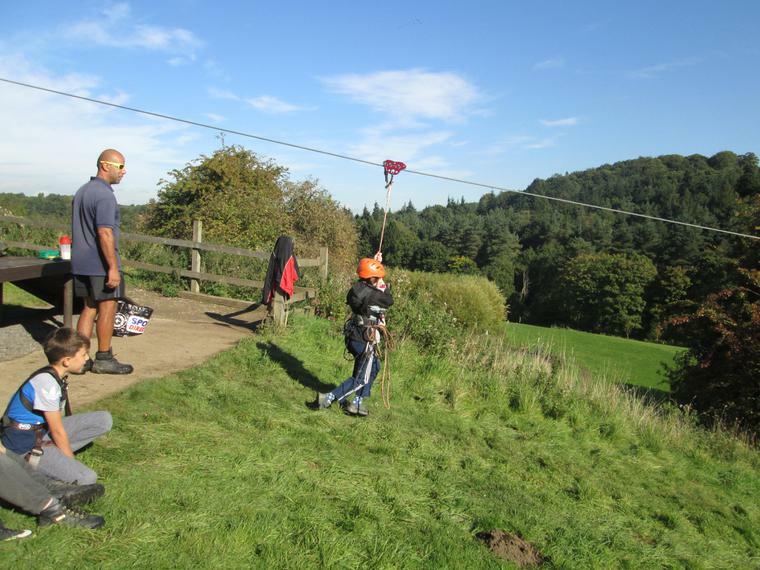 The children were polite and friendly and I was pleased with the feedback at the end of the day. The report should be ready to share with you in about 14-18 days. 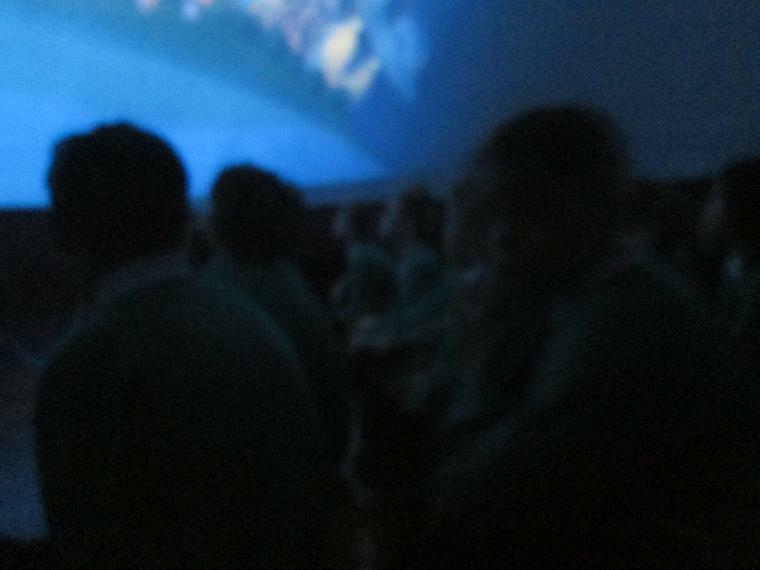 Willow Class had a super time at The Deep today. 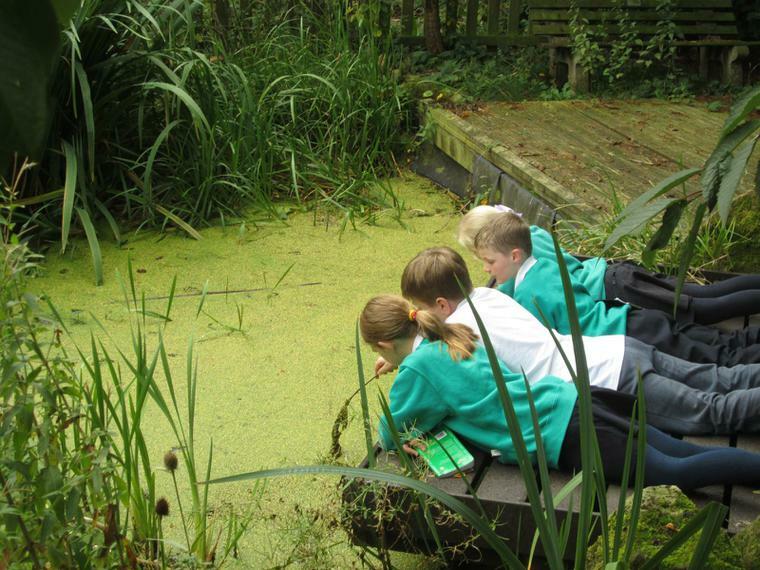 They will use all their experiences back in school in science, topic, maths and English work. 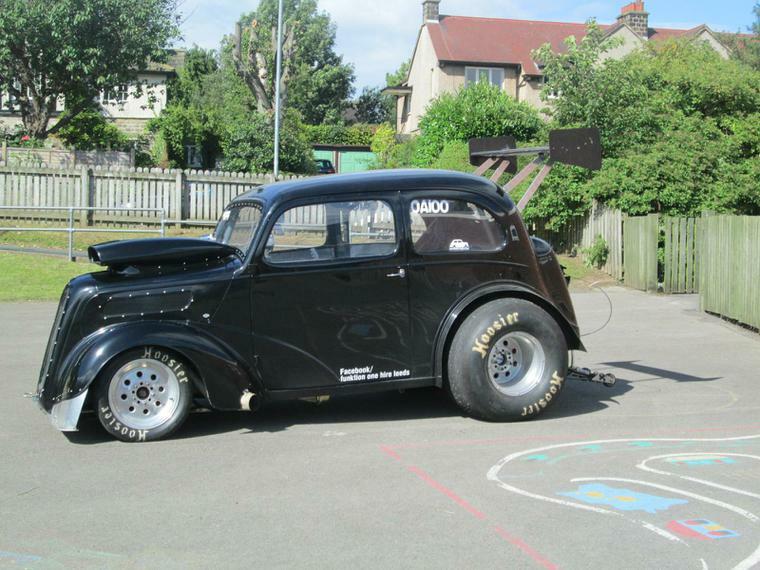 Adults who accompanied the class came back saying how proud they were of our children's behaviour. We've had a focus on learning from mistakes this week. If everyone gets things right first time, they're probably not challenging themselves enough. Mistakes are good if we see them as learning opportunities. We've celebrated with a child who had reflected on a behaviour mistake and used this reflection time to decide how to improve things this week. This not only led to a golden time stamp, but led to a Bronze Certificate and being celebrated in assembly. Another child struggled with some maths work on area at the beginning of the week. After discussing errors and making corrections, she showed her learning was consolidated by not only getting the problems correct today, but also by helping others. Maths was challenging. Mistakes were corrected. Success and rewards for super behaviour. Reflection after losing Golden Time. A big thank you to everyone for some lovely Christmas card and gifts. I hope you all have a super Christmas and look forward to seeing the children back in school on Wednesday 3rd January. Once again, KS1 did us proud. Their nativity and singing filled the church and really made us think about the true meaning of Christmas. The Christingles filled the church with a beautiful light and our children were so sensible. Thank you to all who came out to support us at Bridge Church. 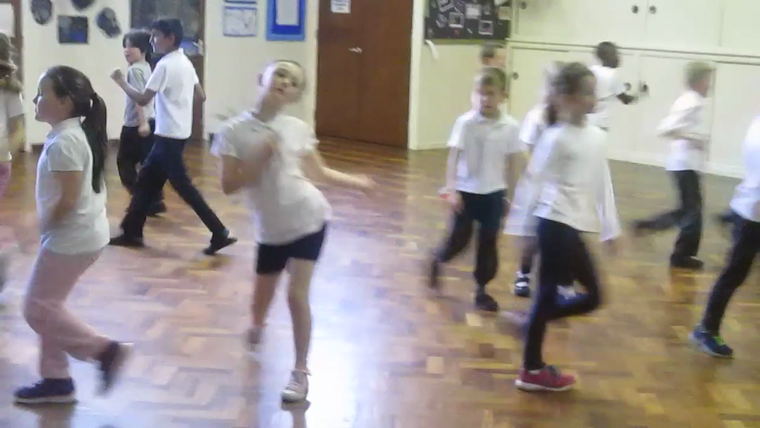 Beech Class - Choristers to Rappers - I love the quick change from angelic to fun. Rowan Class - Christmas alphabet - you performed this poem so well. Elm Class - Alternative 12 Days of Christmas - 'On the second day of Christmas Mrs Warren gave to us - 2 Guinea pigs' - was my favourite line. Cherry Class - Xmas Factor - I would have voted them all through - Simon's too mean! Oak Class - Talking Turkeys - Benjamin Zephaniah - What can I say - total agreement as a vegetarian! The children were amazing. 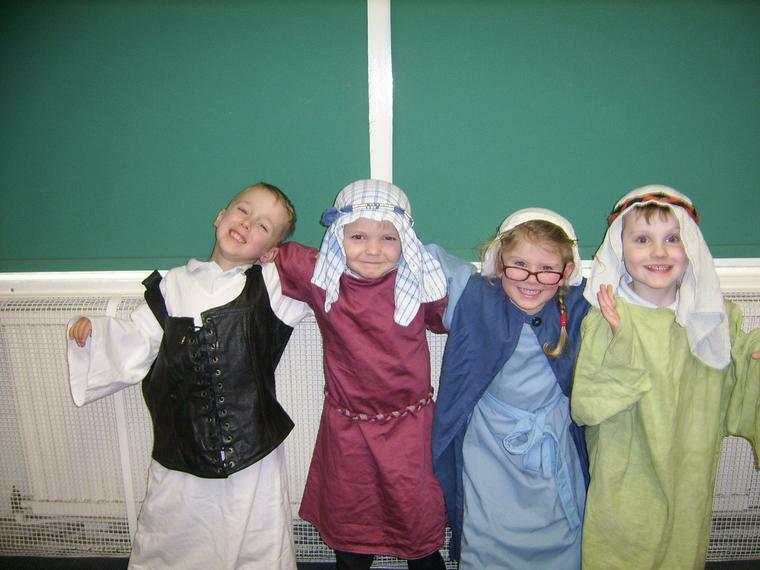 They performed such a good retelling of the Christmas story. I hope all the adults who came really enjoyed it. 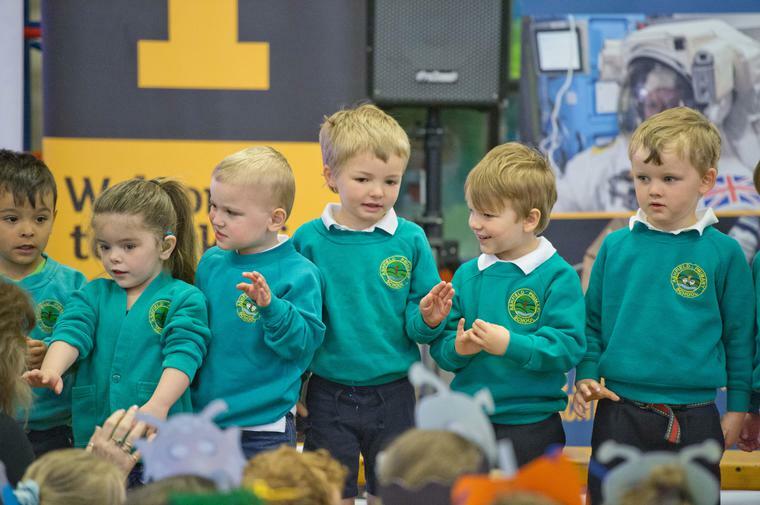 Today, governors joined the staff and children for a full day in school. 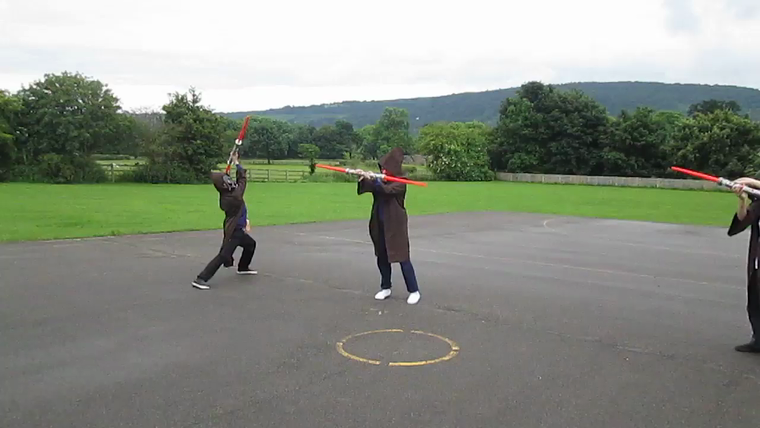 They spent time in classes, talked to school council and played out at lunchtime. 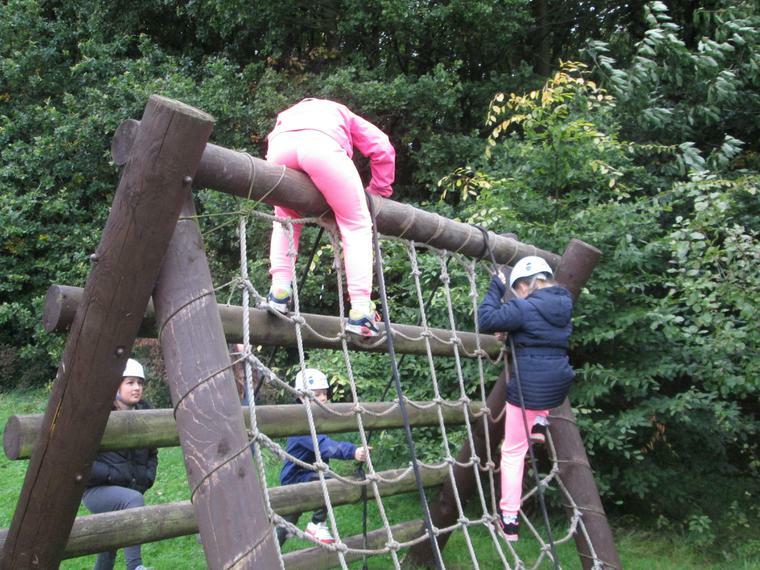 The governors found it a positive day which helped them to gain a better perspective on all the hard work which is being done by everyone at Ashfield Primary School. Thank you to everyone who supported our Book Fair last week. I really hope you enjoy reading them with your children. Because of your generosity the company have let us choose all of these books for our school library. 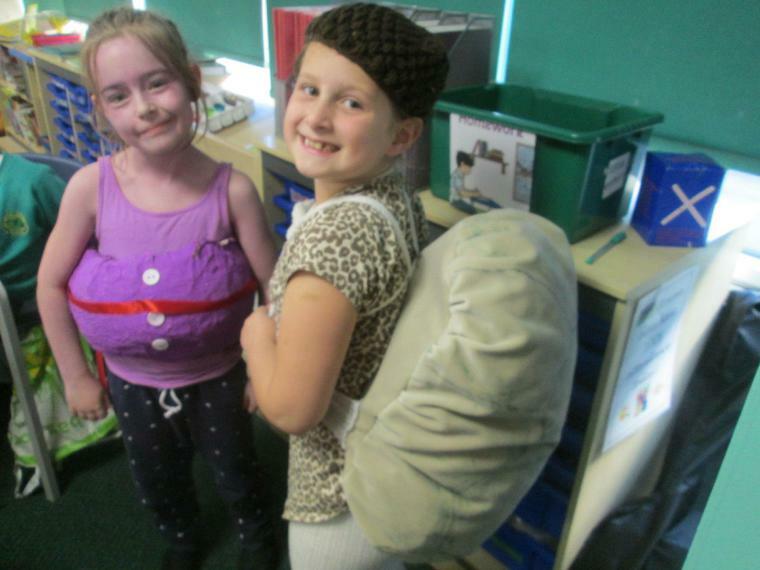 We prepared for Children in Need day on Friday by sourcing our best spotty outfits. People got competitive with our Bake Off competition for the best Pudsey themed buns. They will be sold for the charity after school - I can't wait. Mrs Featherstone and Mrs Willford drew raffle tickets for children who we noticed completing random acts of kindness during Anti bullying week. I was really pleased with the positive faces of parents, carers and children after meeting with teachers tonight. If you couldn't make your appointment, please ring and speak to your child's teacher to arrange an alternative time. 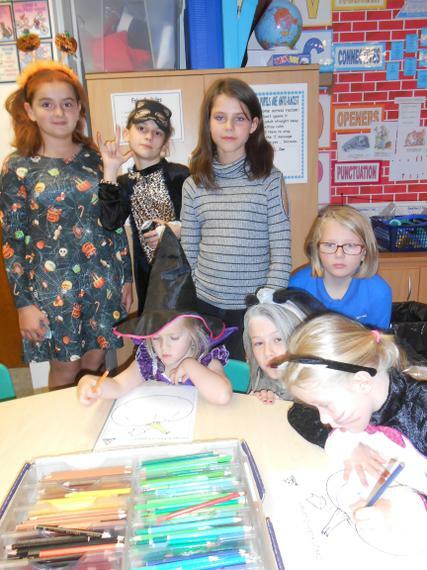 Miss Hargreaves ran a competition in the library for the children creating book covers and researching their favourite authors. 5 children will win a £5 voucher for the book fair. We've worn odd socks today as an opportunity for the children to express themselves and appreciate individuality and uniqueness. All week we will be looking at ways to prevent bullying and promote friendship. 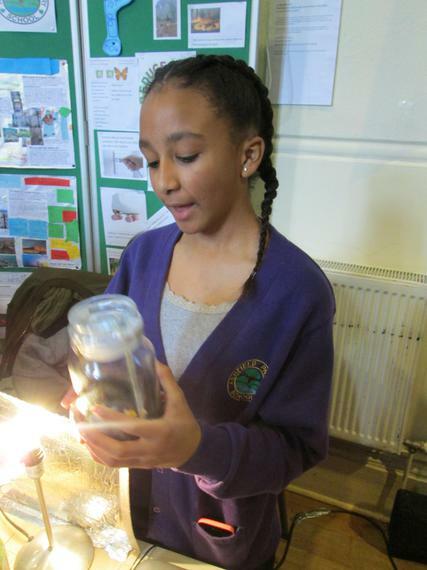 On Monday Maple Class went to Otley Courthouse for a Silly Science show. 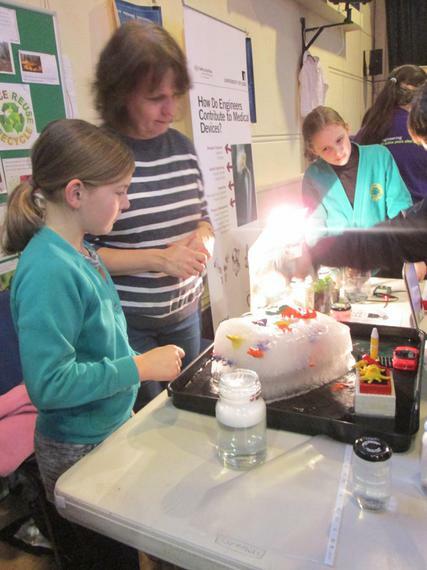 Children in Years 5 & 6 manned an Ashfield stall at the Otley Science Fair with a theme of Global Warming. 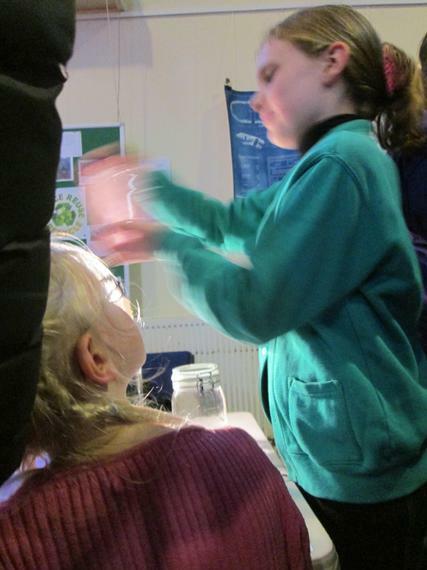 The children showed how to make a cloud in a jar, a tornado in a jar and how to make a 2 litre sub irrigated planter. 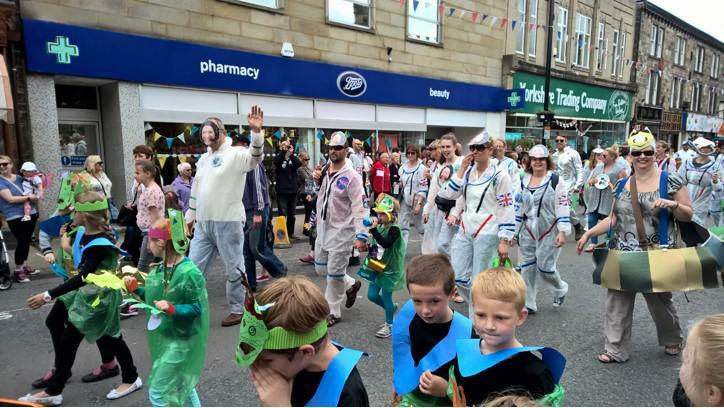 It's great to be an integral part of Otley's scientific community. 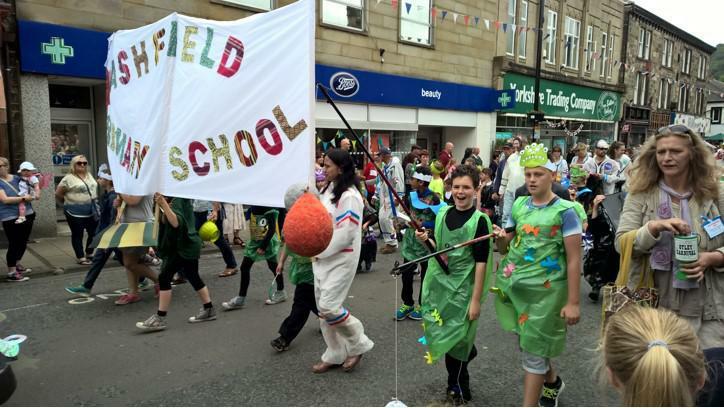 It was a great opportunity to show the Otley community how fabulous Ashfield children are. 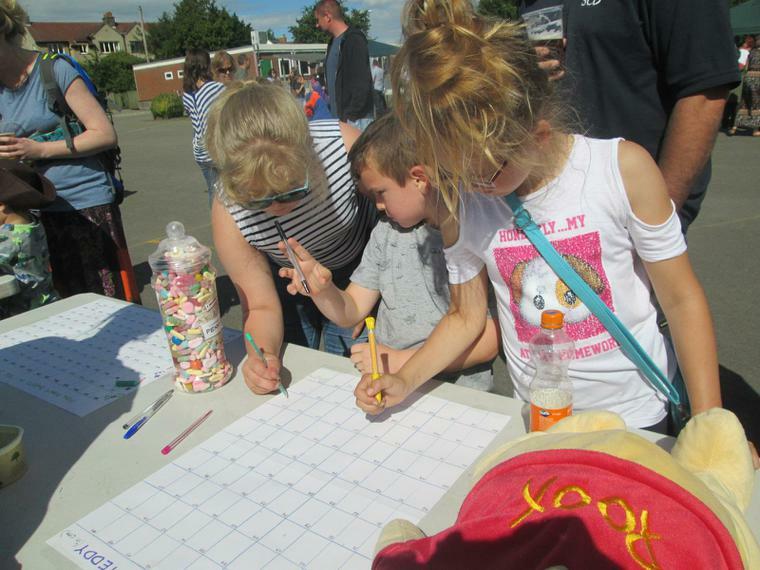 Many thanks to all who came to support our stall at the fair, the teachers who gave up their time to plan and supervise the event and especially to the children who represented us so well. 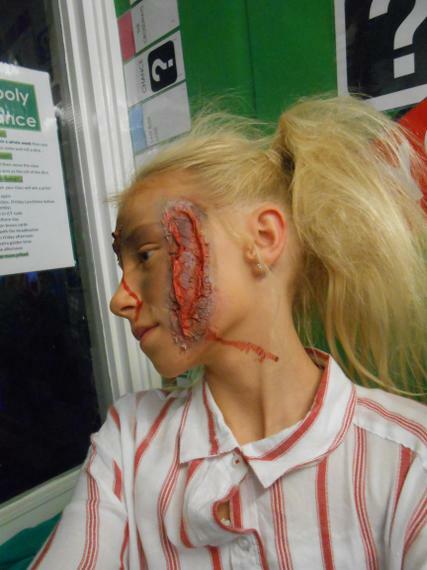 Miss Hargreaves for organising such a great event. The children really enjoyed themselves and were keen to share with me their favourite excerpts from their favourite books. Thursday 2nd November 2017 An out of this world experience! 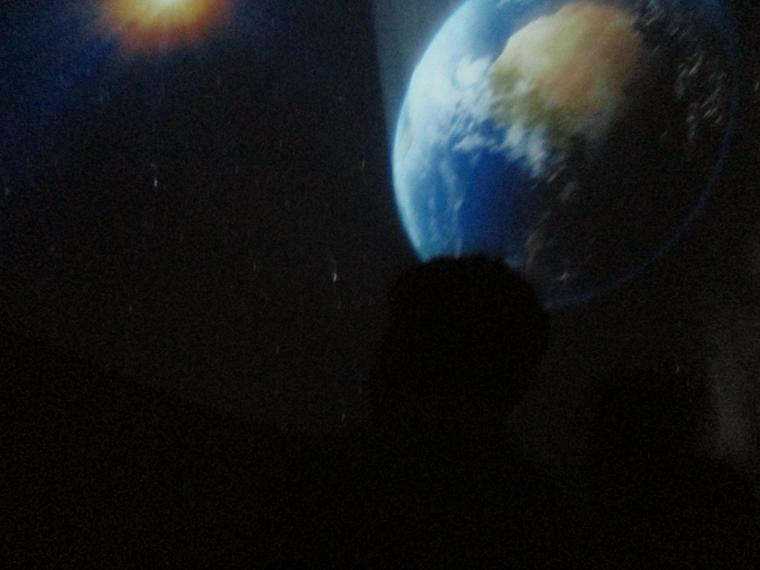 Willow, Cherry and Elm had a fantastic morning exploring the universe when visitors from Leeds University physics department brought in their amazing inflatable planetarium. 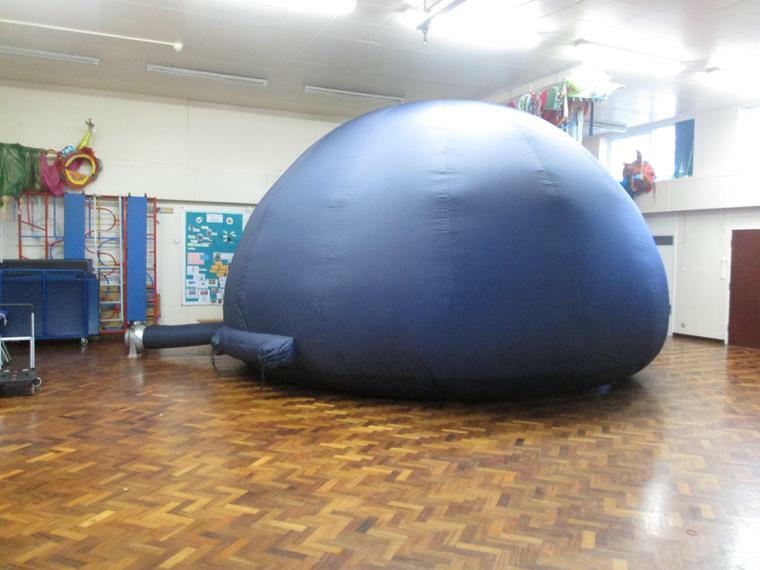 It was so big it almost filled the hall! 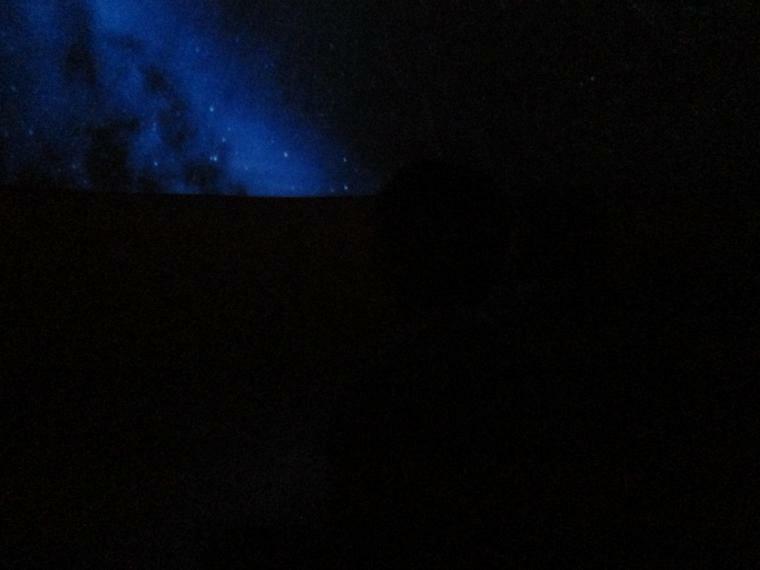 Each class took it in turn to enter the planetarium and watch and listen as images and sounds surrounded us. 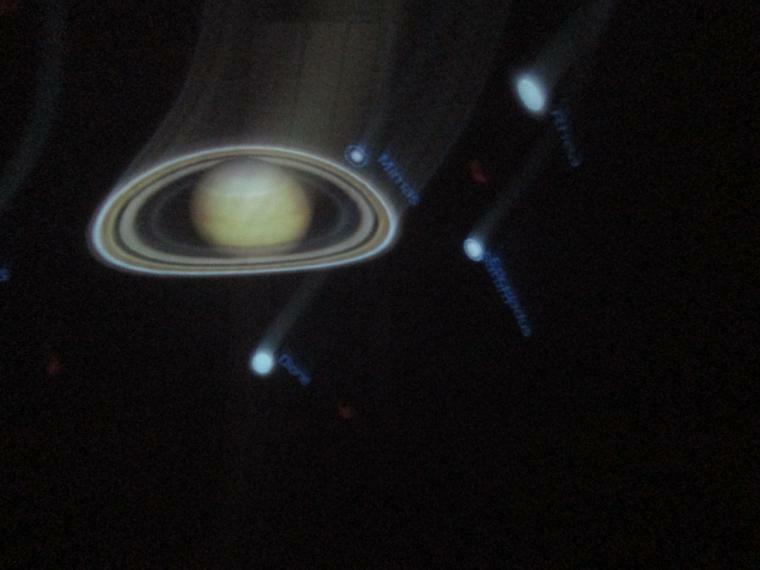 Using a special projector, the inside of the dome was used as a screen and planets and stars shot past us. 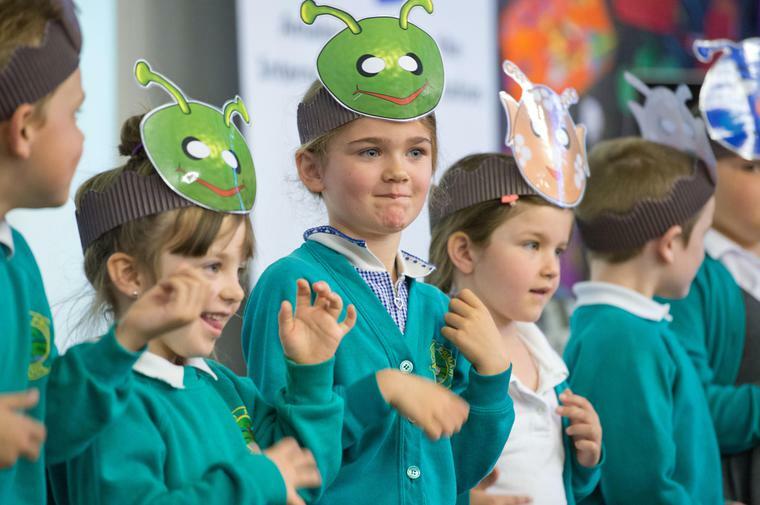 We learned about the Mars rovers, star constellations, our solar system and the search for Exoplanets - planets that could possibly support life - did you know that almost 5,000 have already been identified. 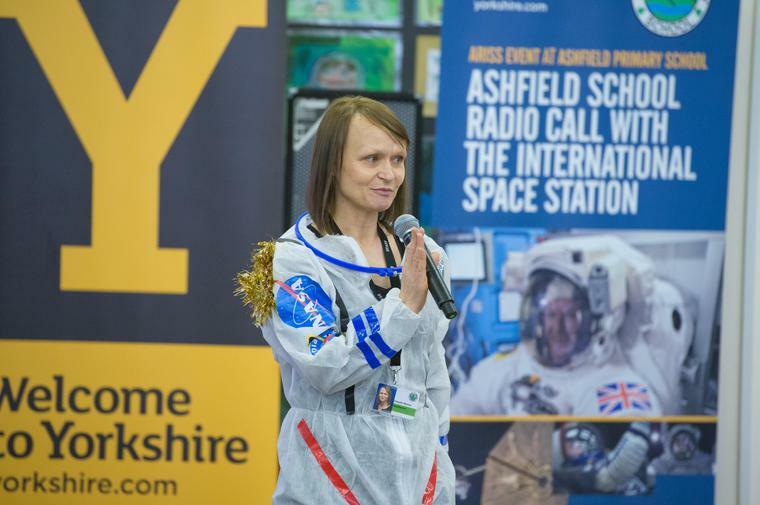 One girl in year 5 was so inspired that she now wants to work in the Astro Physics field of work, and a fantastic quote was overheard when Year 2 were in the dome ... "This is why I love coming to Ashfield!" Today we had a visit from LJ, who visited Ashfield for Health Week in the summer and was so impressed with our children, suggested a return visit. 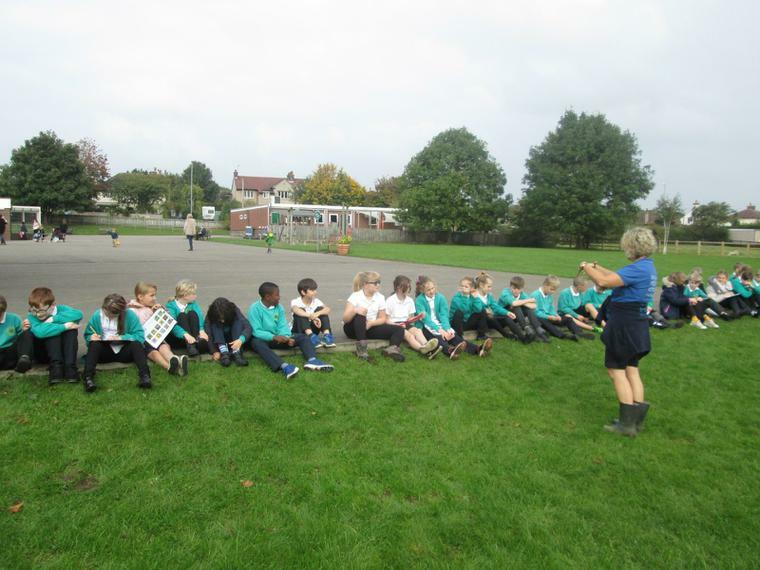 In assembly she launched a competition for The Dogs Trust. They are providing free training classes for families and their dogs across Yorkshire and as part of this initiative have commissioned a special Dog School Van. Our school has been chosen by them to name this van (the first one in the country!!) Each class is to come up with a name for it and the best one will be chosen by LJ and put somewhere on the van. When the van is delivered to Dogs Trust LJ will come to our school with a photographer so that the winning class can be photographed alongside the van that they named. 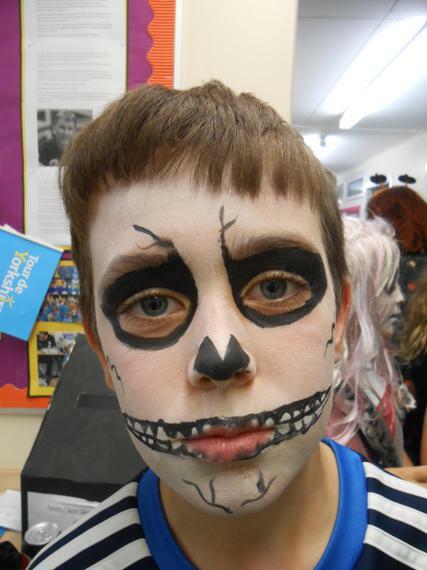 All classes have been asked to submit their entry to Mrs Booker by Friday 10th November. 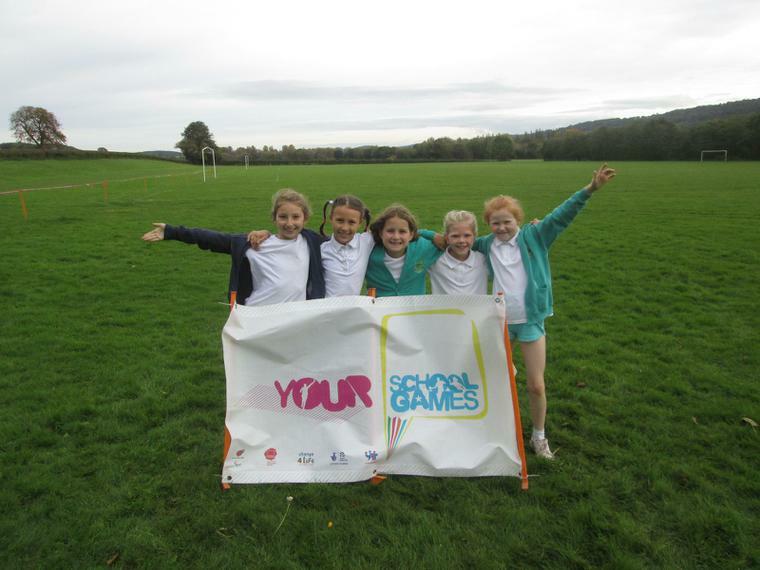 Well done to all children who competed in the inter schools event. Special congratulations go to William who came second in his category. Keep persevering Ashfield. It's great to see our stamina improving year by year. I was very proud of our children at the Harvest celebration held at Bridge Church. Their songs and stories captured the spirit of thankfulness and caring for others. Many thanks go to the parents and carers who helped us walk down safely to the church, to the many friends and family who came to celebrate with us and to Reverend McCullagh and his elders who provided such a beautiful venue for us and made us feel so welcome. Your food donations are being taken to Otley Food Bank and are gratefully received. We were lucky to host an experience day for eight Norwegian students today. They were classroom helpers for the day - wanting to learn more about teaching English. They had a great time and said what wonderful, polite and hardworking students we have at Ashfield. 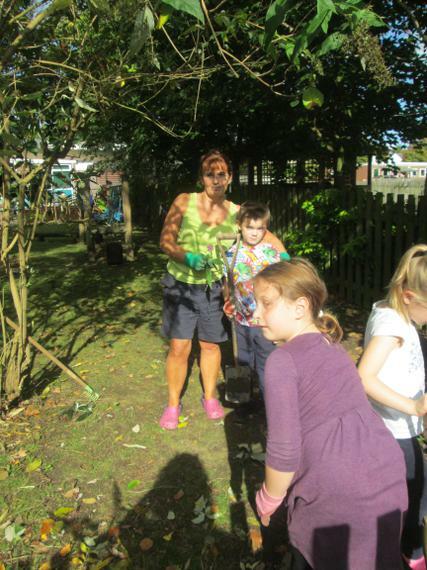 A huge thank you to all the parents and carers who came to help with our wildlife area clear up. 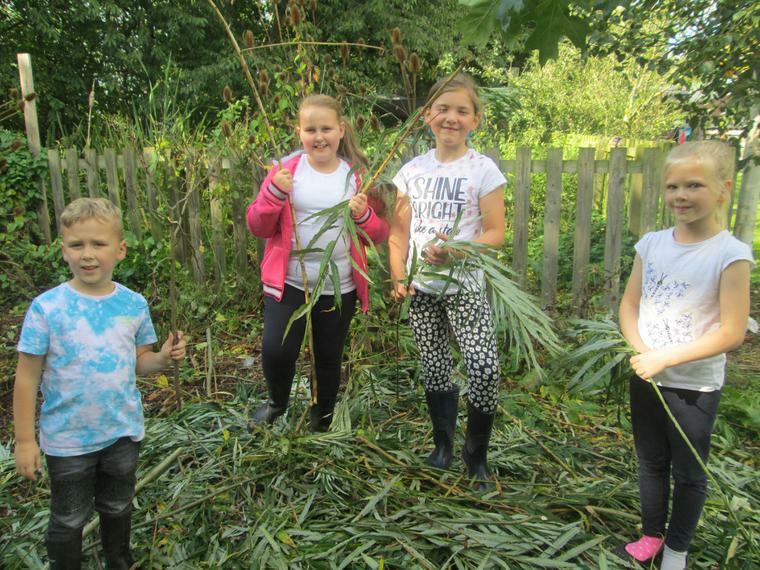 As you can see from the photographs a lot of hard work and fun went on.The children will really enjoy learning in these areas now. 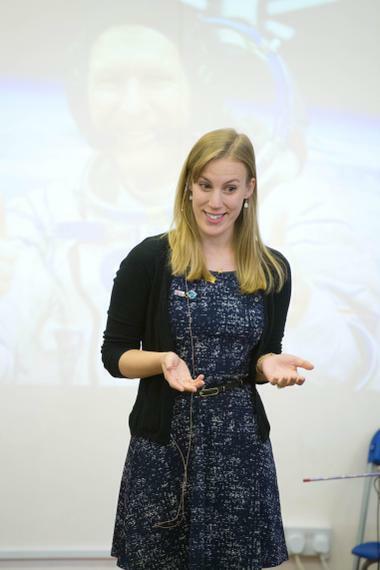 Miss Carpenter led an assembly today to inspire her pupils to even greater achievements in assembly. 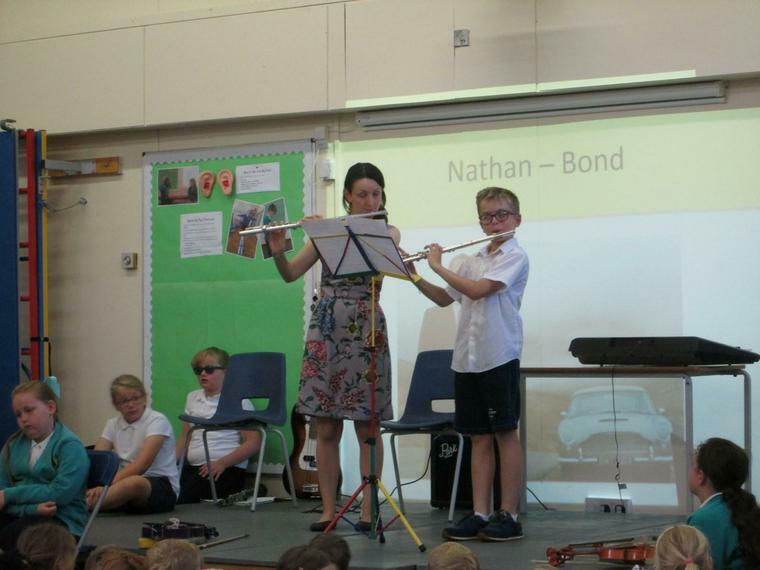 She showcased a student of hers from Prince Henry's playing the flute and taught the school a new song. encouraging others in activities that they found difficult. 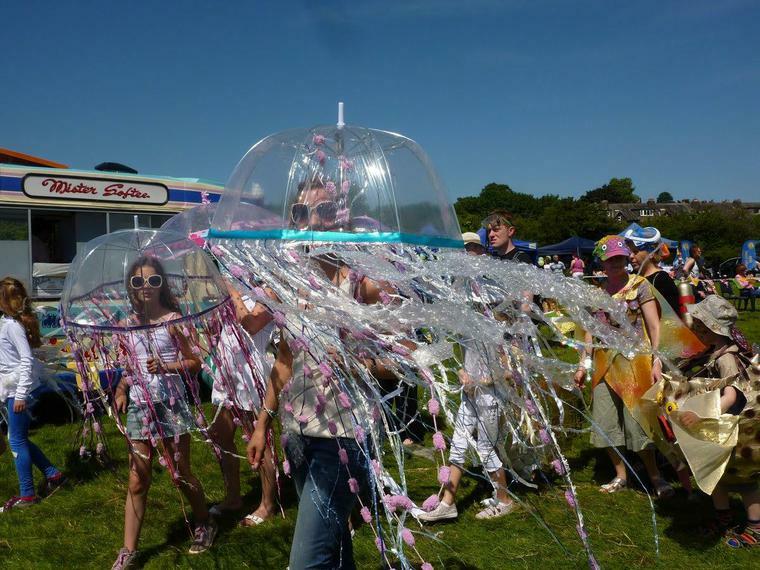 We had a whizz popping time of it today celebrating Roald Dahl's creations. 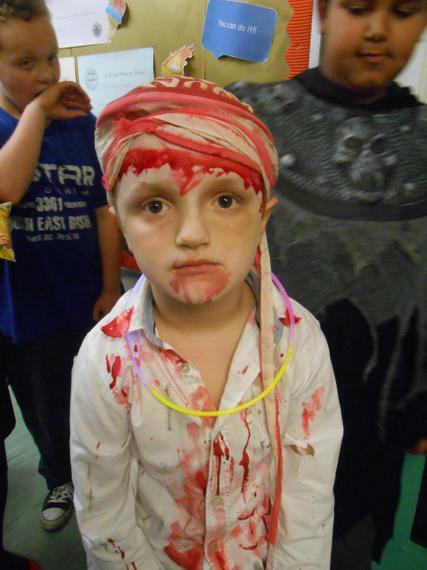 The children made a huge effort with their Dahl costumes today and had great fun with all their Dahl themed work. I hope you all found our 'Meet the Teacher' event this afternoon useful. If you didn't get the chance to say hello to your child's new teacher and would like to discuss an issue, please ring the office to book an appointment. Welcome back to school. 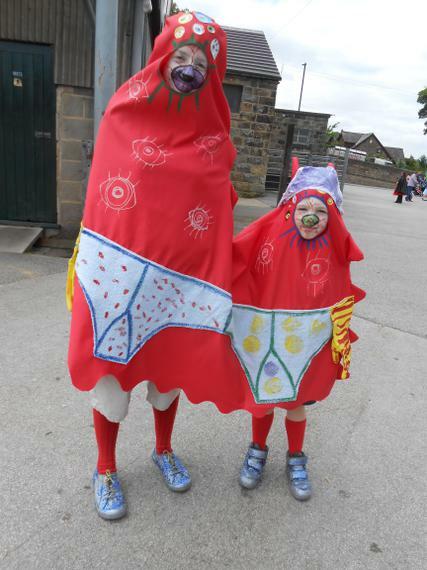 I hope you have all had super summer holidays. Please find my first newsletter. Dorraine and Bobby Watson collected the People's Choice Carnival Award on Friday 21st July 2017. This is so special to be chosen by the people of Otley. Many thanks to Dorraine and Bobby for collecting the trophy and for anyone who voted for Ashfield. This week everyone has felt very grown up. 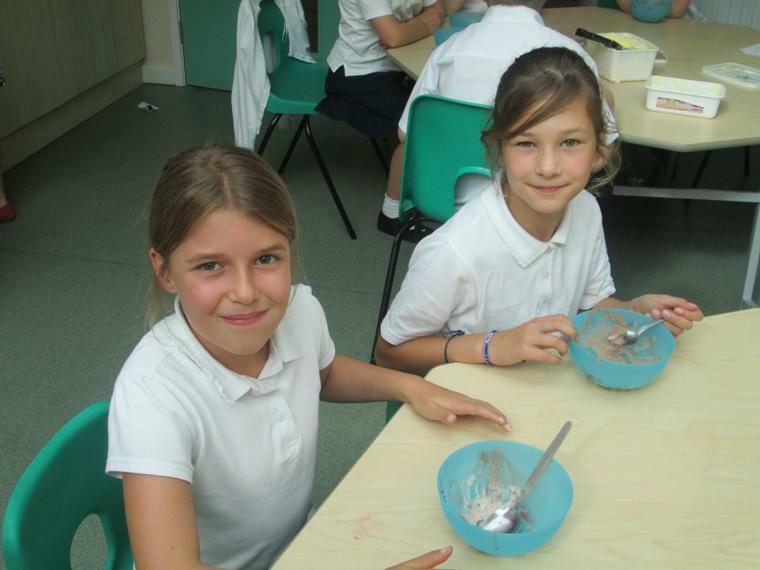 Our current Year 6 children have had a taster 3 days at Prince Henry's School. All our other classes have transitioned to their September classes. They've got to know their new teachers and tried out some work from the year above. In celebration assembly, every teacher was very proud of every member of their new class and their positive attitude to learning. The new classes voted for new school council representatives. Mrs Patel and Mrs Hind, tow of our governors came to meet them in their inaugural meeting. We had a fabulous day with Farmer James, getting to know about his farm animals and playing in the hay bales. A huge thank you to all our parent helpers. 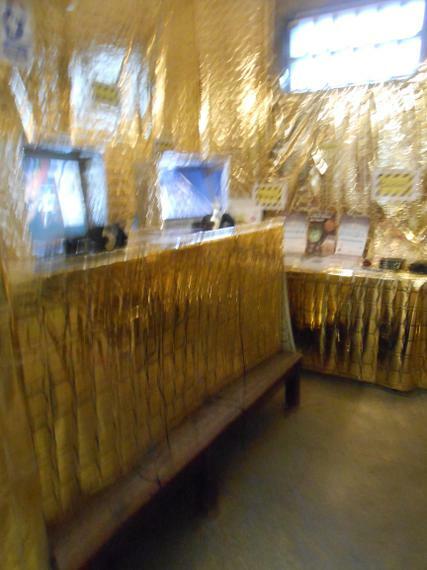 They read their Kitchen Disco books and the chose from a wide range activities that you can see in the photos. 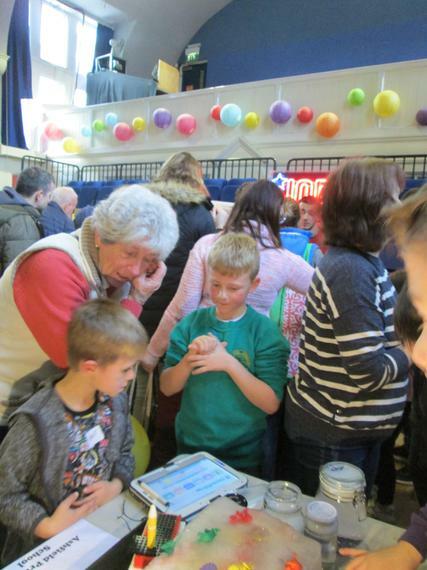 We were so pleased to see so many adults able to join us and celebrate the children's learning with us - many thanks. 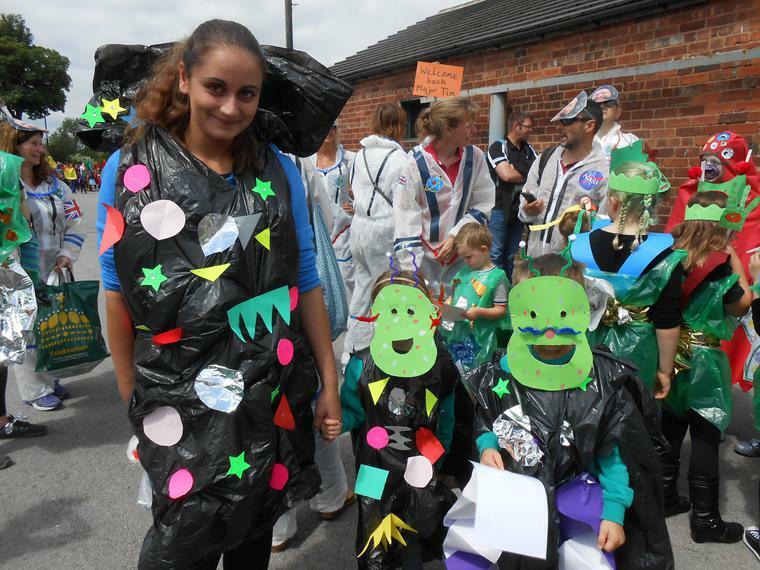 Thank you to all who took part in the carnival on Saturday and those who cheered us along at the roadside. 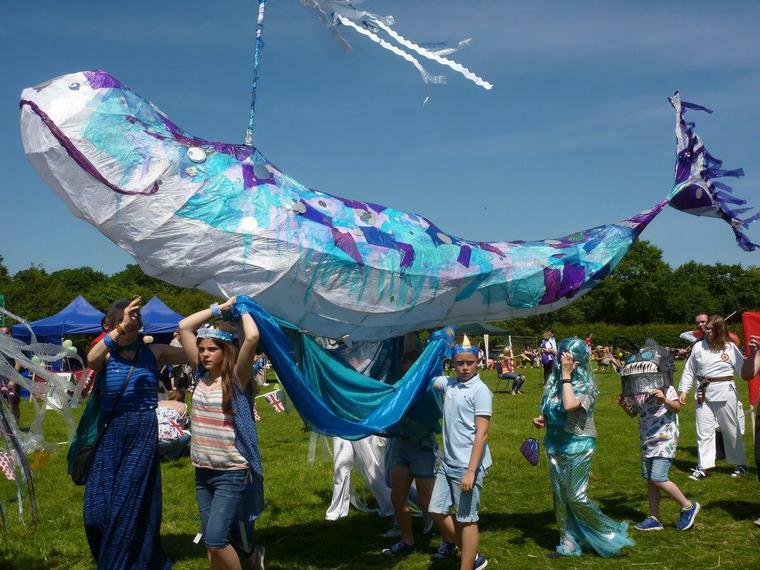 We all had a whale of a time at the carnival on Saturday. The sun shone and your children glittered. 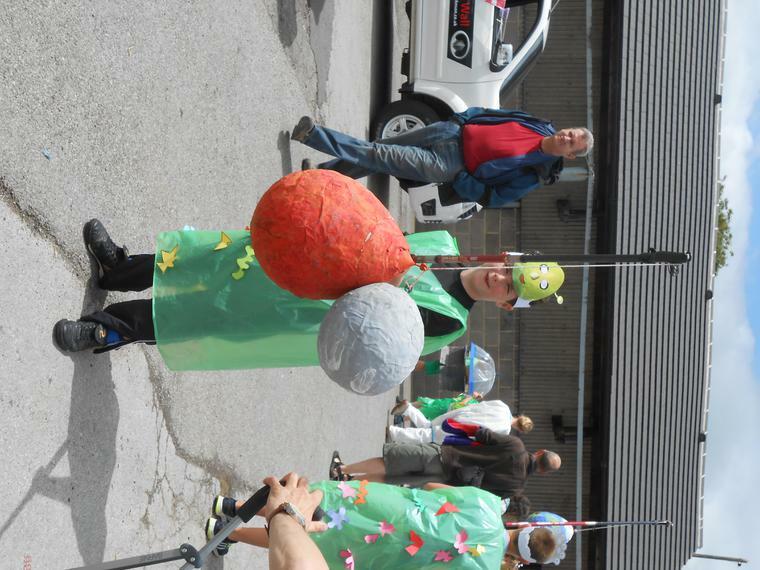 We received many complements from fellow paraders and the general public. 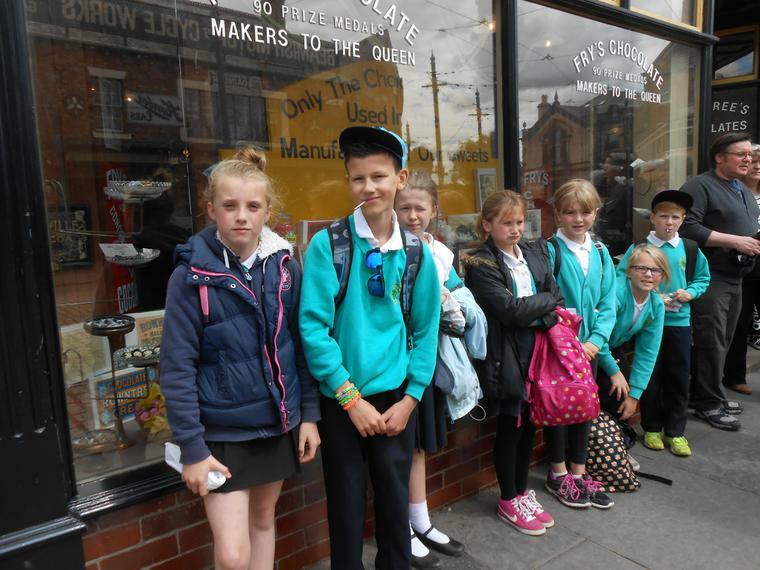 What made me most proud was the super behaviour of our children and the amount of Ashfield Community support we had. It was a real team effort which we could not have managed alone. 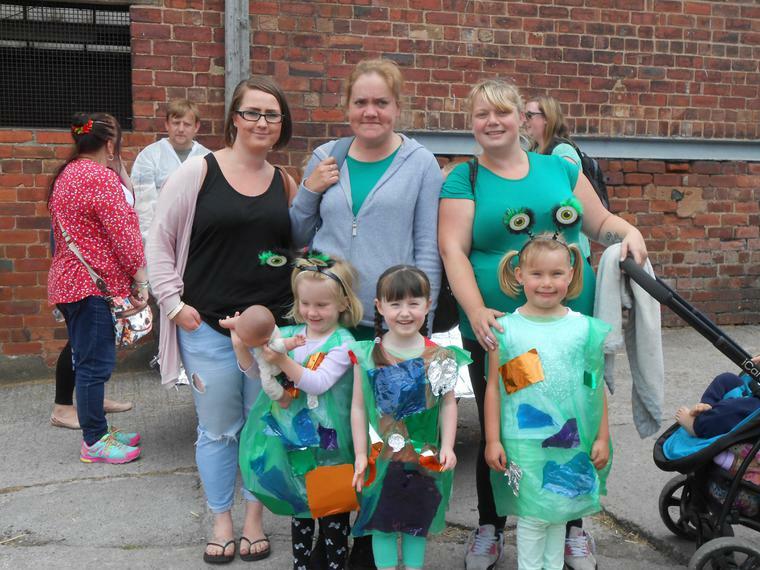 I'd like to say another thank you to those parents and carers who gave up their time to help us make costumes - especially Maz Springham, Dorraine Watson and our own Sarah Hughes. 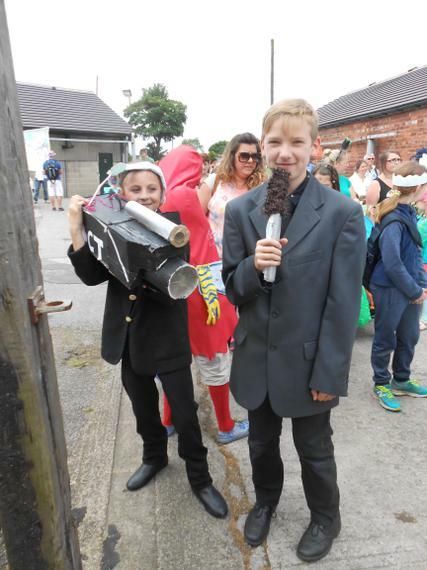 David Ricketts kindly recorded and produced this amazing video of our Carnival procession. 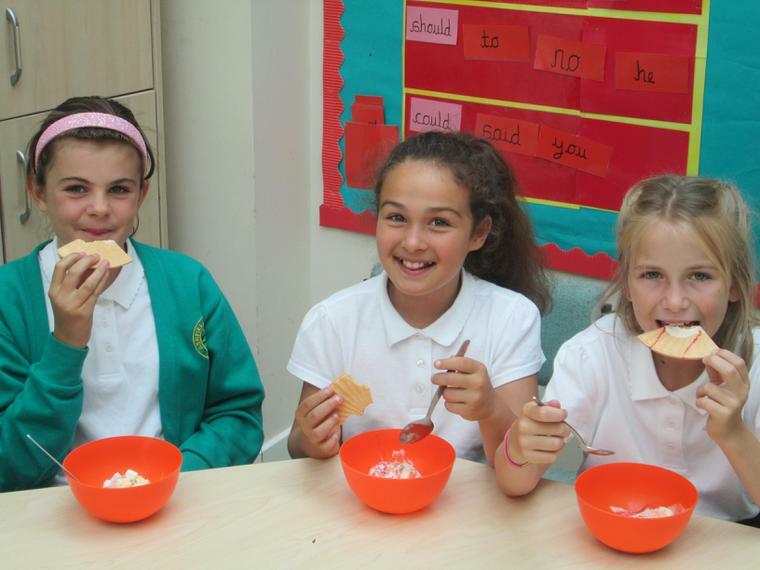 We're preparing for Health Week from 19th to 23rd June. Karate from Zetsurin Karate Club. We hope you'll join us on Monday 19th June for our Race for Life, where we'll all run a mile wearing pink and hopefully not looking too pink afterwards. Timanyane Day at Prince Henry's School led their students to help in a primary school. Our pupils loved reading to the older students. Thank you to all the PHGS students for their help. John and Teresa Lawson, Ali and Dave Ginn, Jill and Marianne Springham, Aimee Burns, Liz Simpson, Rebecca Kayley, Vickie Clayden and Paul Barrowman. 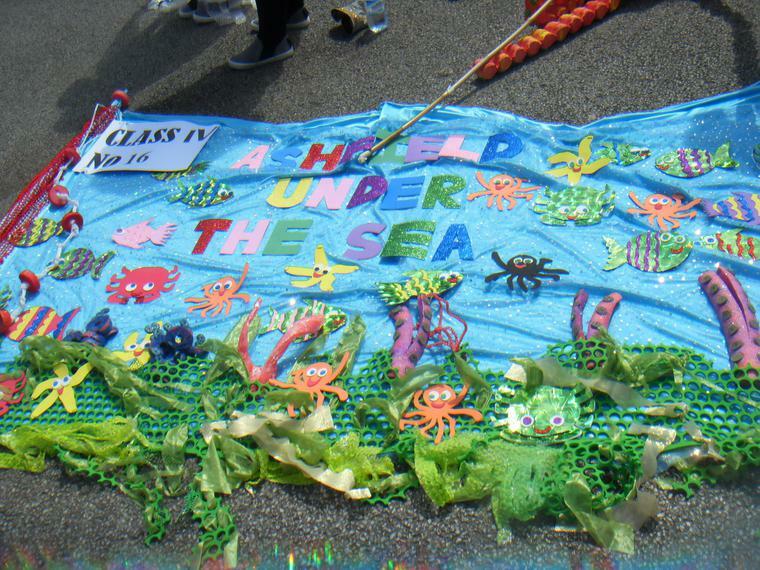 Our Carnival theme this year is 'Under the Sea.' 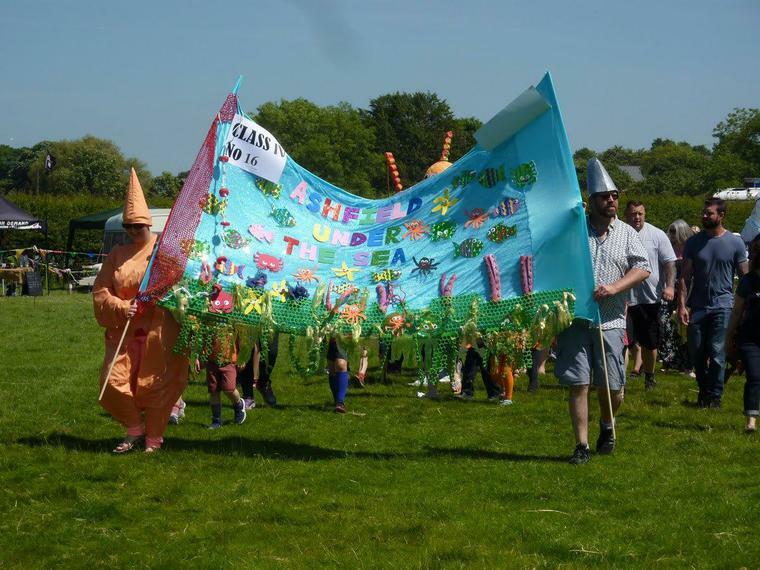 Thank you to all who have signed up to attend the parade on Saturday 17th June. On the two Fridays before Spring Bank Holiday, we are making the props and costumes in the hall. 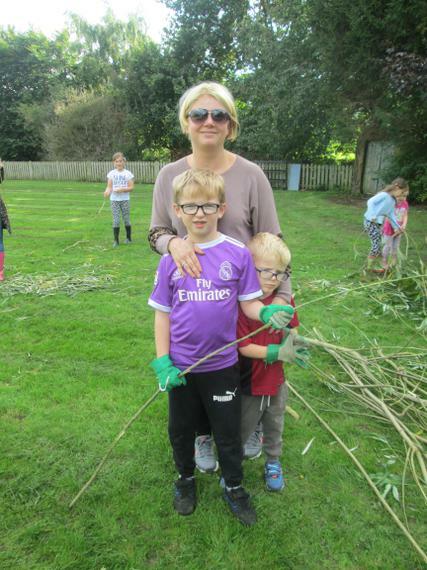 Marianne Springham (Toby's mum) will be leading our work along with our own Mrs Hughes and Dorraine Watson (Bobby's mum). If you are able to help, please let us know. Year 2 Willow children will be sitting reading and maths SAT papers this week. 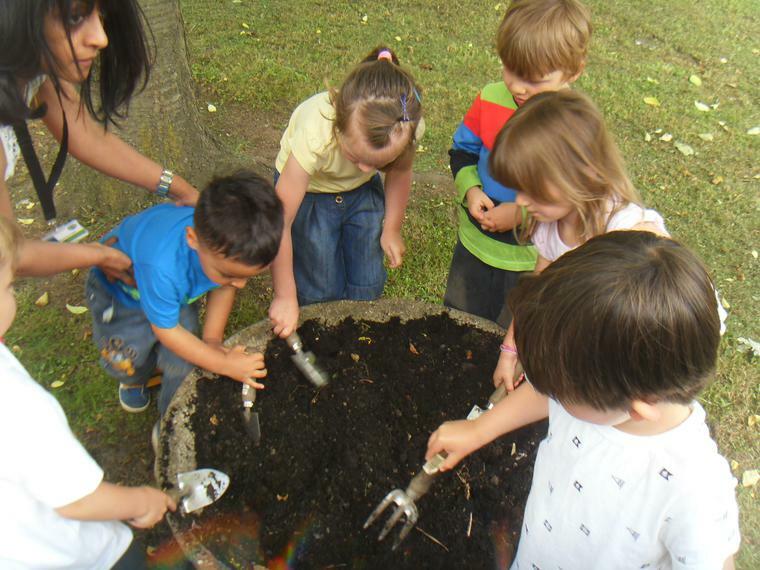 The children are used to what they will see as similar to the quizzes they have already tried. We will make sure that all your children are comfortable and relaxed. These are marked by our very own Mrs Davison. The marks are used to inform teacher assessments along with the work they have completed all year. Rowan and Larch, went on a trip to Skipton Castle to learn more about the Normans and Norman castles. 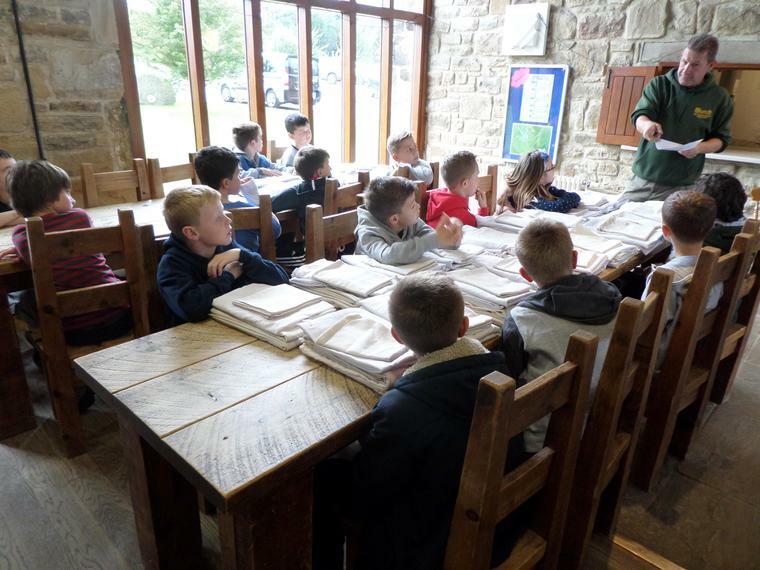 They had a fantastic guided tour in in small groups, and the guides were very knowledgeable about the secrets of the castle. 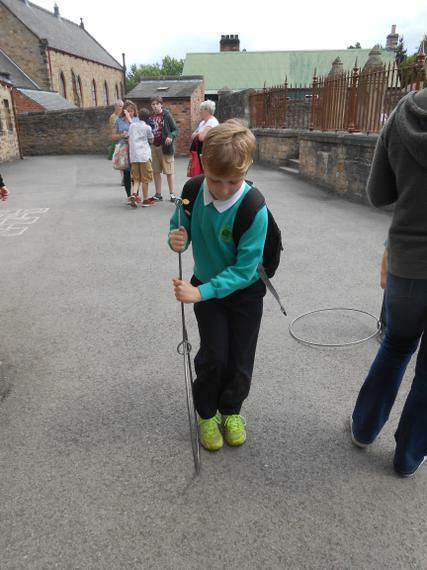 The guides were also very impressed with Year 4 pupils' own knowledge of all things Norman. The favourite rooms were the toilet (the long drop) and the banqueting hall. I am so proud of our Year 6 children this week. 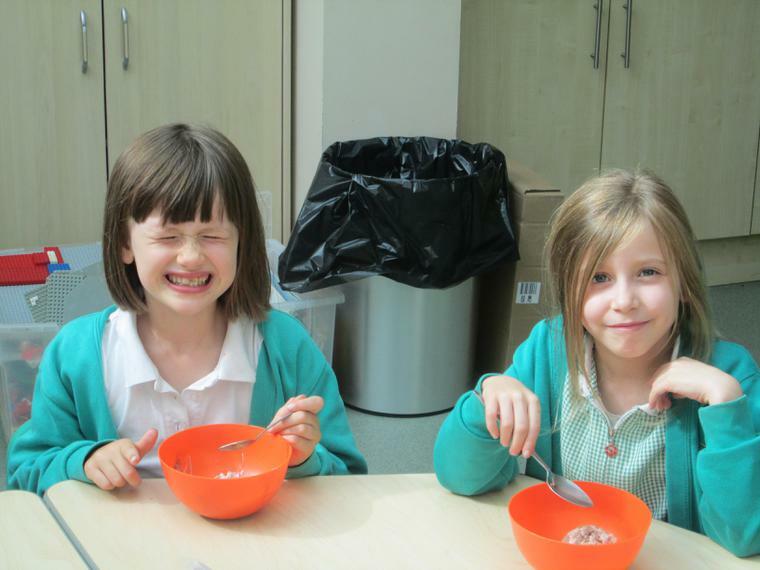 They have been sitting SATs tests this week in reading, grammar, spelling and maths. They saw the tests as a chance to show off everything they have learned. I was so impressed with their positivity, hard work and concentration. The Y6 papers are marked externally and we get the results in July. 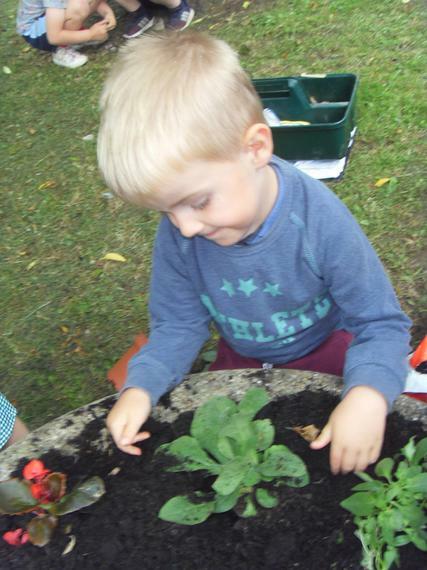 Many thanks to parents for donating cakes and plants and for giving your children some money to buy a cake or a plant or have a go at our activities. Mr Tordoff is a longer target than me! What fun to throw a soggy sponge ball! Mrs Longstaffe celebrated 25 years of working for Leeds City Council this week and was awarded a commemorative clock. We celebrated with her in our weekly celebration assembly. 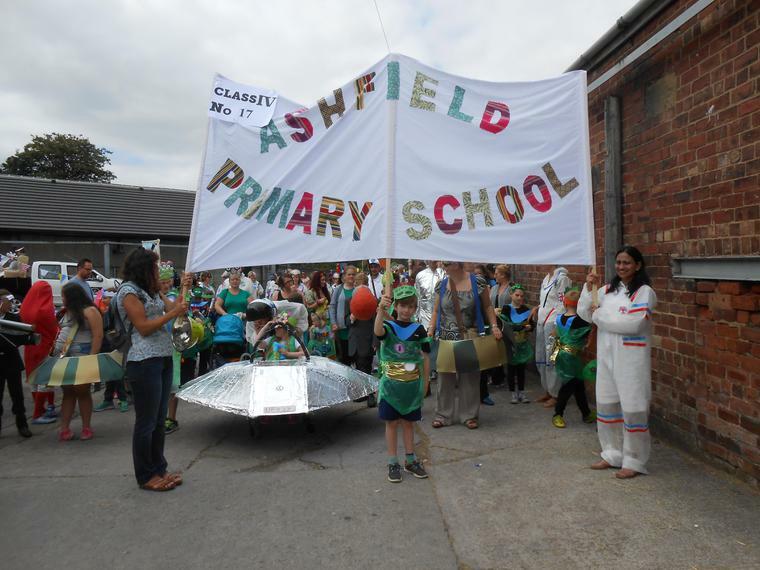 Once again, Ashfield joined in with the national competition - The big Pedal. Thank you to all children, parents and staff who cycled or scooted to school to support this effort. 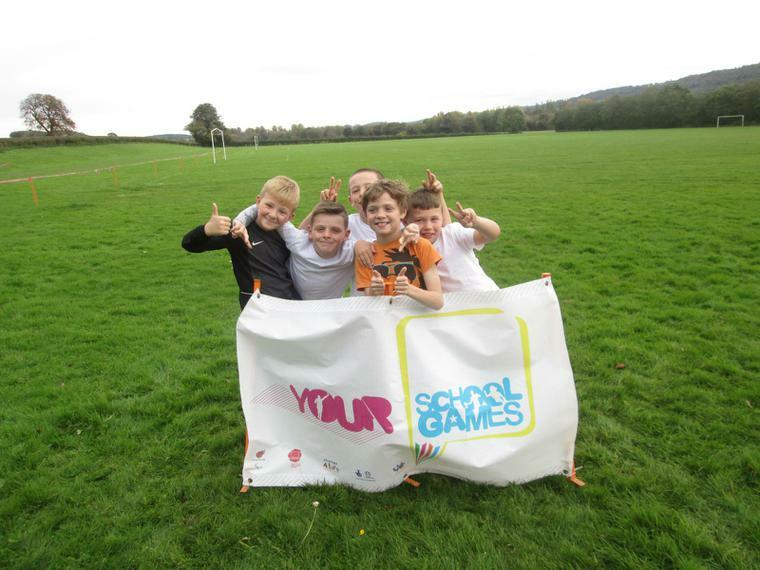 In Leeds we finished 5th out of the schools taking part. We finished 47th in Yorkshire, with a score of 31.94% making the journey by scooter and/or bike. I was very proud of Ashfield orchestra and choir last night as they performed on the stage of Yeadon Town Hall with choirs from the other schools in Otley Pool and Bramhope. 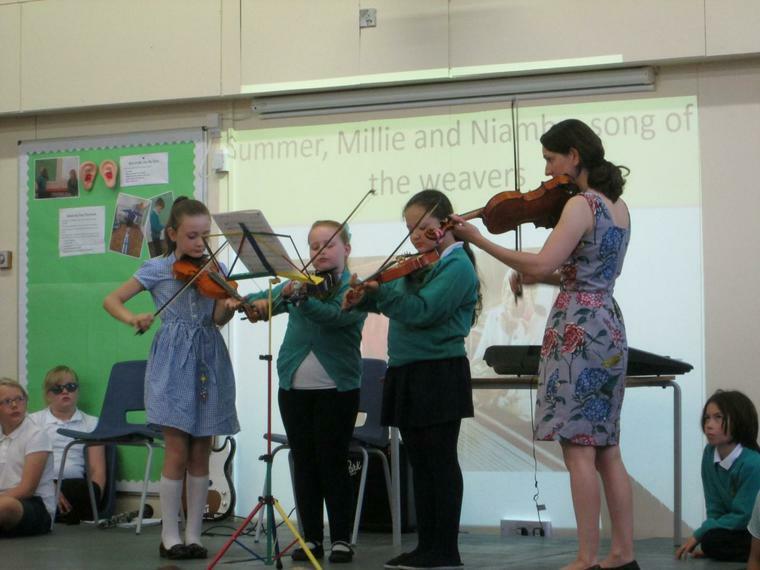 I would like to thank the children for their hard work and commitment in rehearsing. 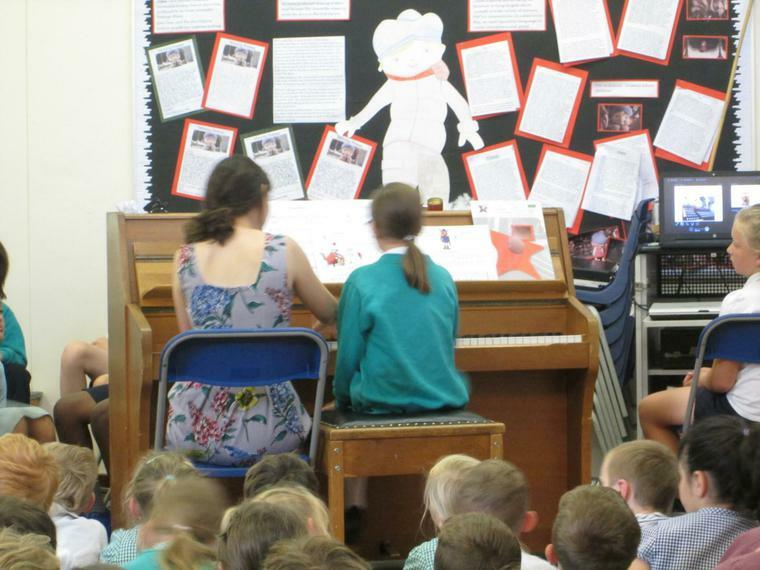 I would also like to thank Miss Carpenter, Mrs Whitehead Mrs Hilton and Mrs Hey for rehearsing with the children. A final thank you goes to all the Ashfield adults who supported our children. It was great to see you there. It was great to see so many of you yesterday at parent consultation. I really appreciated the time and effort you put in to completing our parent questionnaire. I'm currently analysing it and I will let you know the results very soon. 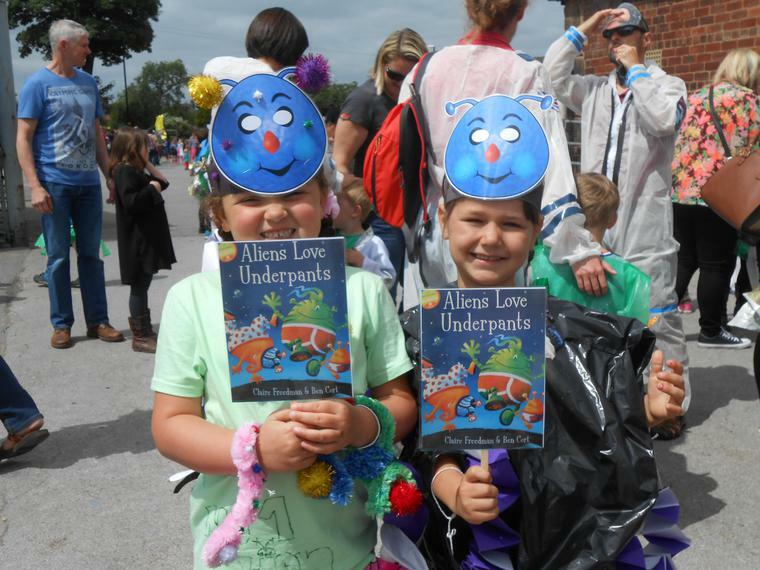 Friends of Ashfield have organised a Big Night In to celebrate World Book Day. It's a family event, where parents have been invited to join their children to watch a special screening of The BFG. Hot dogs and other goodies will be on sale. Eden Ballentyne, storyteller extraordinaire, joined Ashfield to celebrate World Book Day today. He started off with an assembly, telling the tale of a knight and other characters as they joined him on his quest. The children are all having storytelling workshops with him today as well. Today the whole school celebrated diversity with philosophical discussion through stories and art. Children in Maple and Acorn classes have looked at identity through the story of Elmer the Elephant - discussing why Elmer wanted to look like the other elephants. Rowan and Larch have read the story 'The Colour of Home' and discussed the plight of refugees. Elm have researched civil rights and racial and gender equality through the life of Rosa Parks. Oak have discussed equality and human rights. It was lovely to see so many children and parents enjoying our Big Book Breakfast this morning. I can't think of a better way to start the morning - a healthy breakfast and a good book! Waitrose kindly donated the breakfast and Miss Hargreaves organised our library books for the children and their adults to share. We've all agreed that we should make this a recurring event. We'll try to get all the Otley supermarkets to support us. 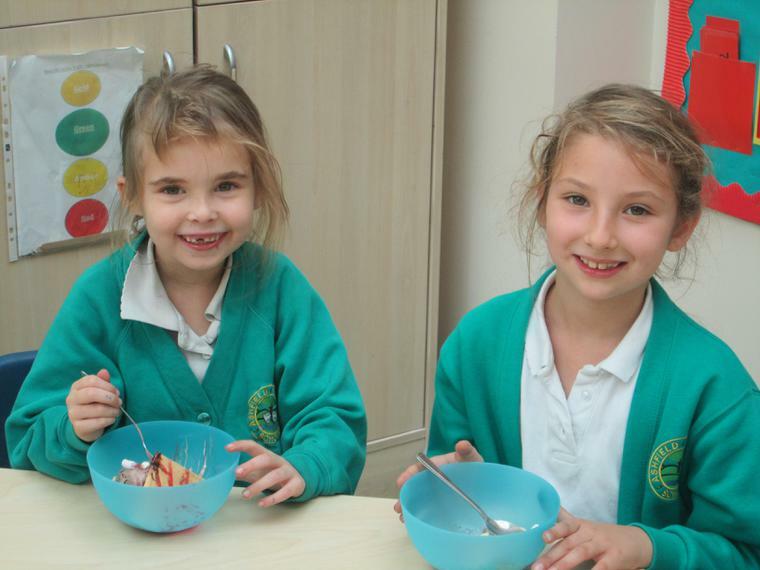 The celebrations continue with stir fries in Early Years. To mark Safer Internet Day on 7th February our children in Years 1 to 6 produced an assembly to share their knowledge with parents. Mr Patel and Mr Ross finished this off with a workshop to help parents with controls on their children's devices. 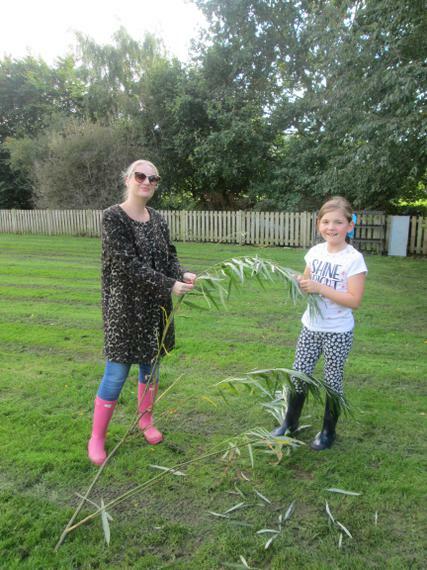 Thank you to all the children teachers and parents who were involved. 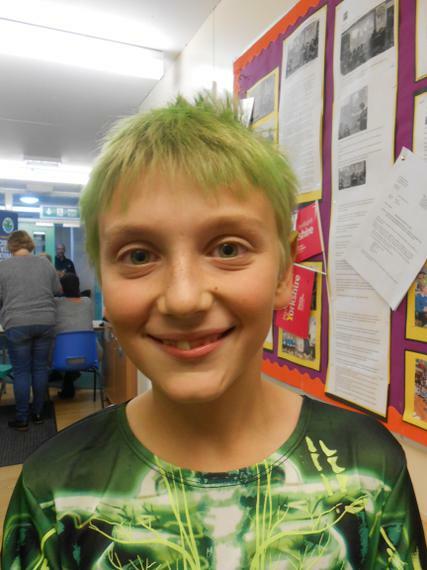 We were amazed when Mandy Young, from the NSPCC, announced in assembly that Ashfield pupils had raise £1792.76 from their spellathon. A HUGE thank you all involved for their generosity. 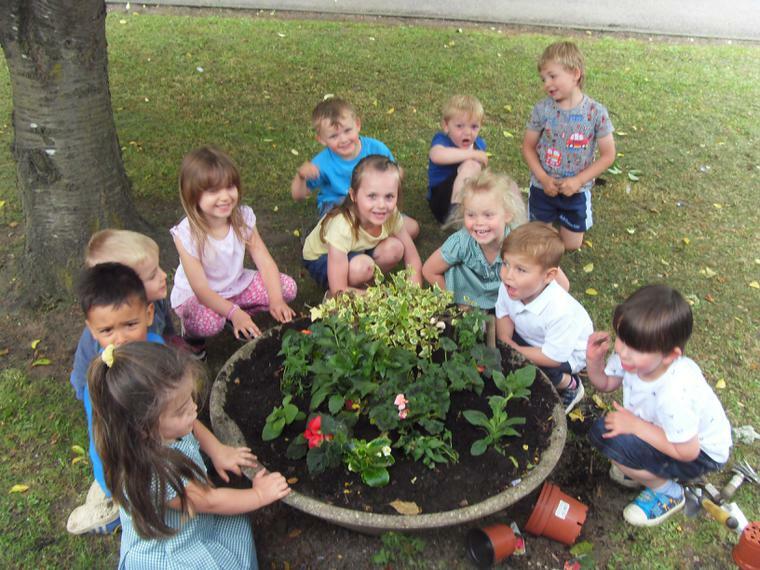 You can see a picture of with some of our children showing the amount raised. A few late donations raised our total even more. Elm Class and Silver Birch Class had the biggest percentage of children participating so they received an extra certificate. 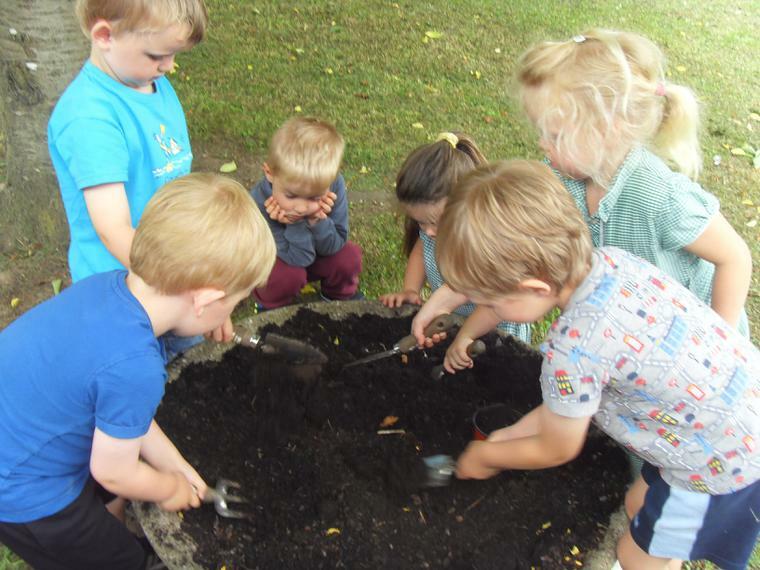 I have really enjoyed working in your school over the past few weeks: the teachers and staff have all been really welcoming and encouraging, the office staff really helpful and the children have been great, and as if that is not enough, you raised a fantastic amount of money for us! 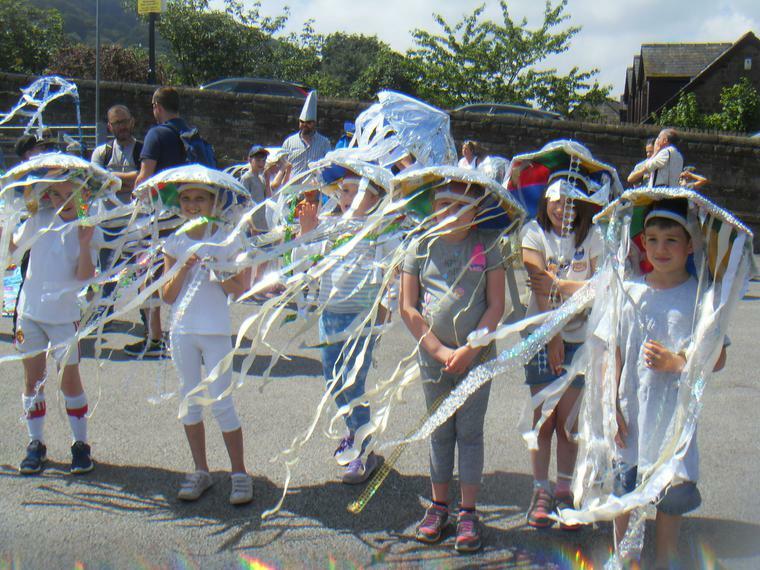 £1792.77 and 40% of the children took part! I just wanted to say a massive thank you for your support. Without supporters like you, we would not be able to do the work we do, so thank you so much! We've had a safeguarding audit from Leeds Early Safeguarding team. They were very impressed with your children and how well they understood what to do if they had a problem.In assembly this week we've been looking at how we stay safe in school. We gathered ideas from children and turned them into a display. 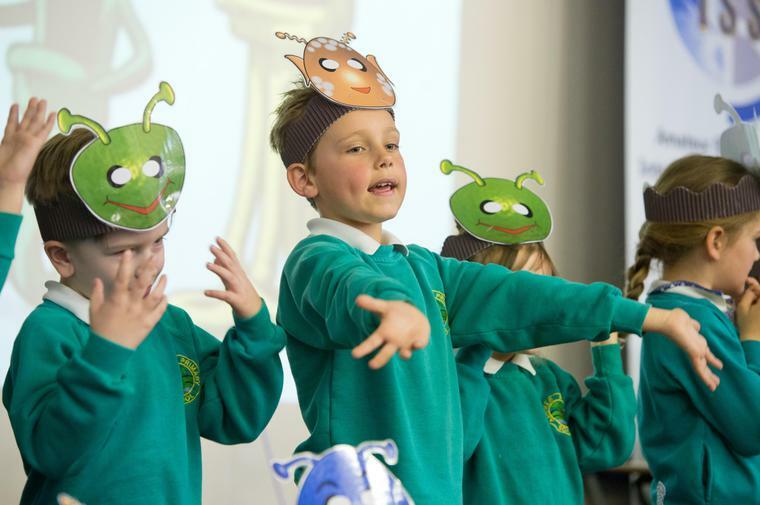 The NSPCC have delivered assemblies for us in Early Years, KS1 and KS2, showing the children how to keep safe. 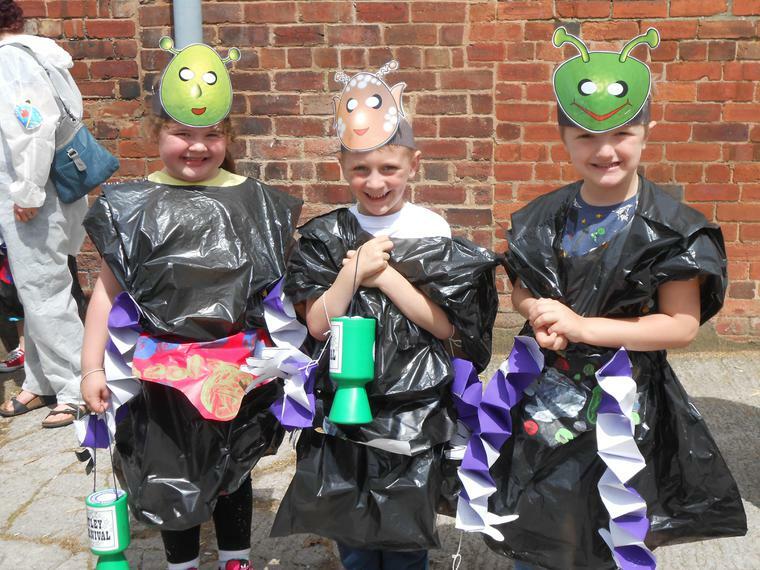 In return we have volunteered to complete a sponsored spellathon with money raised going to support Childline. 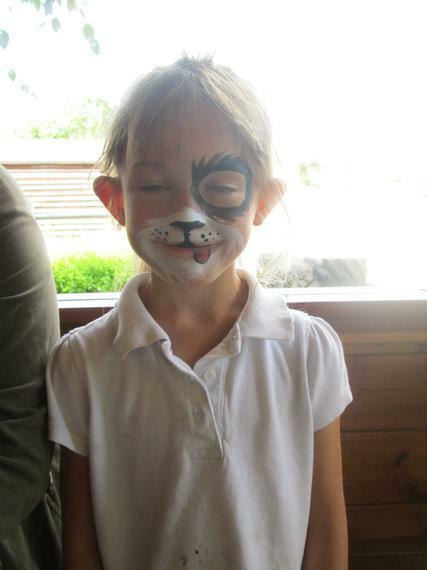 Thank you for your support in helping your child with spellings or to raise any money with sponsors. Happy New Year. I hope you and your family have a great 2017. The children have settled back to school well after the Christmas break. Thank you for your cards and Christmas wishes. Please have a look at your child's curriculum letters for their class. You will find out what they are going to learn this term and what events will be happening. 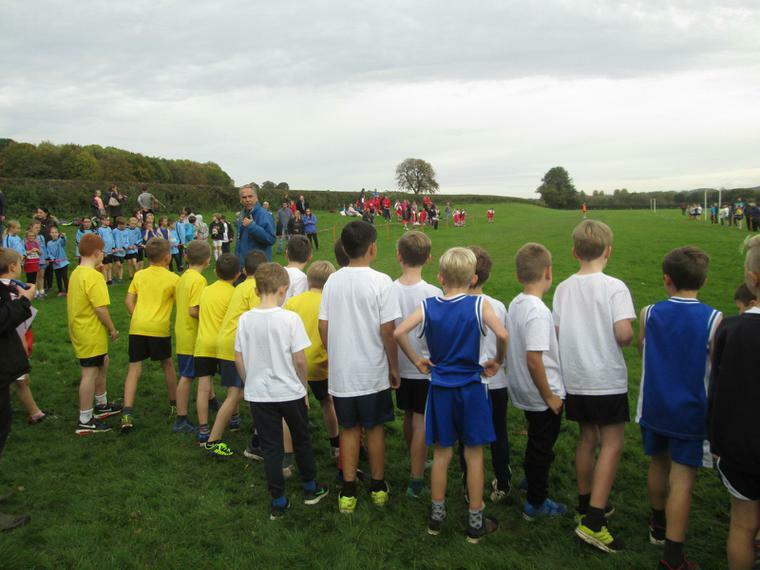 You can also find my Headteacher's newsletter with a summary of events last half term and a flavour of what to expect this half term. 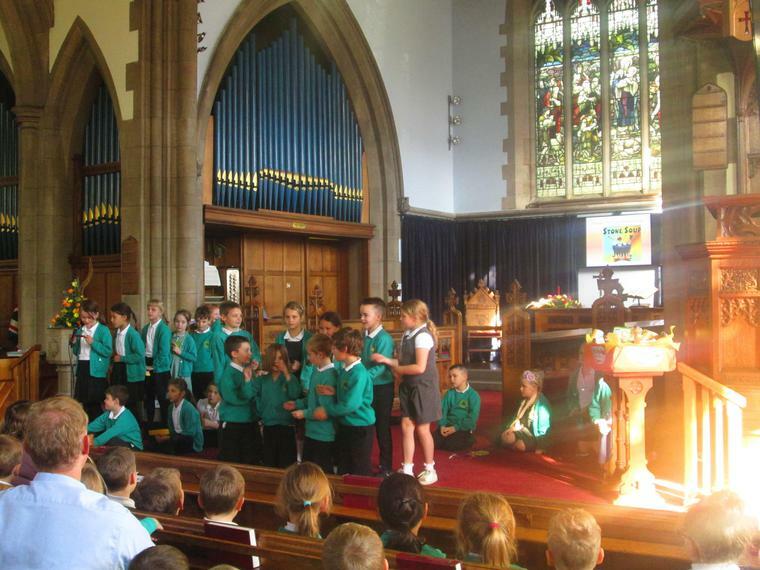 KS1 children led our annual Christingle service at Bridge Church really well. 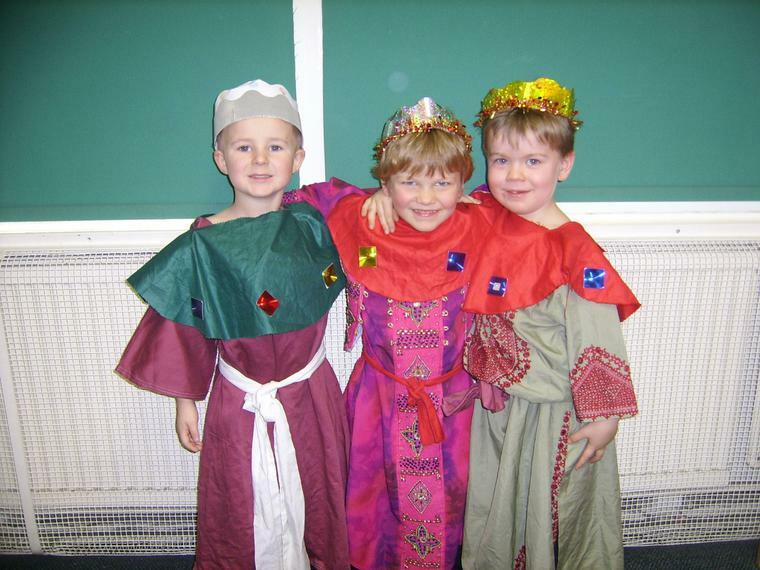 They told the traditional nativity story with narration, singing and acting. The church was lit up with Christingle oranges - a really magical atmosphere to start our Christmas holidays. Thanks you to all our parents and supporters who joined us in the celebrations. It was lovely to see the church so full. 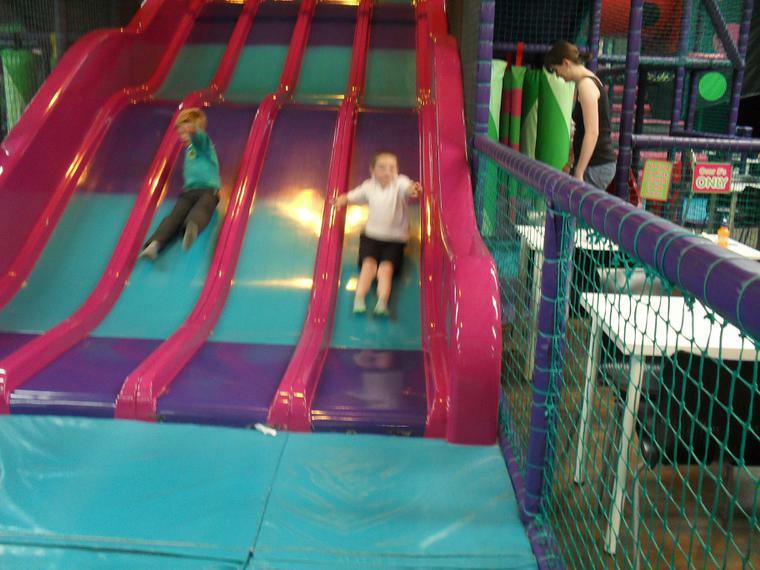 KS2 had a great day on Tuesday 13th December. 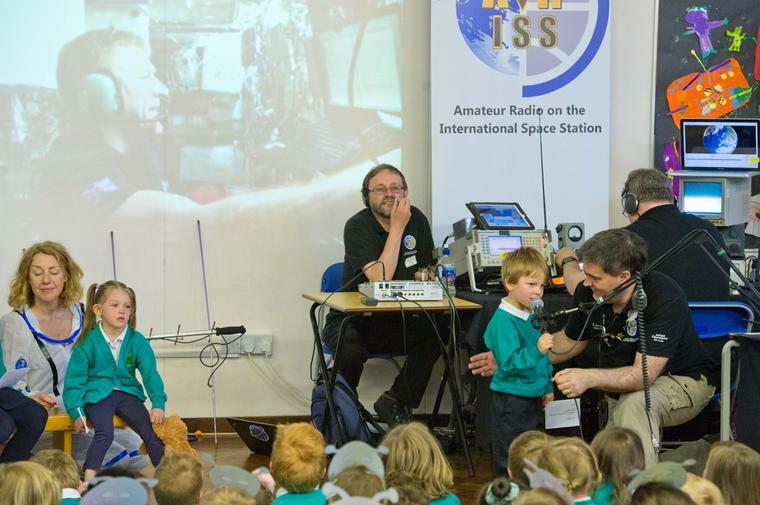 Otley Amateur Radio Society ran a radio station from school as part of the YOTA (Youths on the Air) month run by the Radio Society of Great Britain. We had a special ‘call sign’ - GB16YOTA, a unique identifier only available for school for that day. 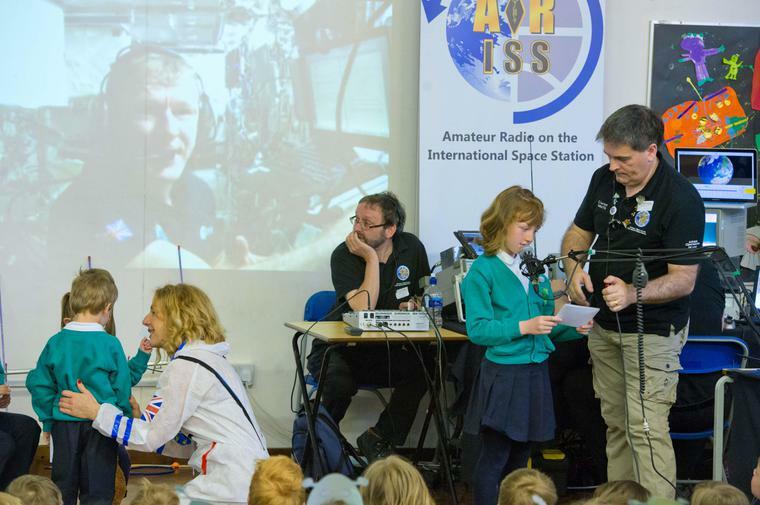 KS2 pupils used High Frequency radios and managed to make contacts in the UK, Sweden , Belgium ,Ireland and the Netherlands with almost 50 pupils speaking to radio operators overseas. 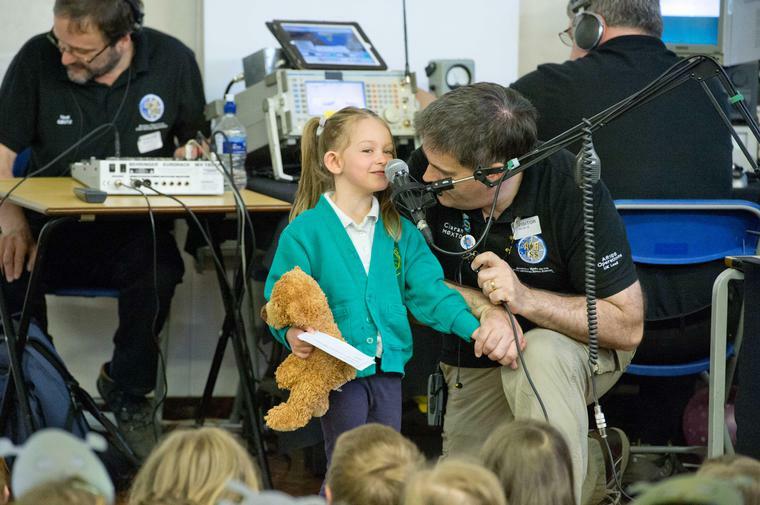 Using handheld radios, they also managed some contacts in Bradford and Otley. 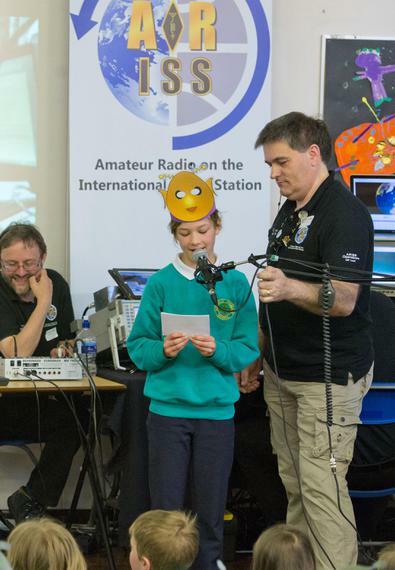 In addition to radio work, pupils also started to learn Morse Code, spelling their name using a morse code key, and cracking codes on computers. 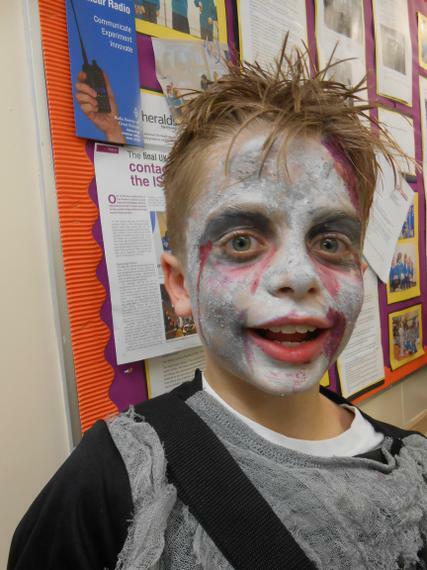 KS2 children gave a super performance on Thursday afternoon and evening. Oak Class wrote letters to Santa from the point of view of fairy tale characters. 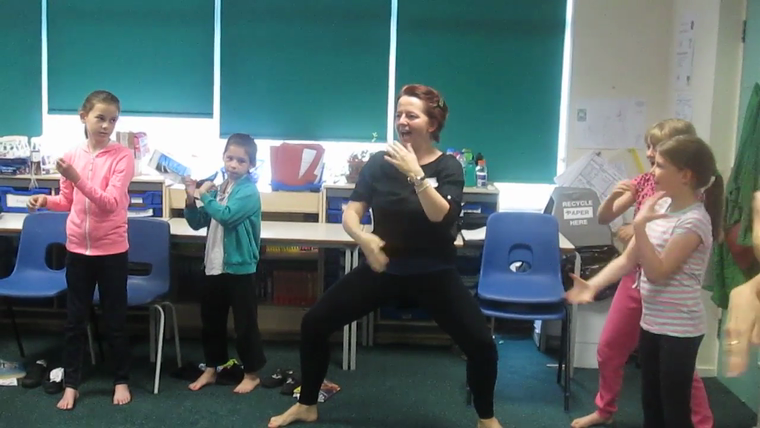 They then dramatised their favourites for us to see. 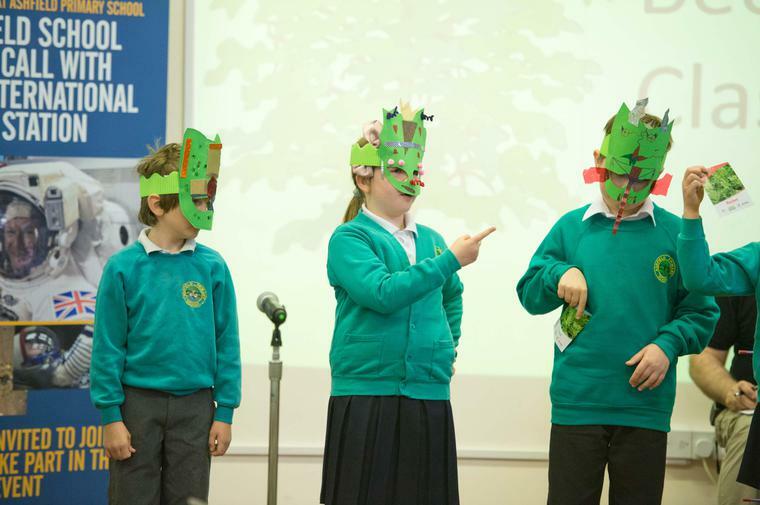 Elm and Beech teamed up for a rendition of 'T'was the Night Before Christmas.' It started with a Yorkshire dialect section. There were sugar plum dancers, prancing reindeers and a twerking Santa. Rowan Class gave us a play featuring a grumpy inn keeper who couldn't get any sleep. Larch Class sang us some carols and told us a history of how they became so popular. Many thanks to the staff and children who worked hard to give us such an enjoyable performance. 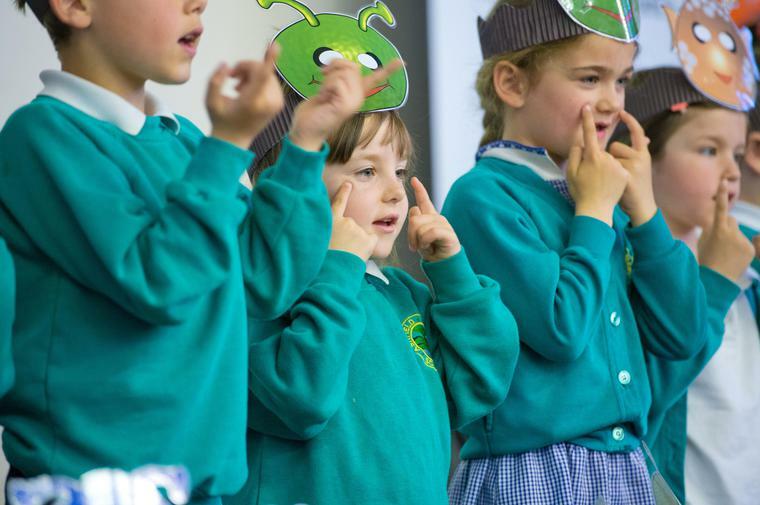 Maple Class had their audience mesmerised last Wednesday. Their singing and acting was superb and their taped narration was really clear and of course they looked really cute. To celebrate the run up to Christmas this year I have have made a festive storybook corner. Please feel free to stop and enjoy a book with your child / children. I've left some of the bedtime story question leaflets for ideas as you read. Why not ask Santa for a book in your stocking this year. Remember a book is a gift you can open again and again. Friday 16th December Christmas dinner and Christmas jumper day. Parties will be over the week - your child's class will let you know the details. We had a great time at our bedtime stories parent workshops. Thank you so much to the parents who came to support this event. The children were able to come to school in pajamas - no snoozing took place though as the children worked hard all day. We had plenty of leaflets to give out with suggestions for questions to ask while you and your child share a story at home. If you missed this event there will be more later in the year. We are also preparing a Christmas reading display for the entrance with questioning tips to take home and a variety of super Christmas book suggestions for you and your children. Nine of our governors joined us for a day in Ashfield today. They spent the day attached to a class to see how the school feels when it is full of it's most important people - your children! They joined in lessons, asked our children many questions, helped out at play time and lunchtime and then joined me for a review after school. 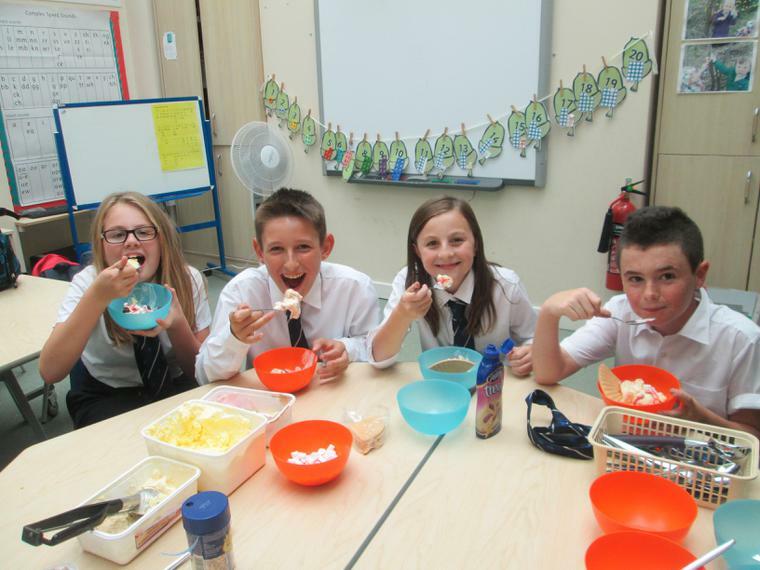 I saw how positive rewards / reinforcement meant excellent pupil engagement throughout the day. Children are aware of their targets and could understand how marking, editing and correcting worked. They used the working walls to aid independence. 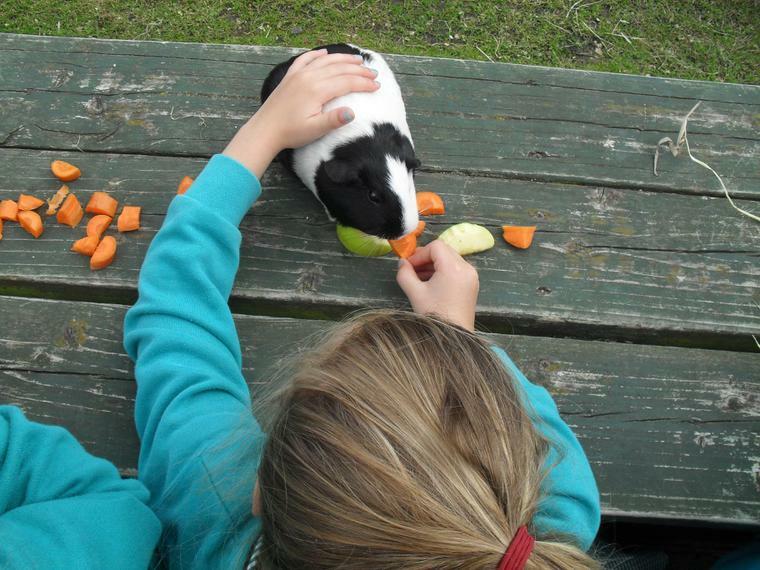 Experienced staff had positive relationships with children. 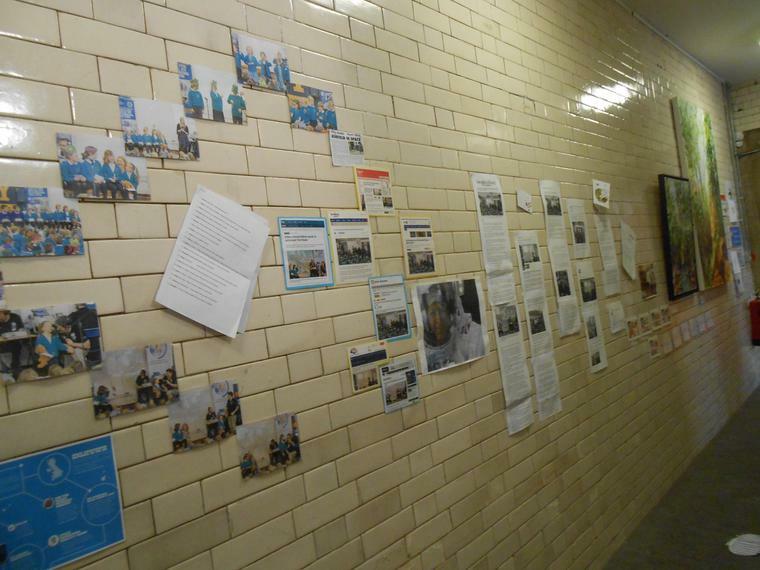 It was good to see the positive behaviour policy in action and working exceedingly well. I am proud of being a governor at Ashfield Primary School and days such as today only reinforce that feeling. 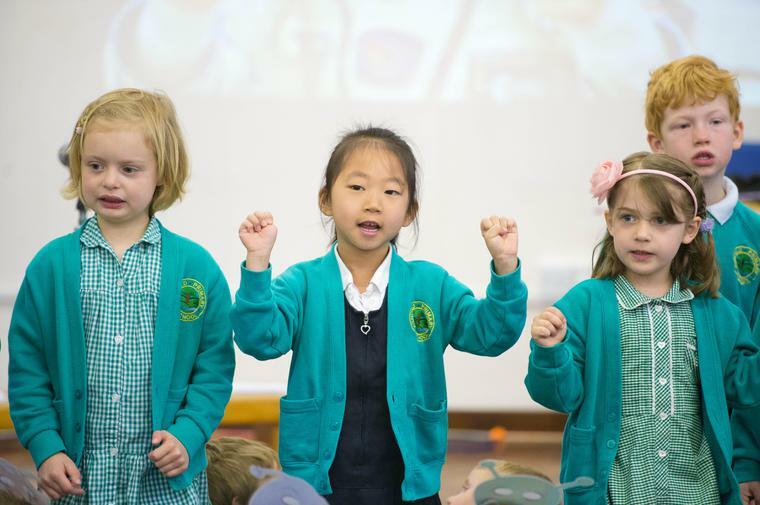 Ashfield Primary School is a delightful place for children to learn, grow and develop in preparation for their next step to secondary school. Year 5 and Year 6 both attended workshops led by The Peace Museum today. They hear stories about the choices people make in wartime and discussed positive personal attributes from this. We've had a lot of visitors to school this week. Janet Sheriff, the headteacher at Prince Henry's Grammar School, led an assembly for us all about what special ingredients we need to use to make a fabulous person. 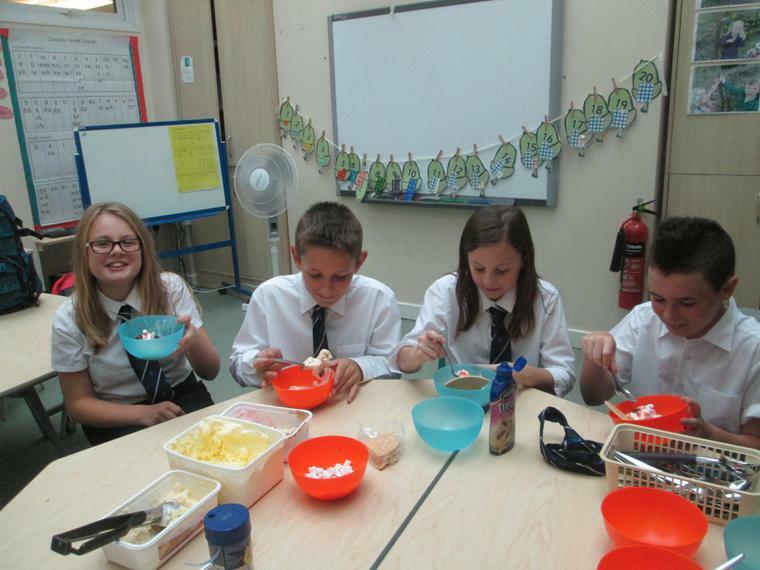 Mrs Sheriff made us some cakes to enjoy and said Ashfield pupils had many great ideas and were extremely well behaved. On Wednesday West Yorkshire Police gave us an assembly about bullying and what we should do if we see anyone being bullied. Our own Mr Patel produced us a thought provoking assembly about keeping yourself safe when using electronic devices and what we should do if anyone is bullied on line. 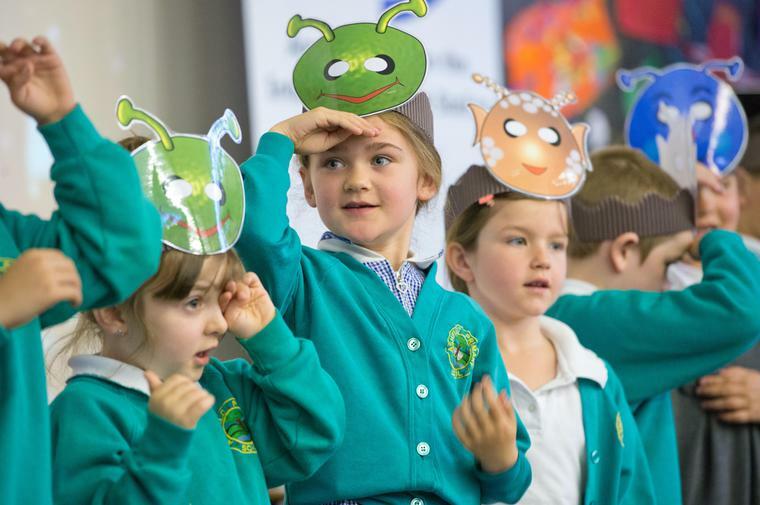 Friday's celebration assembly really made me smile because our teachers were very pleased with children who had really put themselves in someone else's shoes to understand all the issues. At Ashfield we do not have a lot of bullying but we are not complacent. We showed the children our strategies for dealing with bullying when we know about it. We modeled how a circle of friends - led by a teacher - can support the victim and perpetrator resolve issues and make sure both are much happier in school. 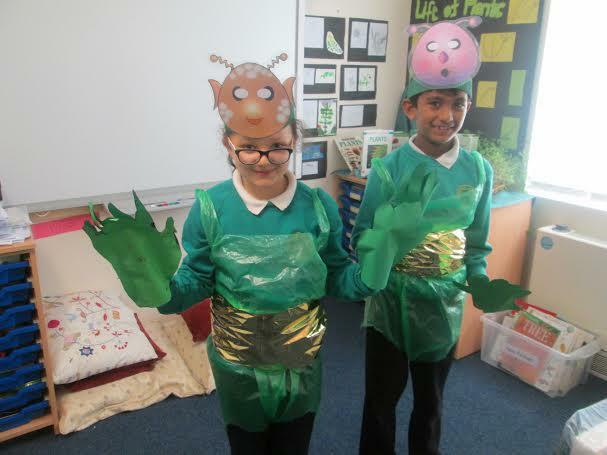 Maple Class had a Silly Science interactive workshop. 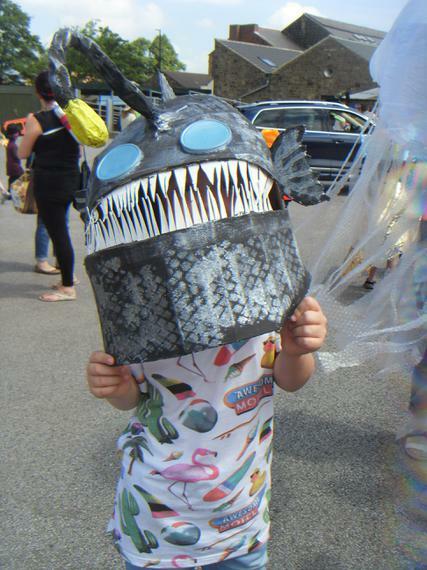 KS1 visited a Jack and the Beanstalk exhibition and KS2 visited a Heavy Metal Marine Biology Show. Many thanks to the parents and carers who accompanied us on these exciting visits. 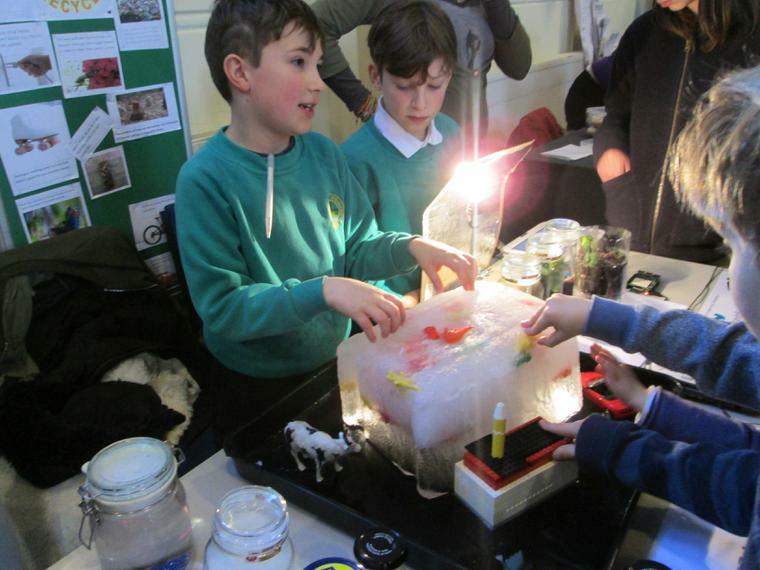 We've had an explorative week, celebrating Otley science festival. 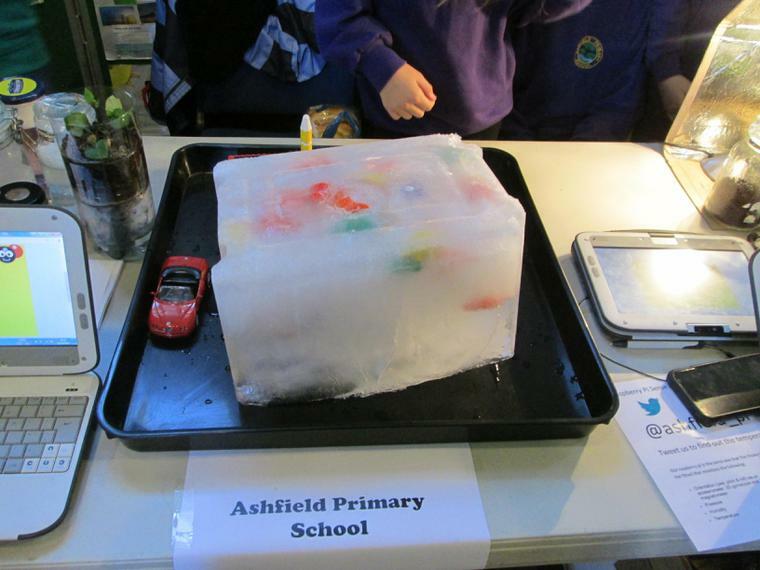 The culmination of this week was Ashfield's presentation at the Otley Science Fair at the Courthouse on Saturday. 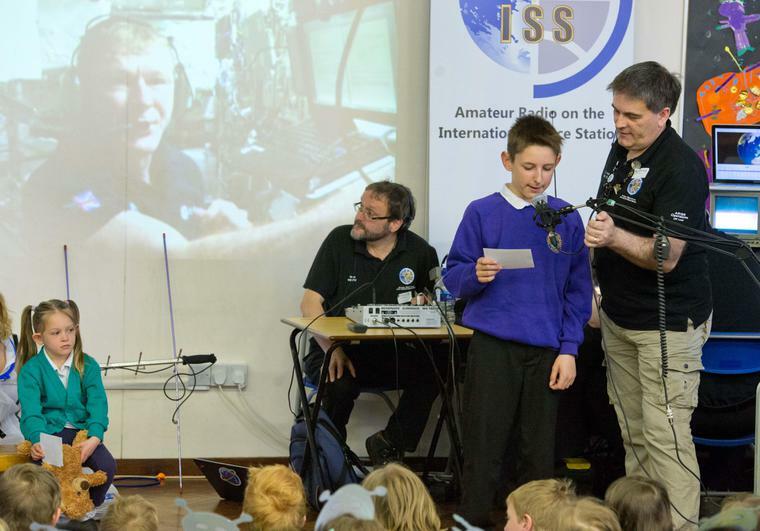 We presented our work in the Ashfield Science, Technology, Engineering and Maths (STEM) Fair last year and how this led to us getting to speak to Tim Peake last May. 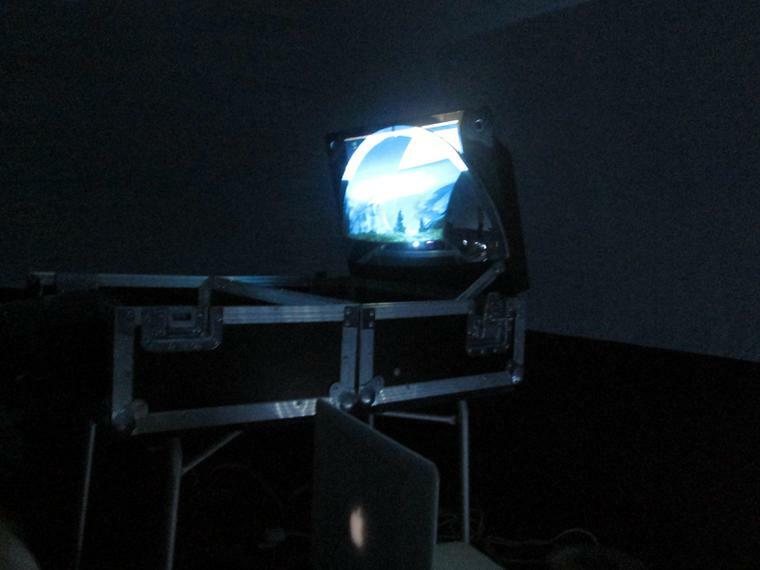 One of the cells in The Courthouse was transformed into mission control and we had videos of our live link up as well as our bid to win the competition. 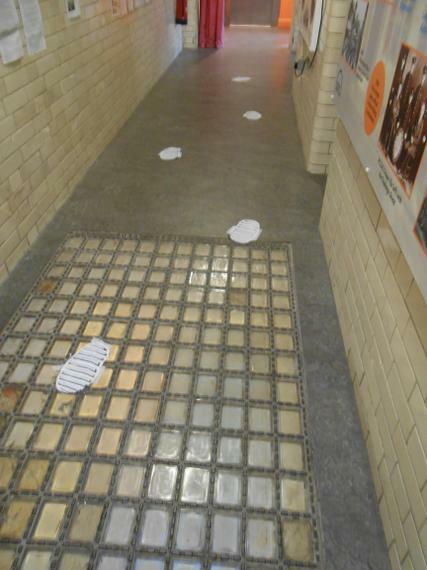 The walls on the way up to our exhibition were covered in Ashfield children's work and space boot footsteps led the visitors to our exhibition. 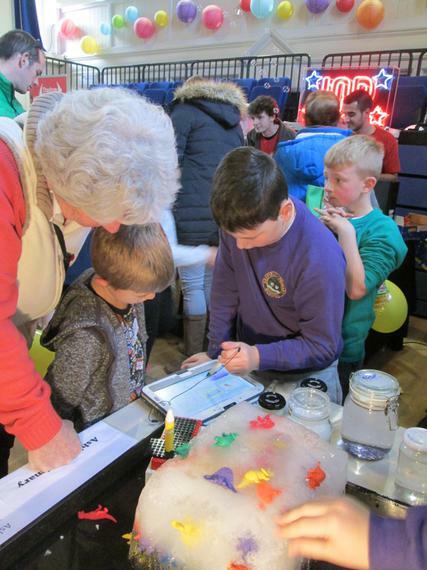 The public were very impressed with our children's work and what we had achieved. It was lovely to see many Ashfield visitors as well - thank you for your support. 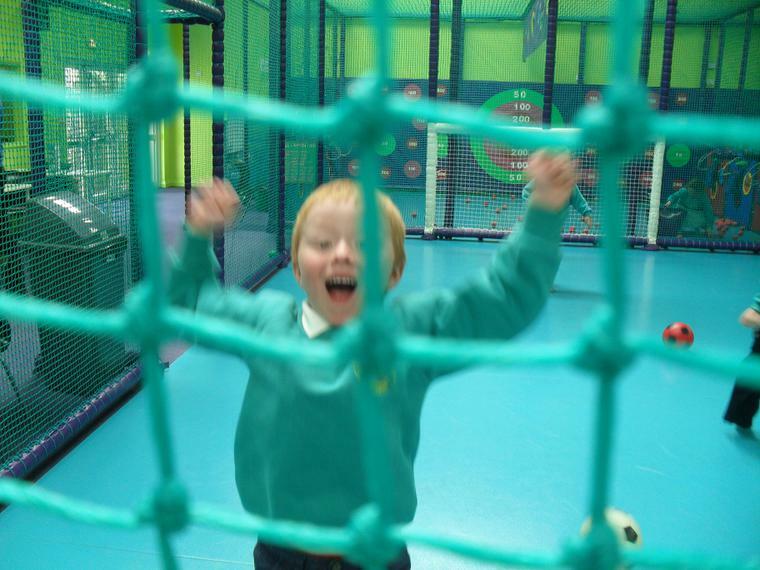 We've had a great first week back after the half term holiday. Mrs Dee Patel came into school to help us learn about Diwali. 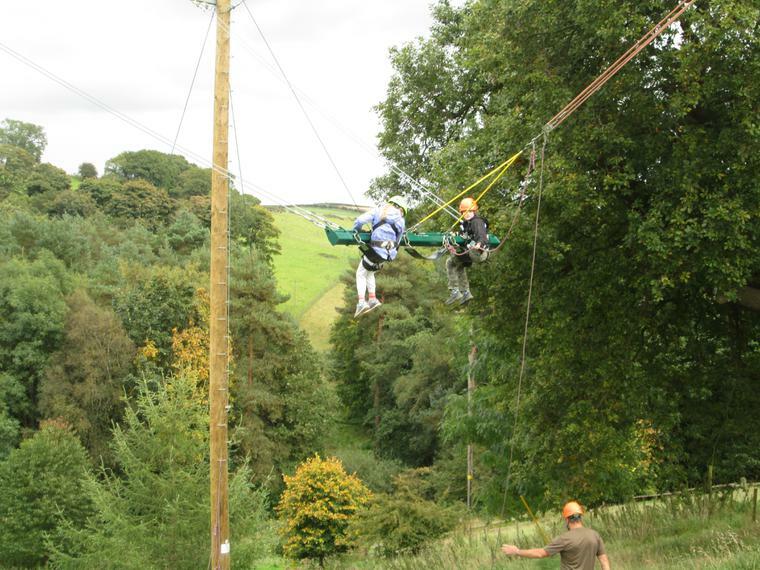 Look on the class pages for more photographs. 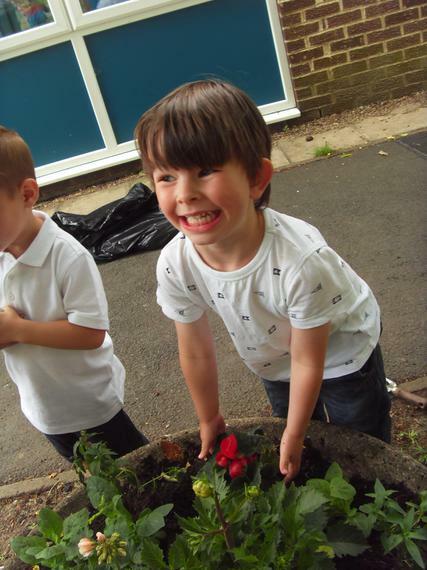 Mrs Sophie Patel helped us spruce up the school grounds with generous donations of planters, plants and flowers. We're looking forward to seeing you all next week at parent consultations. Let us know how you have found the new electronic booking system. I hope you enjoy bonfire night and that the children come back to school safe and sound on Monday morning. It's baby news all round in Year 4. Mrs Farrington plans to take her maternity leave starting Tuesday 15th November. We are very pleased that Mrs Wales can cover the four weeks gap. It's great to get supply teachers who know our school, it's children, staff and its ethos so well. 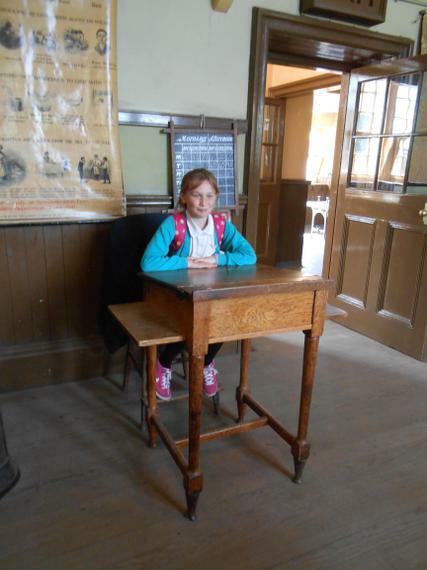 Miss Simpkins will continue to teach Larch Class. 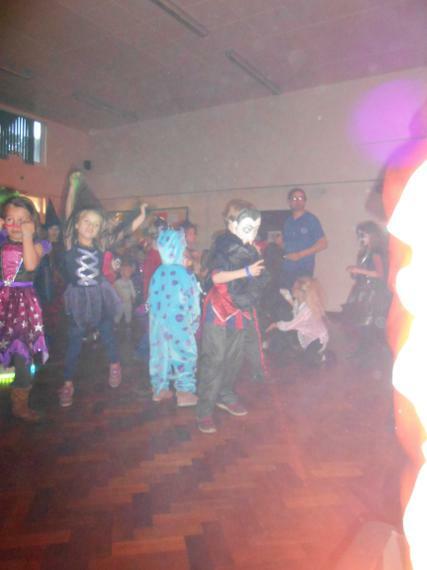 Thanks to everyone who came to support the Friends of Ashfield Halloween disco last night. Many children looked terrifying and there were some incredibly glamorous witches around. 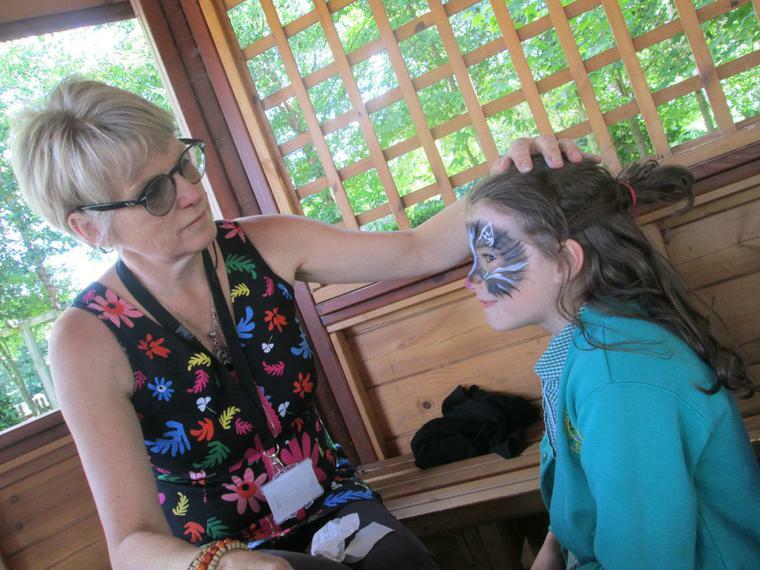 The tuck shop, hot dogs and glow sticks were popular as was face painting from Maz Springham. 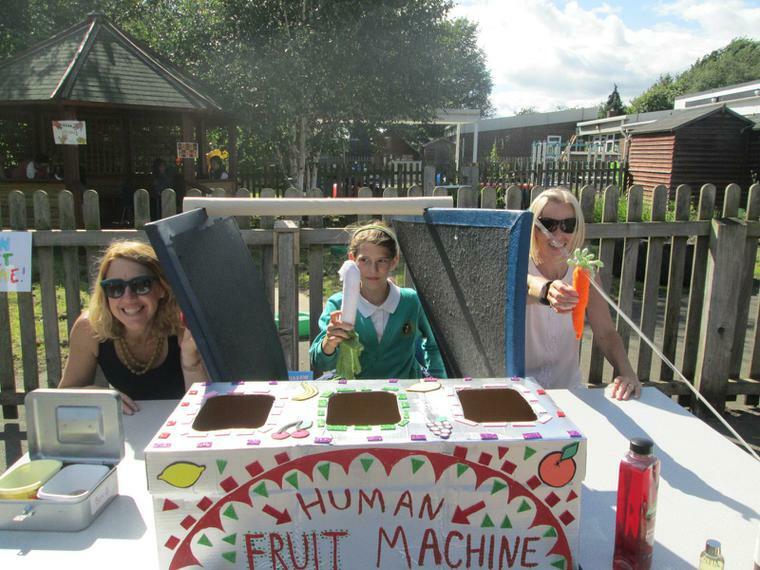 Y6 organised some enterprise activities which went down a treat as well. £441 was raised. 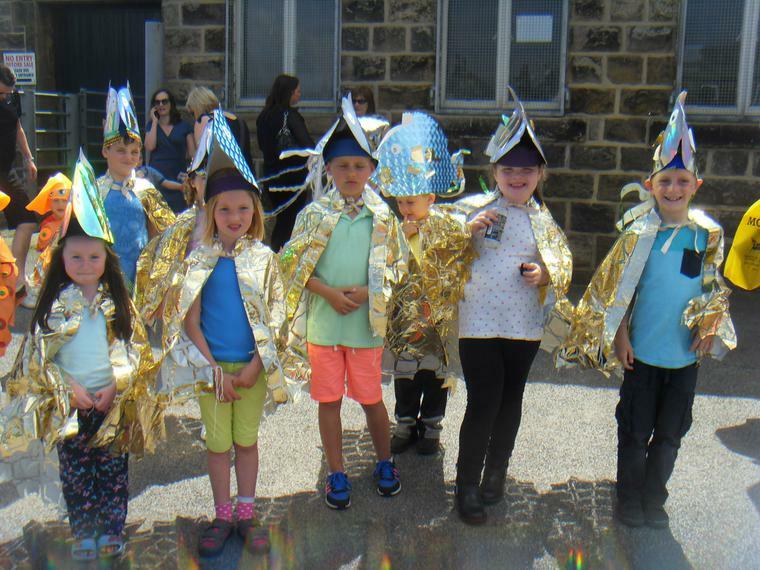 Today Key Stage 2 became world and time explorers all from the safety of their own classrooms. Year 3 went to Ancient Egypt and inside the human body. 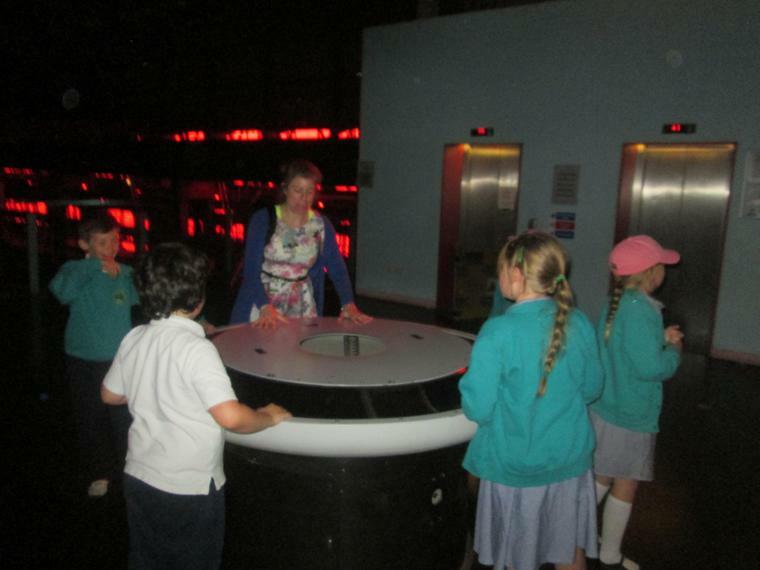 All children and adults were really excited by the experience. I didn't have to fill in any tricky risk assessments and it was all for free. The electronic macerator crushed the apples. Mr Patel organised for a juicer to be used in Ashfield on Friday. 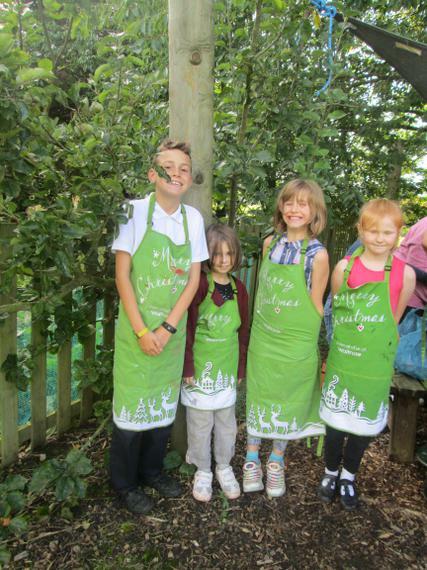 We used apples from our own Ashfield orchard and many staff and parents with their own apple trees brought in extras. 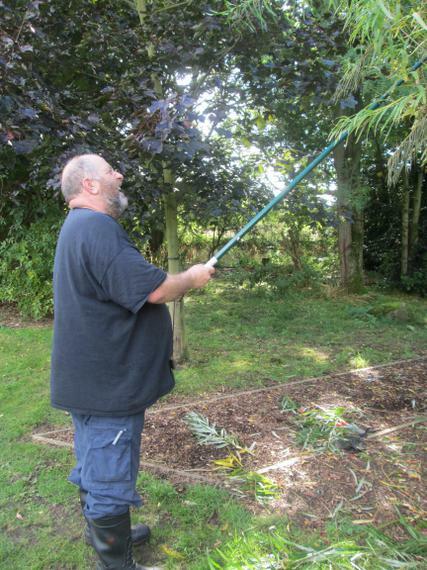 I had Mr Warren climbing our tree - I'm not great with heights! The juice was greatly appreciated by nearly all. 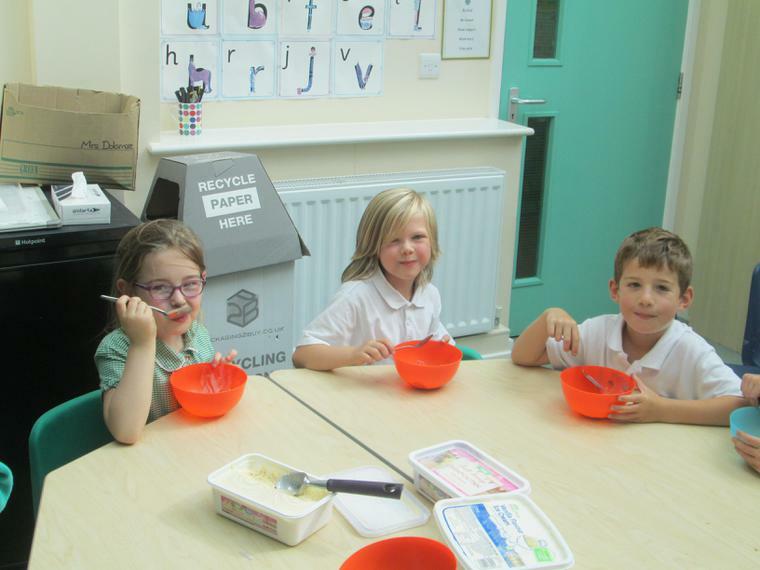 Mrs Bannister and Elm Class also spent time making apple crumbles with our cooking apples. The product was yummy - almost as good as my mum's. 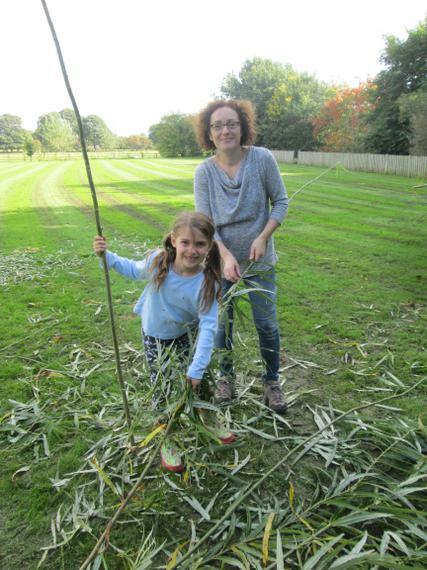 Thanks to all who donated apples or came to help on the day. 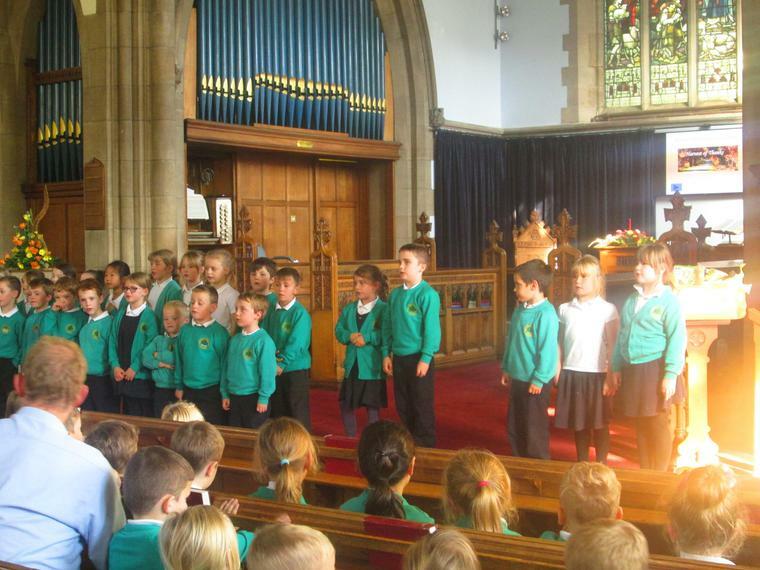 The children's performances were fantastic at Bridge Church on 6th October. They sang clearly, smiled, waved and really entertained us as well as making the sharing messages of Harvest very clear to us. Many thanks to all the parents, carers and friends who came along to help us celebrate. Many thanks to Reverend McCulagh and the church elders for letting us use the church. It was a great setting to include nearly everyone. We took your very generous food donations up to Otley's food bank who were very grateful - that's another thank you. Stepping up to the diving platform! 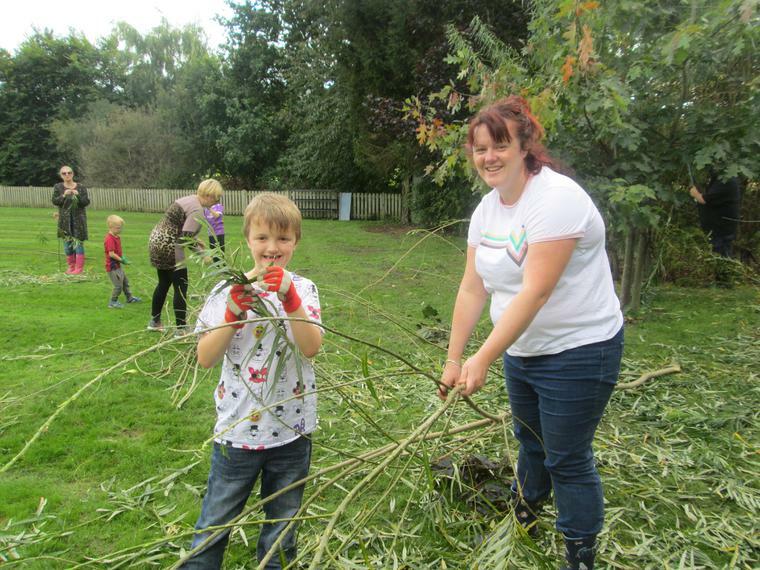 The forecast was for rain but we had a fabulous morning tidying up our wildlife area. 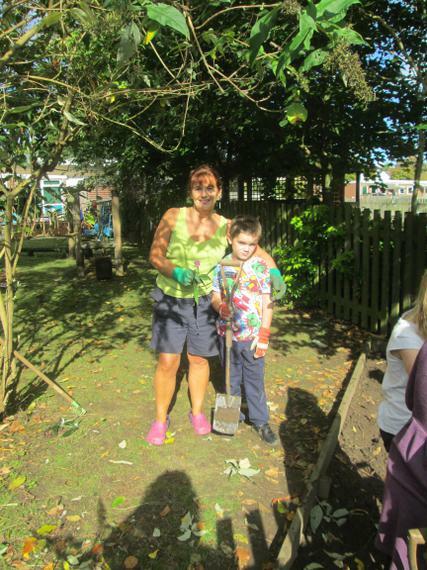 A huge thank you to Mrs Featherstone for organising the troops and to all the troops who volunteered. 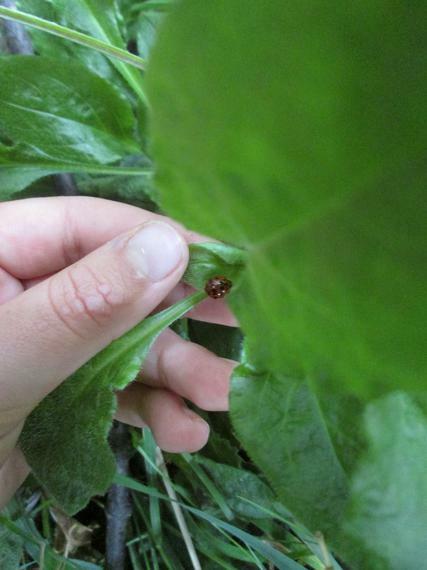 You'll see some of them in the photos but there were more who were camera shy. The grounds now look super and you should see your children using the area on your class pages in the next couple of weeks. 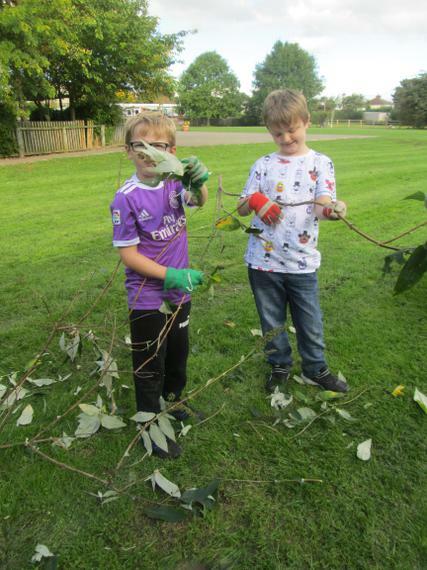 Tomorrow (Saturday 1st October) is Ashfield's annual community clear up day. 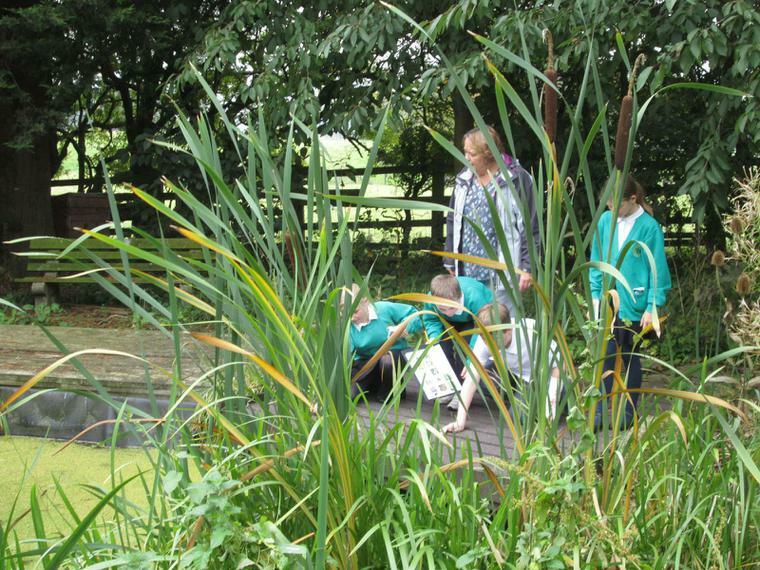 Staff, parents and friends of the school will be taming the wildlife garden after summer's growth. Rain is forecast in the afternoon but fingers crossed, it should be dry in the morning. We'll start at 10am. All are welcome. I look forward to seeing some of you tomorrow. Friday 30th September 2016 - what a busy day! All around me today is a sea of flowers. I was especially dazzled by Mr Patel's Hawaiian shirt. It's a pity I didn't bring my sunglasses to school today. 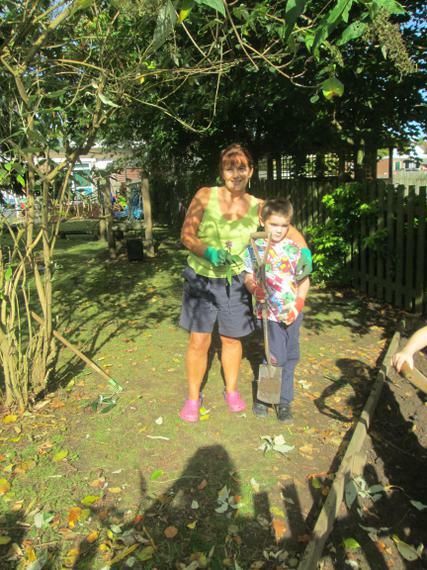 Thank you to all of you who sent bulbs into school. 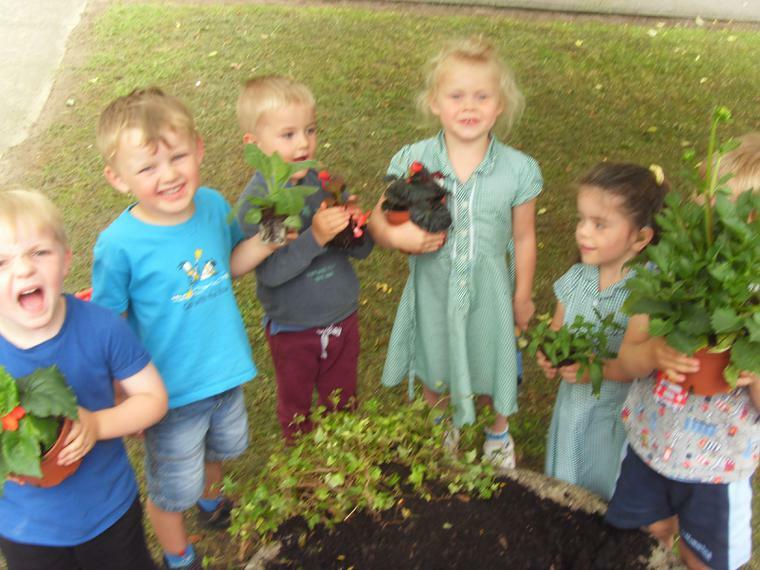 We're going to have a big planting session next Friday and look forward to the results of your help and our labour in spring. 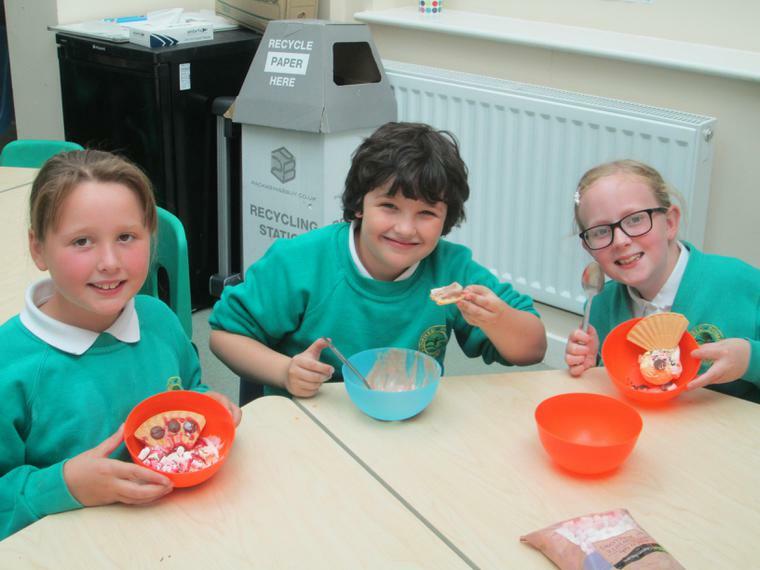 Elm Class held a coffee morning today in aid of Macmillan Cancer Support. 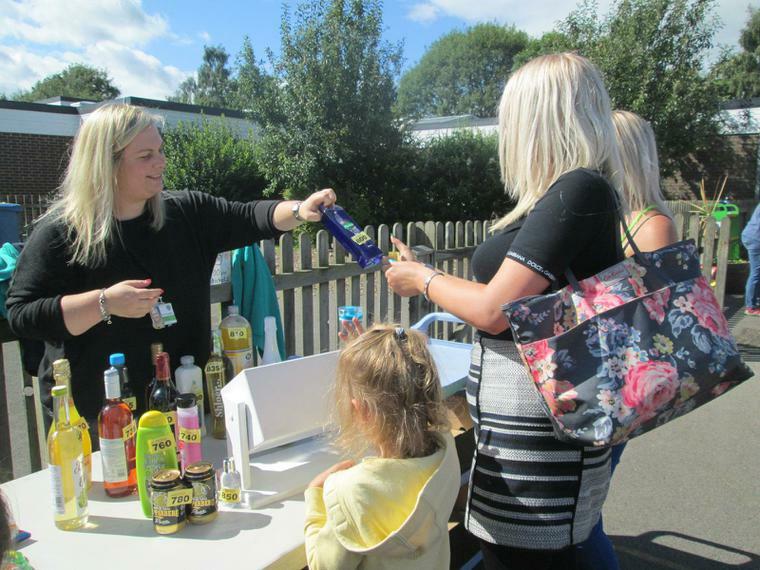 They manged the stall, served drinks and food and took great pleasure at counting the profits. So far this morning they have made more than £200. 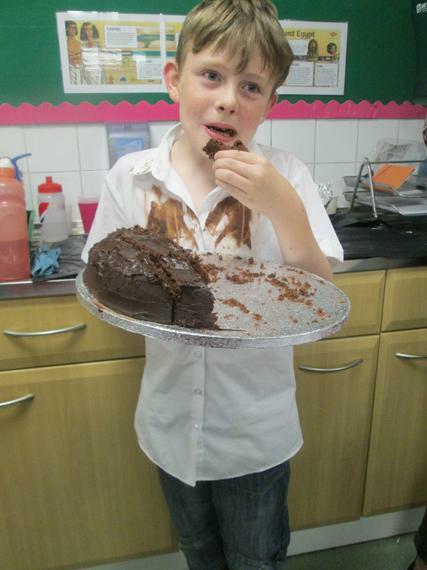 We still have plenty of cake left so please come back this afternoon from 3pm for more cake to eat in school or take home. The children could not have managed this without the support of parents, carers and staff so many thanks you to all of you who baked a donation or came to the event. The final count for money raised was £376.09. Well done and thanks to everyone involved. Even more cake - yum yum. A chance to relax and chat. Making the beds can be fun. The chef kept everyone quiet. Yum Yum! Even washing up is fun. A night walk by Eccup Reservoir. 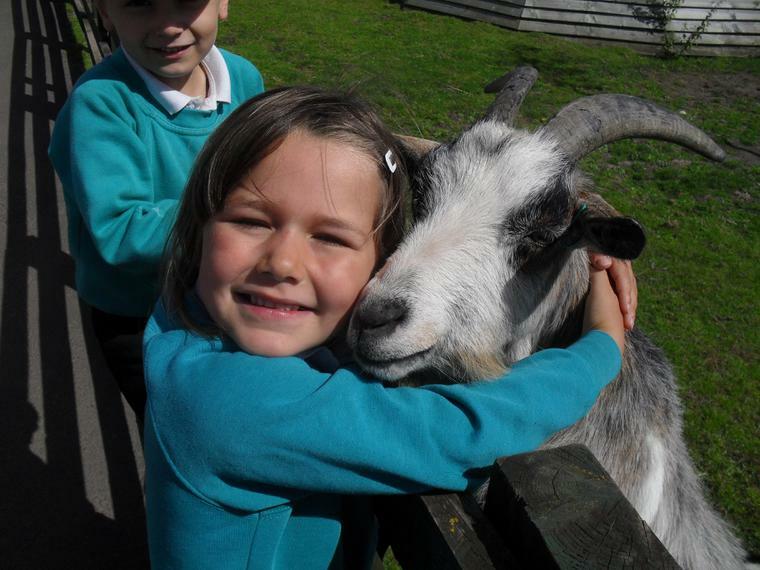 Oak Class have had a fantastic time so far at Herd Farm. 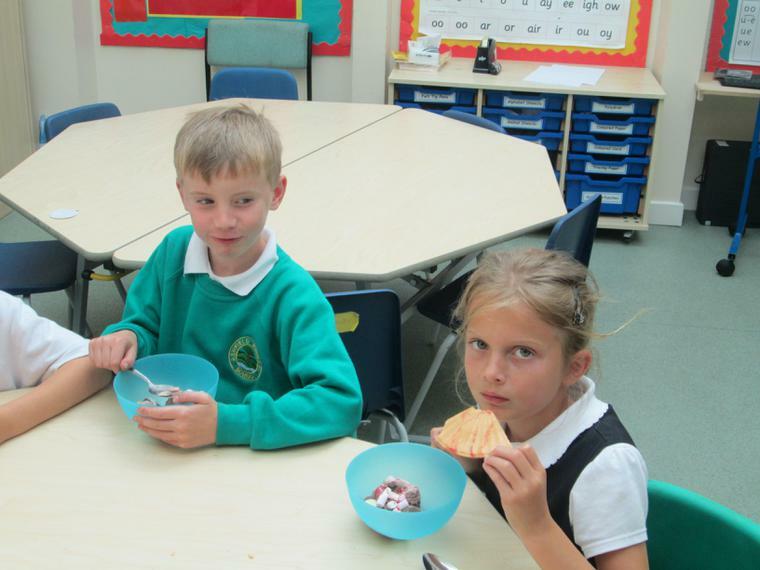 You can be very proud of your children for their positive attitude and polite behaviour so far. 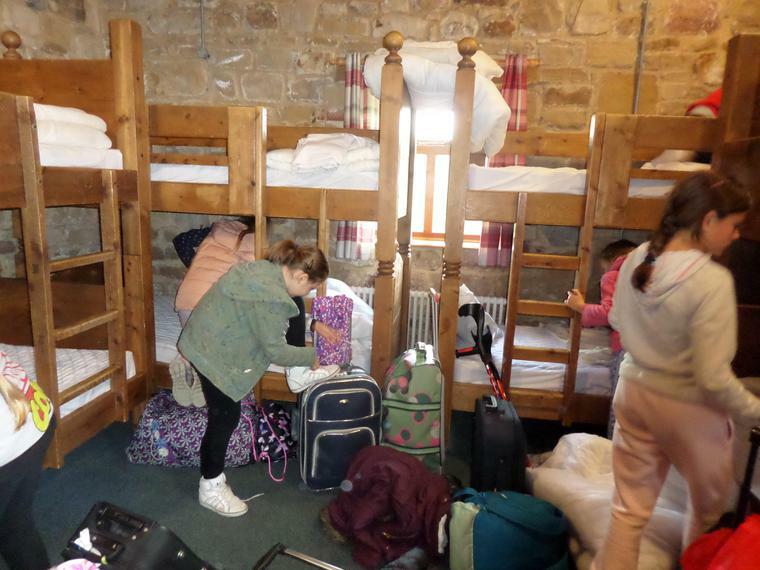 They've been domestic gods and goddesses making beds and sorting their rooms as well as laying the table for dinner and washing up up. Hopefully these skills can be utilised at home now too! We've also had fun playing games in the lounge; playing football and Adie, a Herd Farm instructor gave us an extra free session - taking us for a guided night walk to Eccup Reservoir and around the grounds. 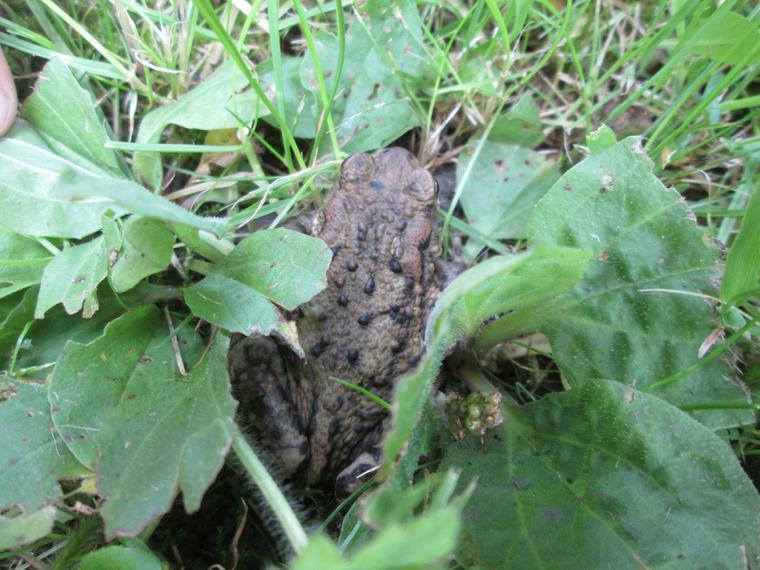 We saw loads of wild birds and Marty even spotted a toad. The walk ended with a game of Splat in the drizzle. Everyone was having too much fun to mind a bit of rain. After drying off and getting into pyjamas, it was time for a movie and hot chocolate. It took a little time to get everyone settled but the children woke up this morning bright and breezy and raring to go. 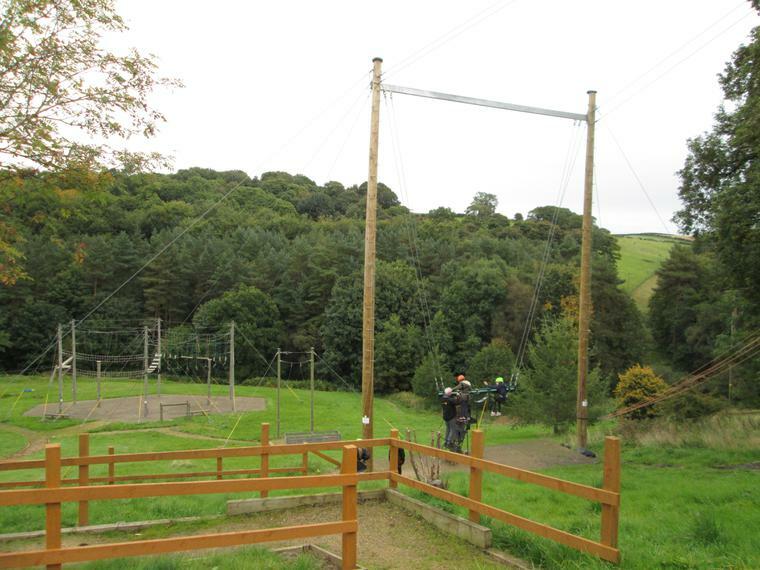 They will be trying out the Crate Stack activity and the brand new High Swing with three seats. This means plenty more goes per child. I'm back at school now and catching up on emails, but I'm looking forward to going back tonight to hear all about their exciting day. 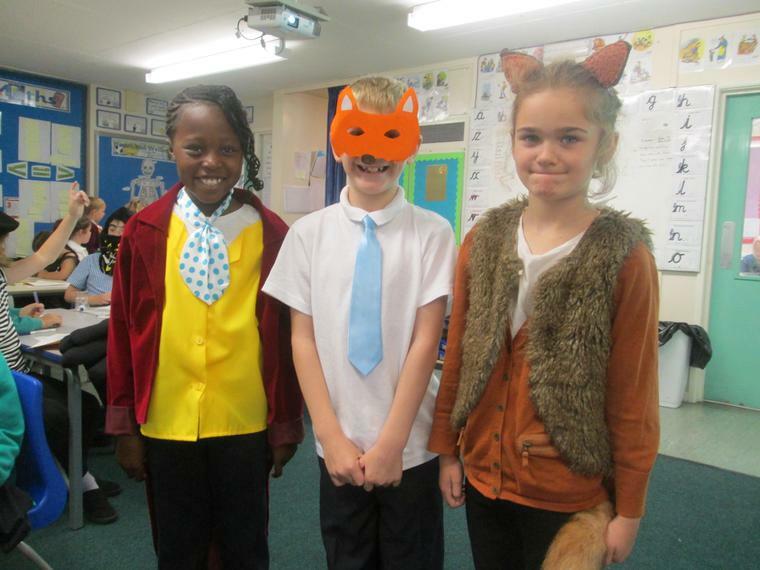 Ashfield really enjoyed celebrating 100 years since the birth of Roald Dahl. 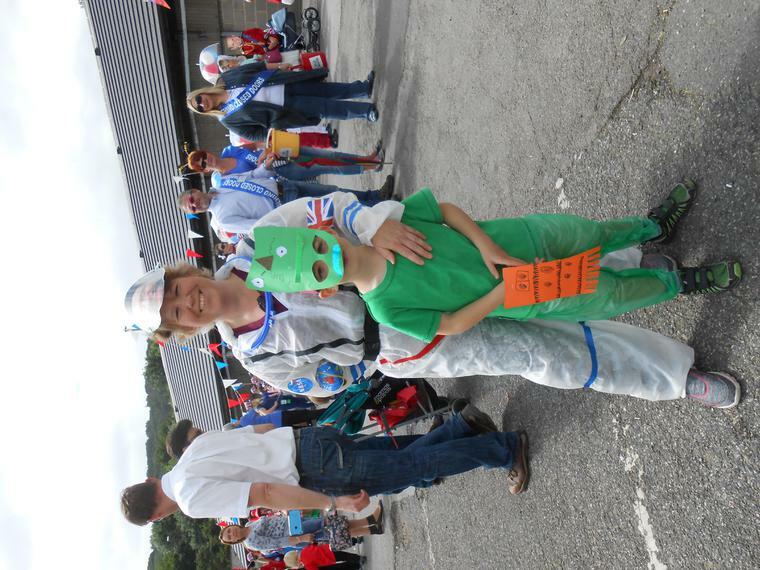 There were some fantastic costumes worn by the children and staff. 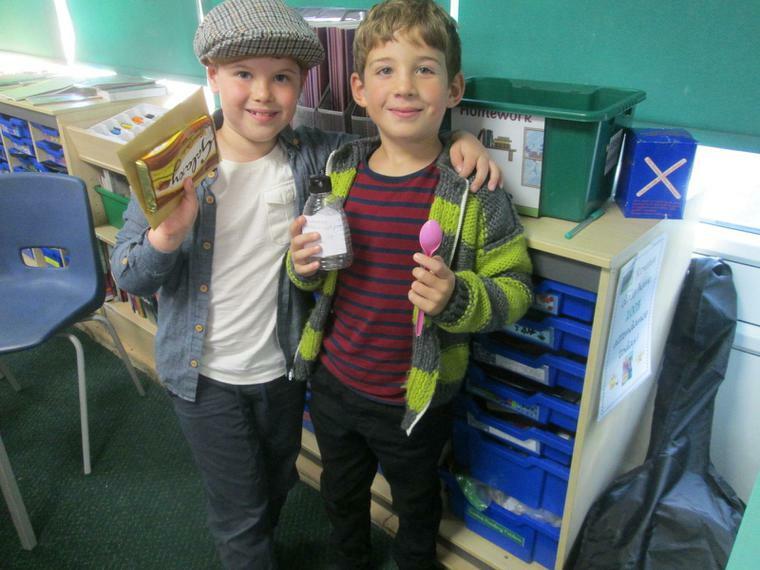 We also enjoyed a variety of Roald Dahl themed activities throughout the day. There was a strange woman around school with pointy shoes, gloves, a terrible wig hiding a bald head, which she kept scratching who sniffed a lot and complained of a terrible smell around the children. She denied being the Grand High Witch - but I think the children rumbled her by the end of the day. I'm a lovely lady - not the Grand High Witch! 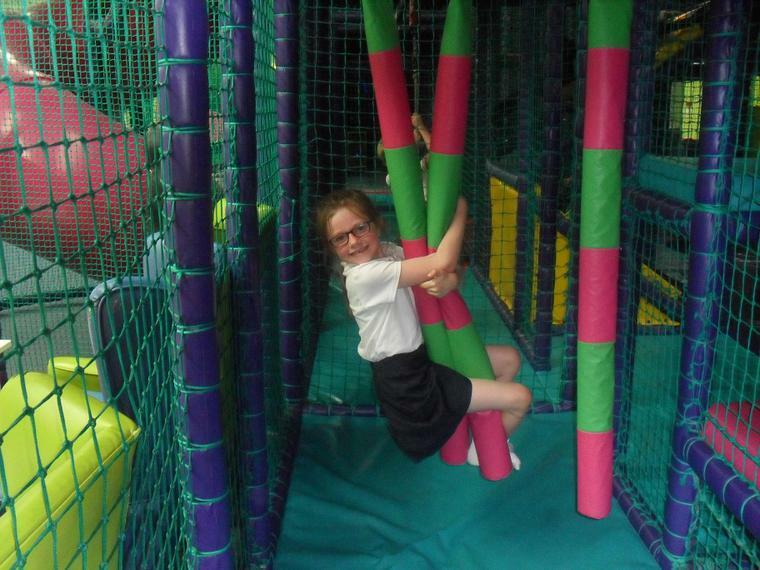 This Friday we celebrated with of some of our children who achieved 'Above and Beyond' our Superstar award last year. 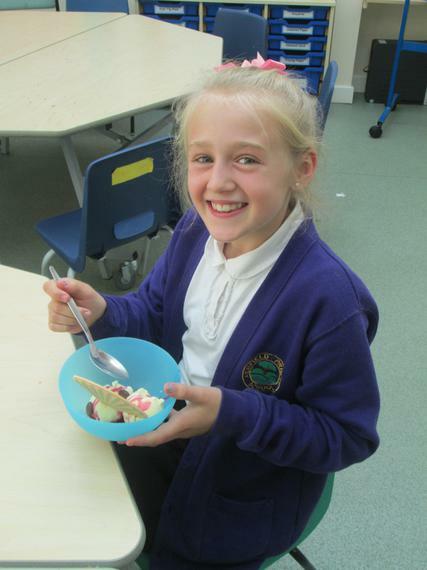 The children came to our ice cream parlour to choose flavour and toppings. 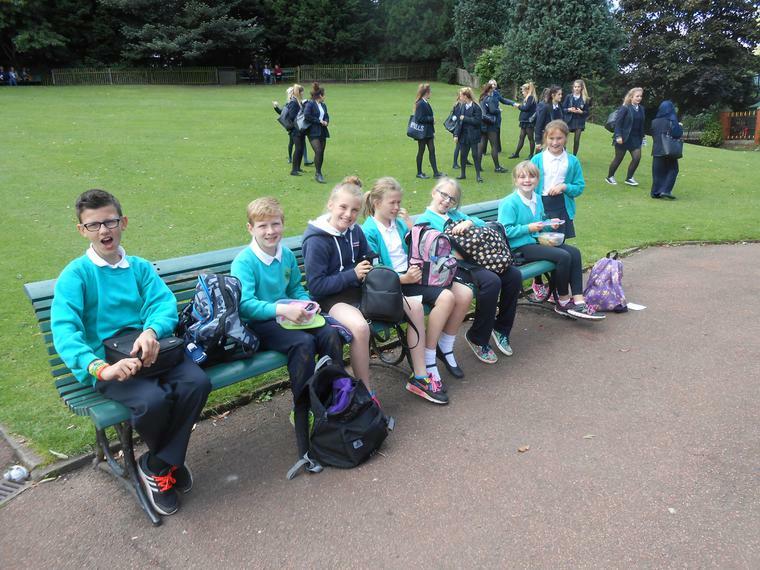 New Year 7 children came back to Ashfield. It was lovely to see them and hear all about their first few days at secondary school. 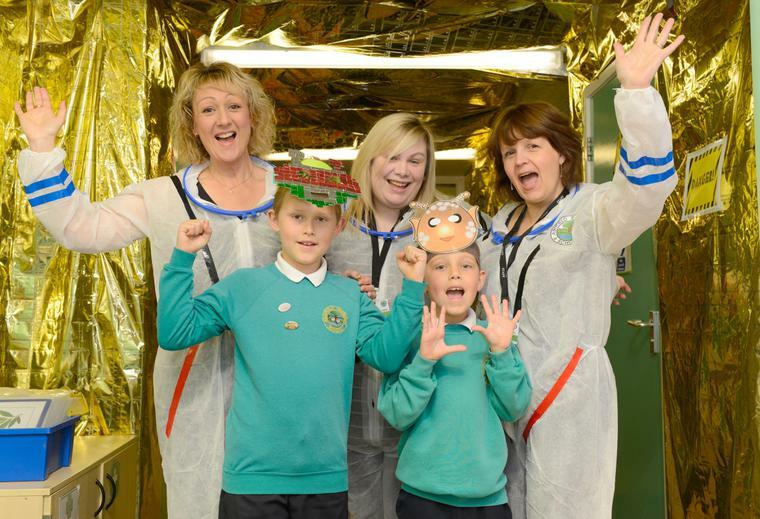 We're very proud that our very own Mrs Perring has been nominated in the YEP star of the classroom competition. 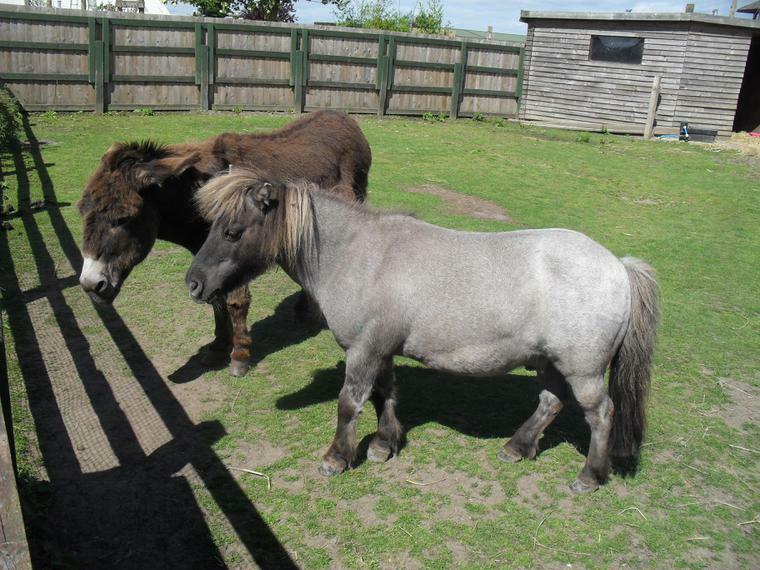 Silver Birch are having an extra 2 members from September. 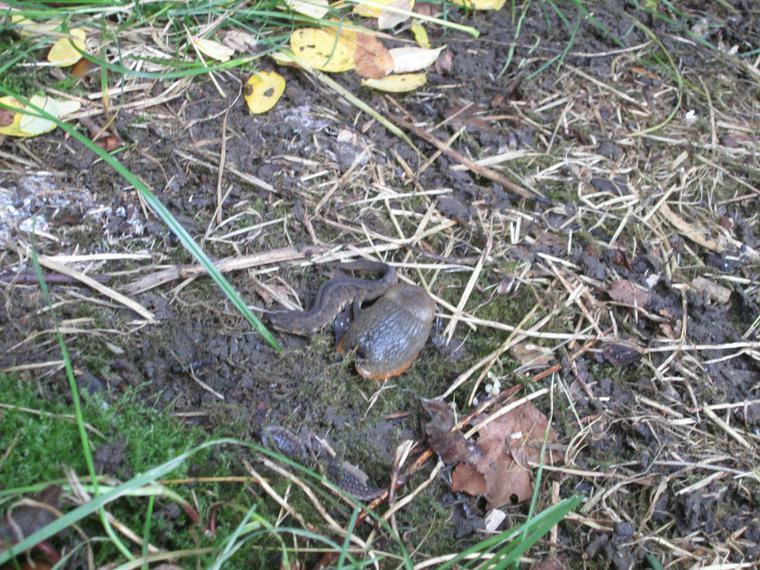 They're a bit shy so far, quite squeaky and leave damp patches on your knee - but all is forgiven as they're so cute. The children are busy choosing names and will let you know more about their progress on their class page from September. 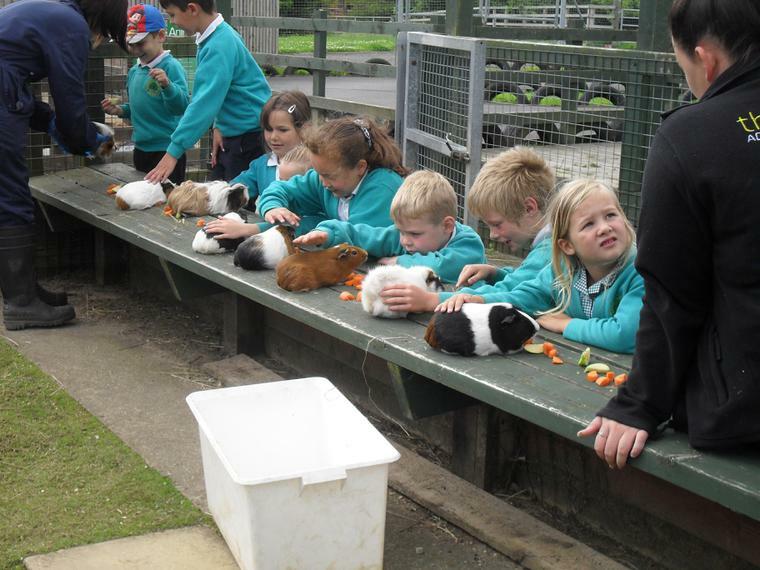 Years 1 and 2 went to Creepy Crawlies Adventure Playsite, where they could meet and pet many pets and farm animals, including my favourite - guinea pigs. 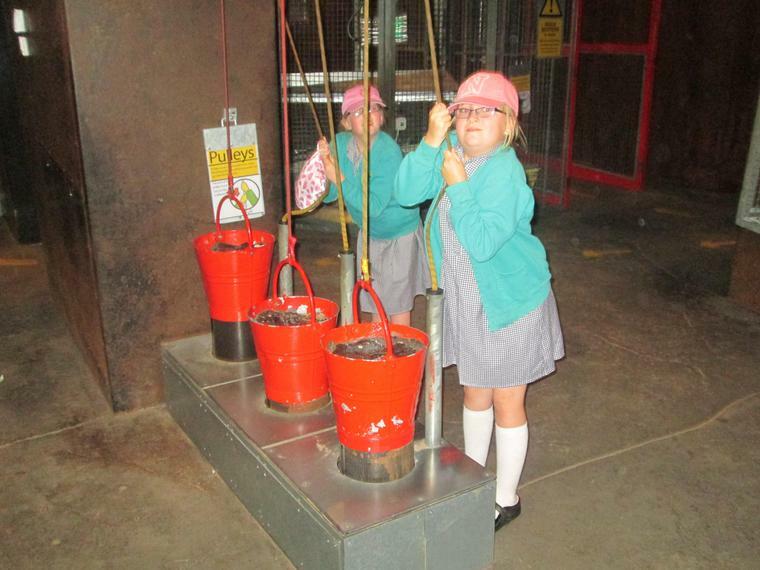 Years 3 and 4 visited Magna Science Adventure Centre. 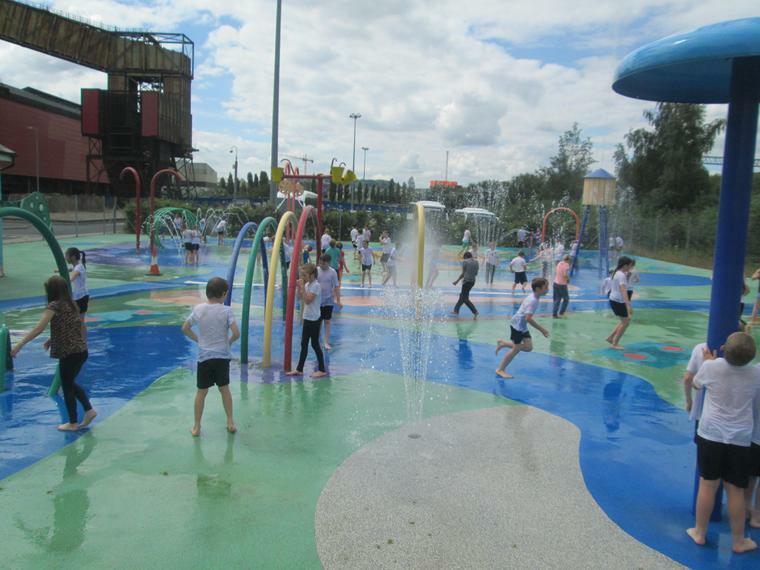 They amazed Magna staff with their knowledge of space and stars and had a whale of a time in the playground and splash centre. 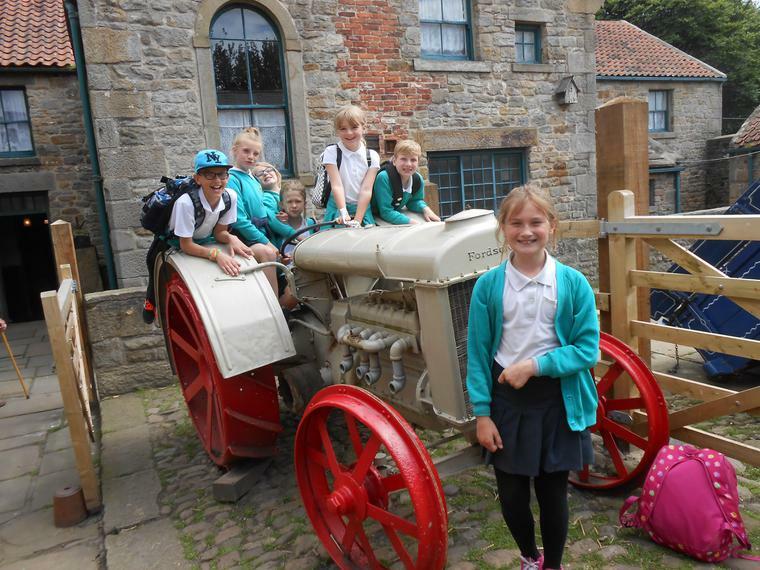 Years 5 & 6 travelled back in time (and up the A1) to Beamish open air museum, telling the story of life in North East England during the 1820s, 1900s & 1940s. 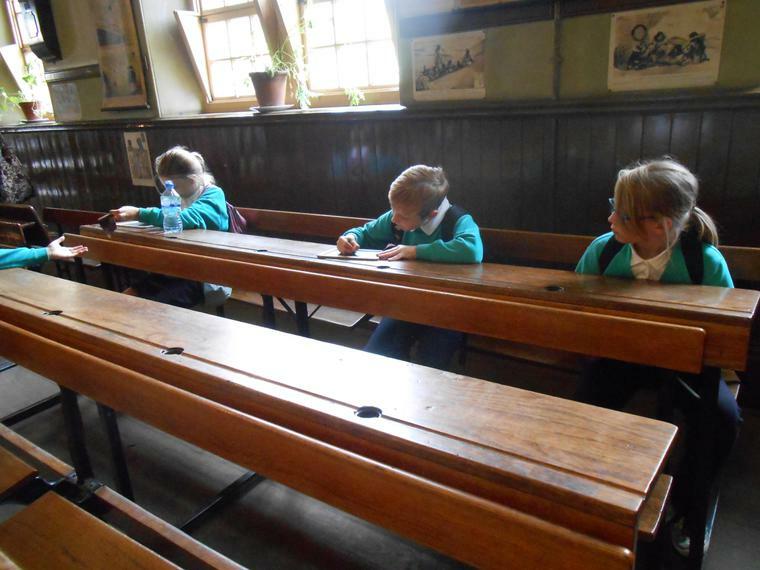 Favourites included a 1900s dentist, becoming a pit child - crouching in the underground mines, the 1900s school room and of course the 1900s sweet shop. 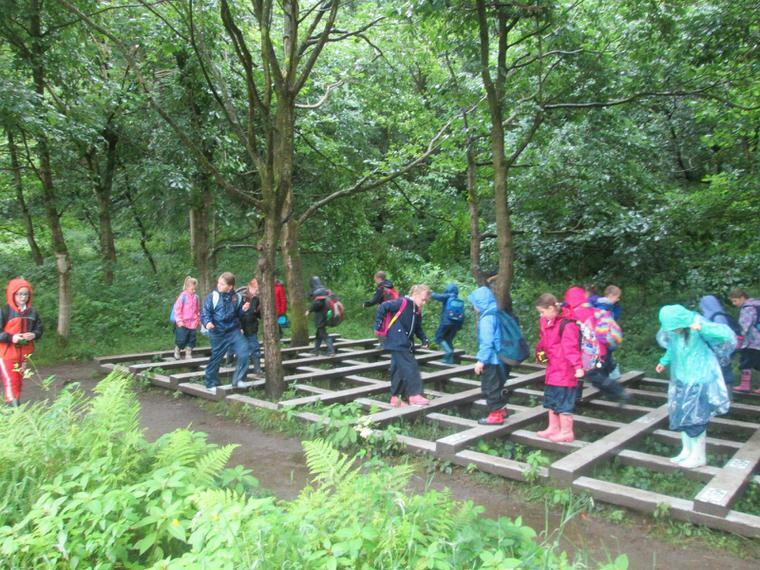 Other rewards have been a forest school experience, extra playtime and next week above and beyond will receive their treat. 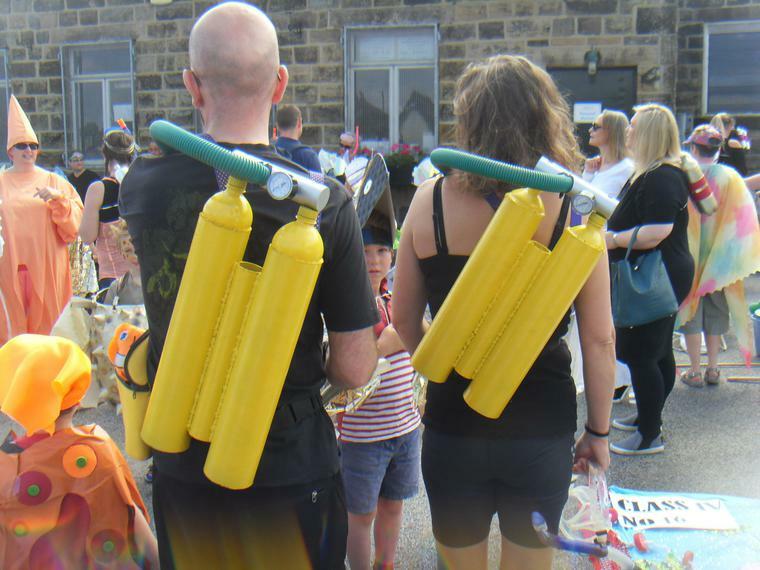 What better timing after Ashfield's Health Week; Otley, Pool and Bramhope Family of Schools is hosting a health fair at Prince Henry's Grammar School. For more details please look at our 'Clubs' section of the website. 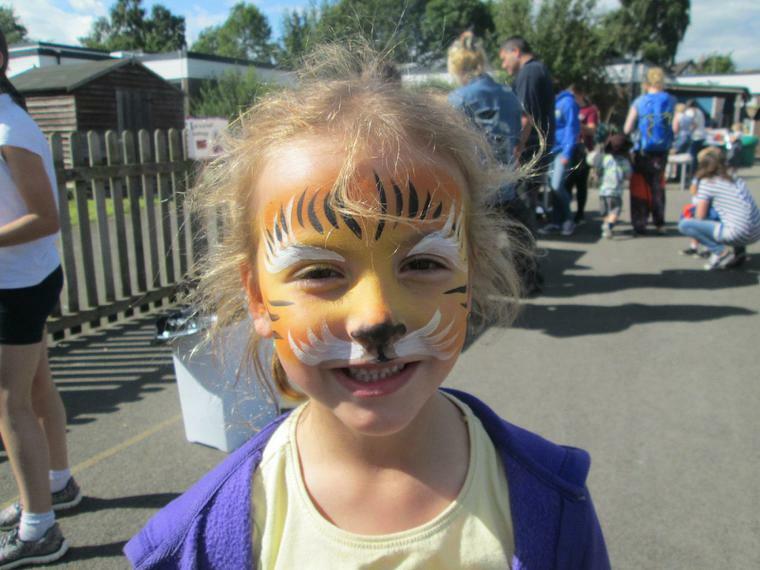 We had a great time at the Summer Fair on Friday evening. 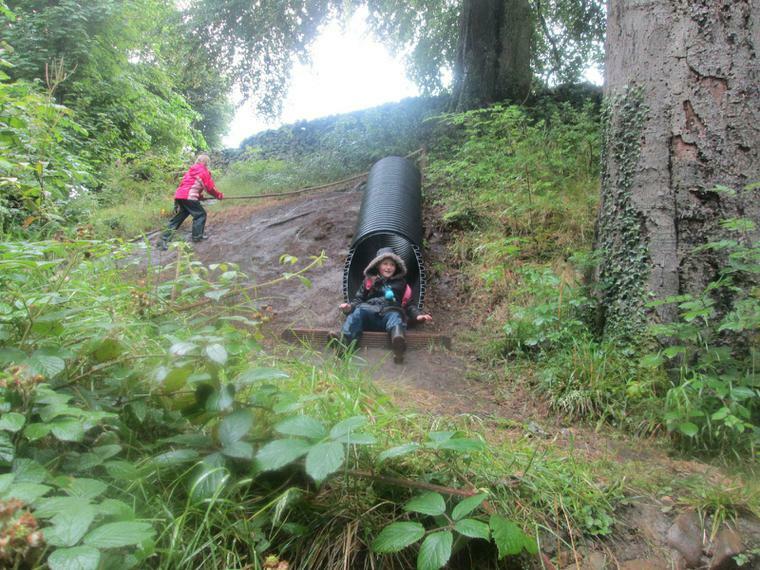 Even though the weather was hardly what you would describe as summer, a good time was had by all. Inside we went for Plan B and had a disco in the hall as well as face painting, temporary tattoos, refreshments and Y6 enterprise stalls. 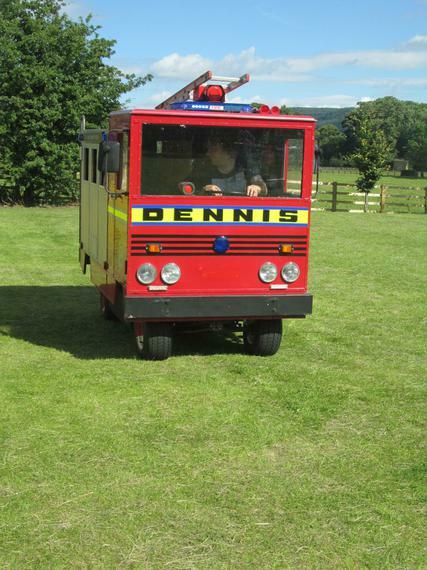 Outside we still had the traditional barbeque and Diddy Dennis, the tiny fire engine. Thank you to all who helped either setting up, manning stalls, buying from those stalls as well as tidying and cleaning up at the end of the night. 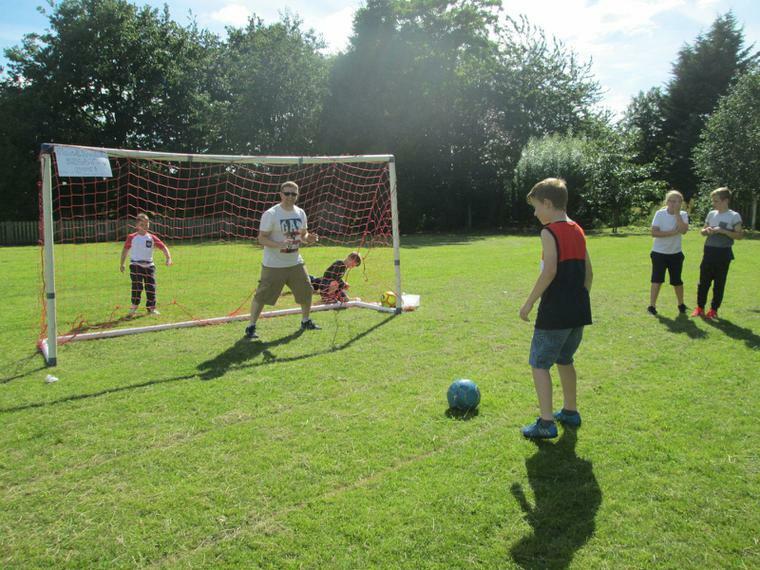 A profit of approximately £470 was made, which Friends of Ashfield will put towards the cost of Superstar coached and other end of year rewards. 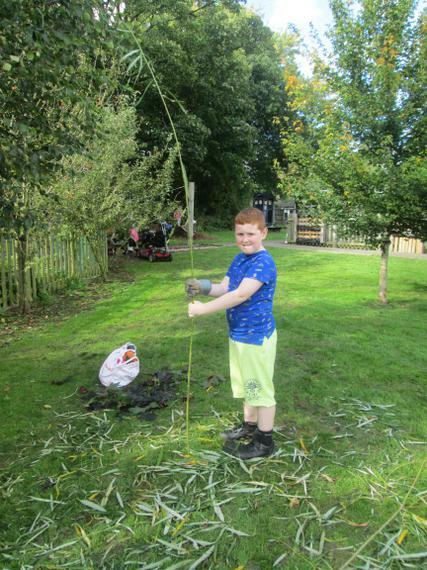 Greg Mulholland came to visit Beech, Silver Birch and Maple Class on Friday 1st July. They presented him with our 'Send my Friend to School' campaign, which raises awareness of the number of children in the world who do not have access to free education. He was so excited and impressed that he is taking some of their materials to Westminster and the House of Commons! 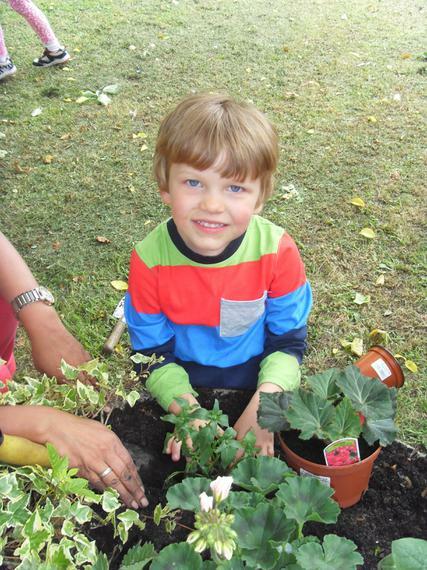 We have had a kind donation of plants from Mrs Patel's partner Callum. 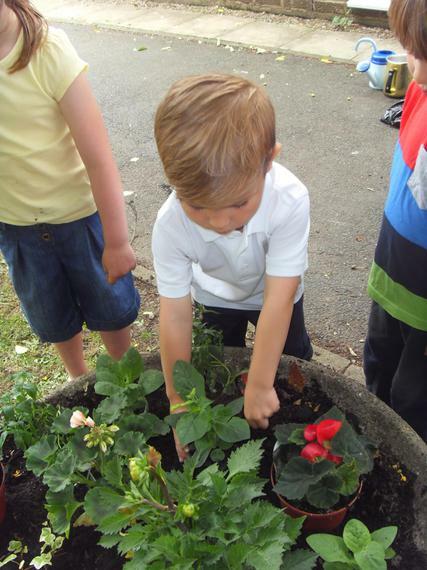 Acorn children have been helping Mrs Patel brighten up the grounds today by adding the colourful plants to our tubs. A big thank you from all at Ashfield. 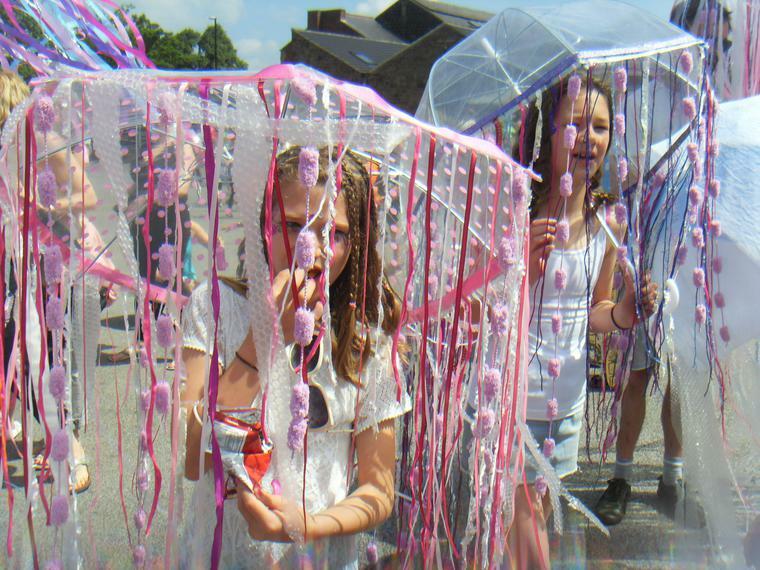 It was a lovely warm day, despite the clouds on Saturday as we all met at the auction mart to be judged before setting off in the Otley Carnival Procession. 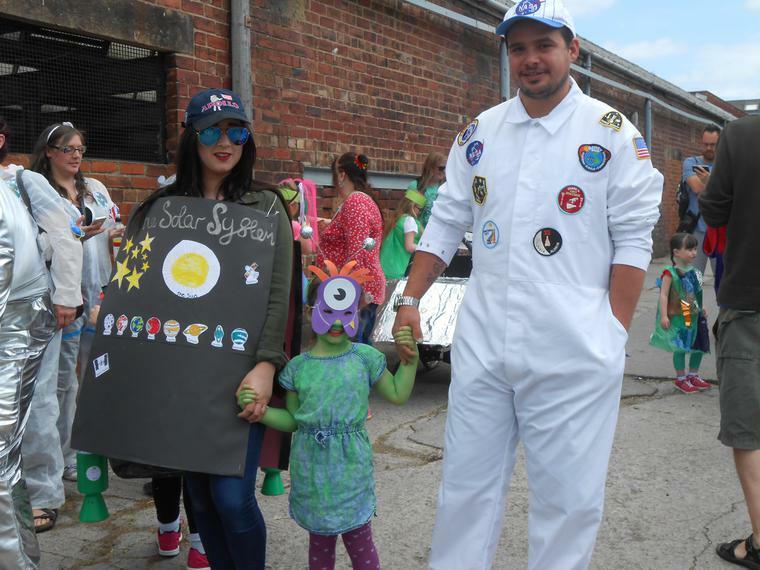 Children, parents and staff looked amazing dressed as aliens, flying saucers, space craft and astronauts. What a creative bunch! Before we set off we were judged to be first in our class - walking schools. It was a really friendly environment as we walked down the street - people cheering and waving at us. 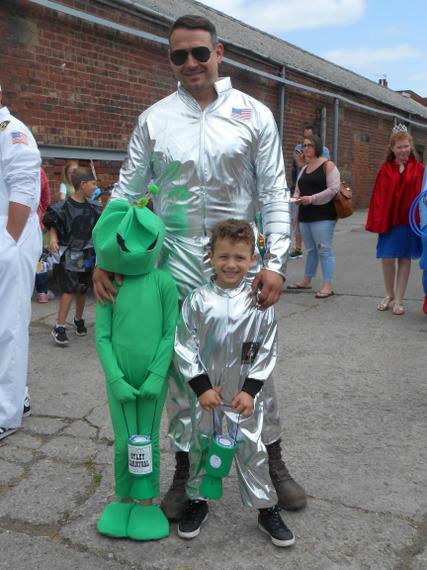 We had some super money collectors among our 'aliens' - who persuaded the Otley citizens to donate to the Carnival charities. Parents and children, past and present who supported us in such a warm friendly way as we walked through the streets. At the showground it was great to receive our trophy from the Carnival Queen - none other than our very own Olivia Bradford. 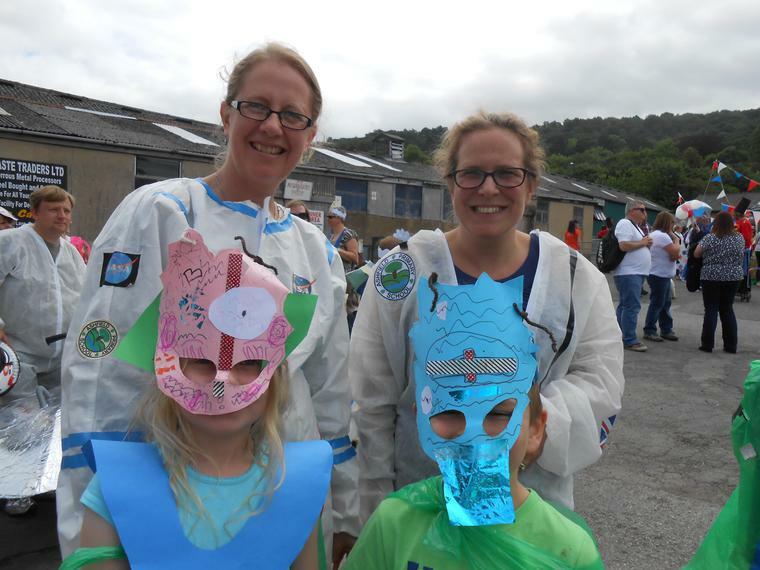 Ashfield staff who took the time to help children prepare costumes and those who helped supervise on the day. 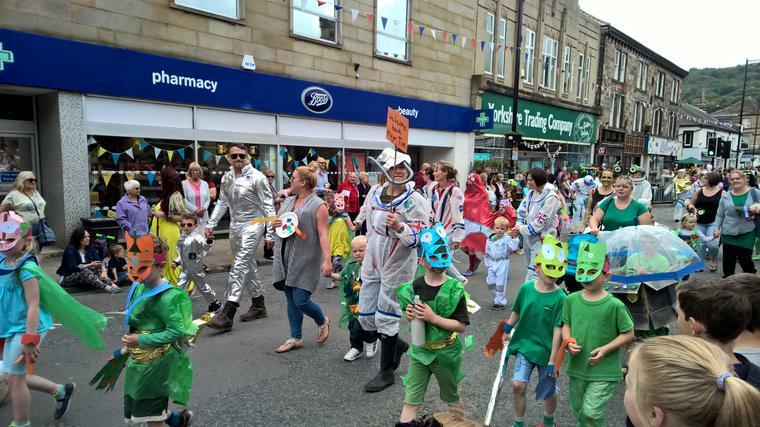 For The Love Of cafe run by The Donkey Sanctuary approached Ashfield to help them create a window display for the Otley Carnival window display competition. 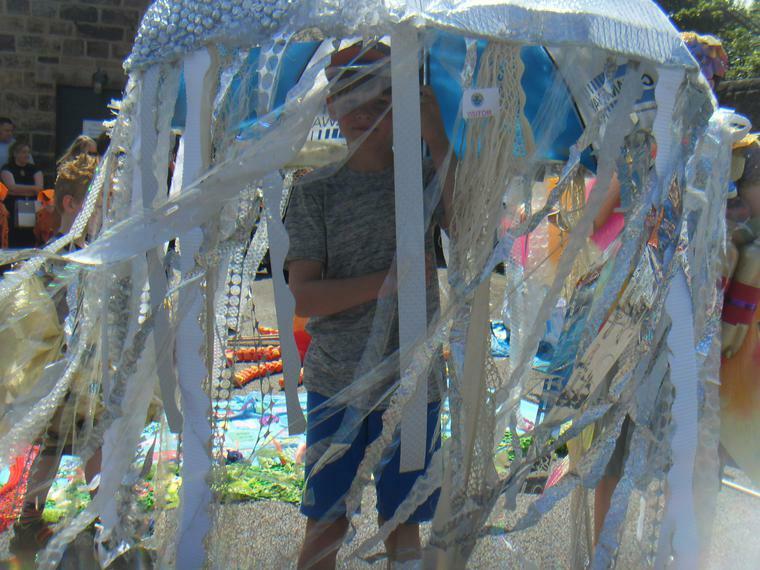 Mrs Farrington and Rowan Class wrote seaside postcards and created papier mache figures for the sea side theme. The display is the overall winner for the window display. Well done Rowan Class and For The Love Of cafe. Rowan Class try their hand at a triathlon. 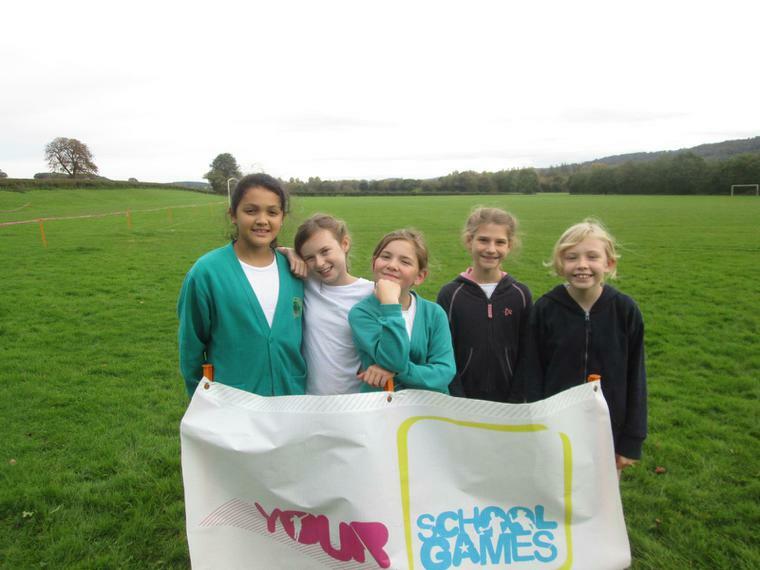 Last week Rowan Class went to John Charles Centre to participate in a triathlon. 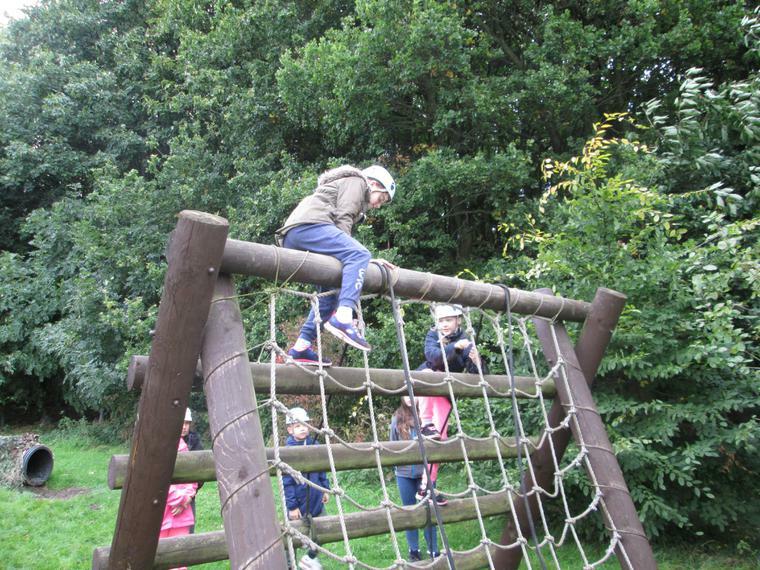 Not only did they have a great time, they also showed some amazing personal qualities such as : perseverance, resilience, sportsmanship and fair play as well as super behaviour the whole day long. 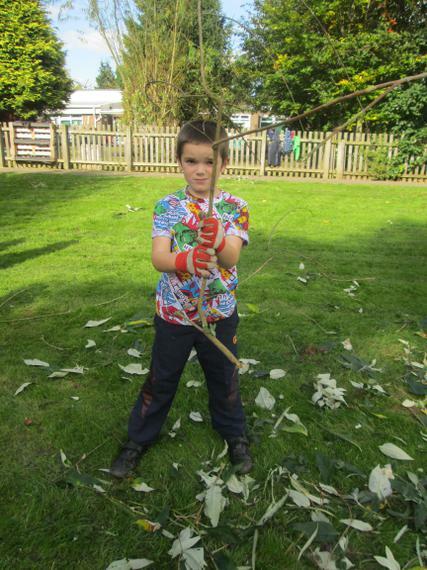 For more pictures please visit Rowan's class page. We've got an action packed week ahead of us. 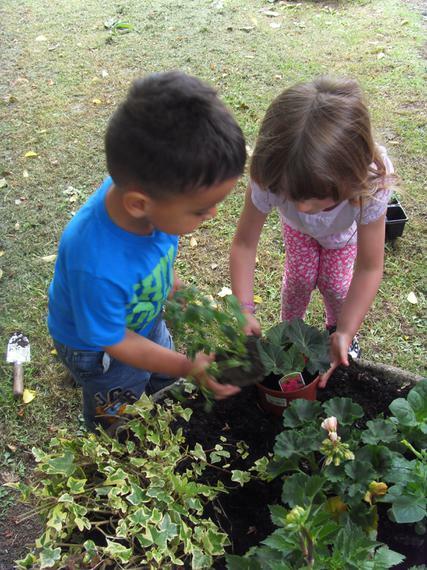 Children are learning about physical health through activity and healthy eating; emotional health and environmental health. 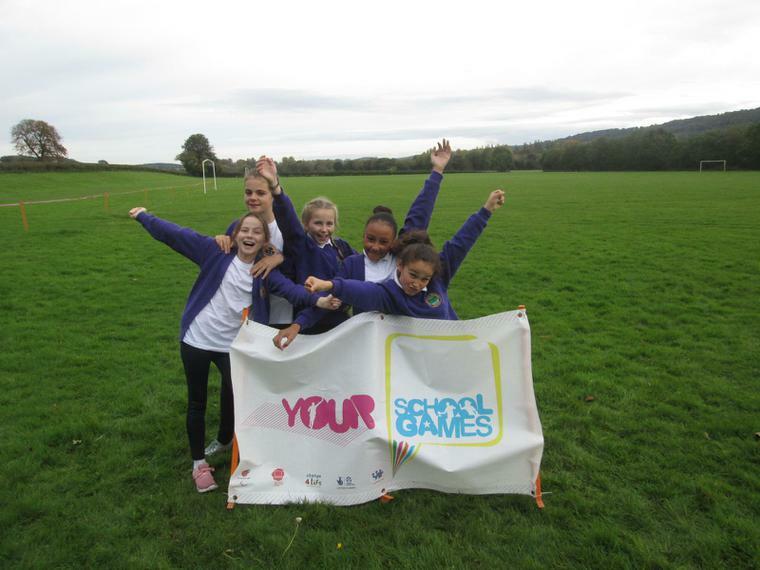 We're wearing our PE kits all week so we're ready for all the exciting events planned for us. Please look at the timetables below to see what your child's class are getting up to. 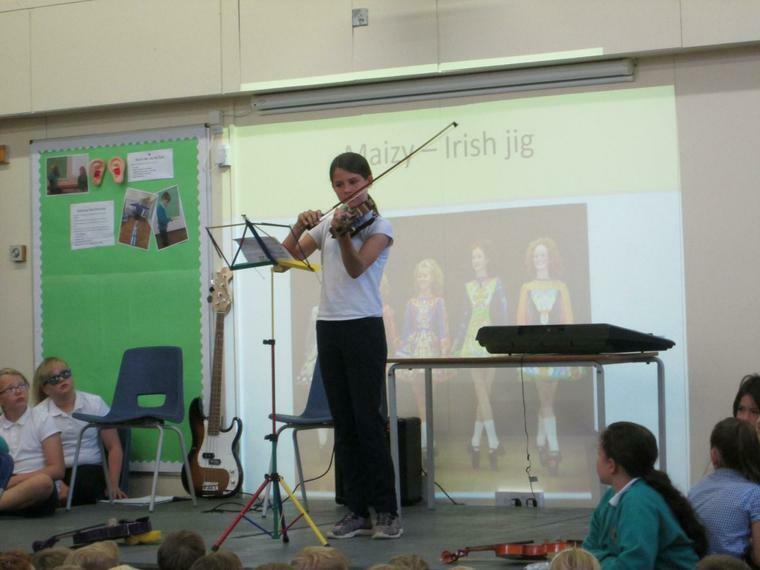 The week has started off well on Monday with a Road to Rio assembly enthusing children about the upcoming Olympics. 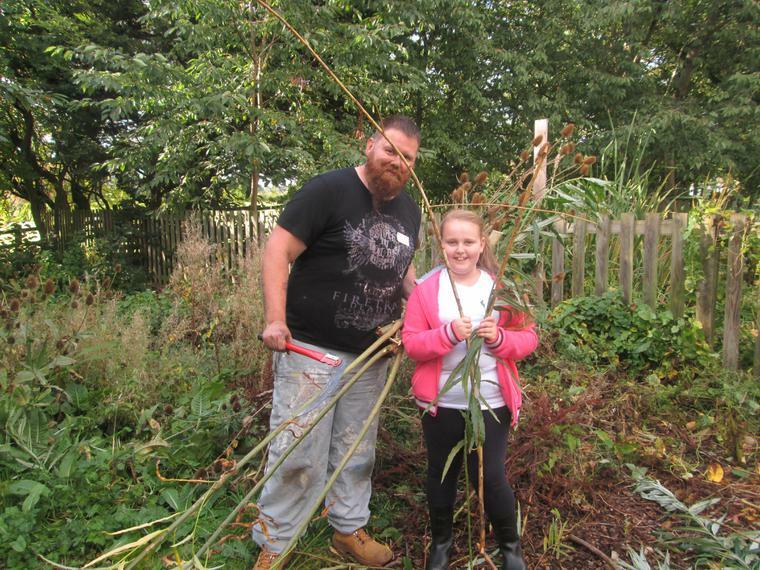 Children have had fencing, archery, Quick Sticks hockey, anxiety workshops and a bread workshop from Bondgate Bakery. Tuesday was very creative with a Star Wars lightsabre twirling lesson and a yoga class from our very own Angela Georgeson. 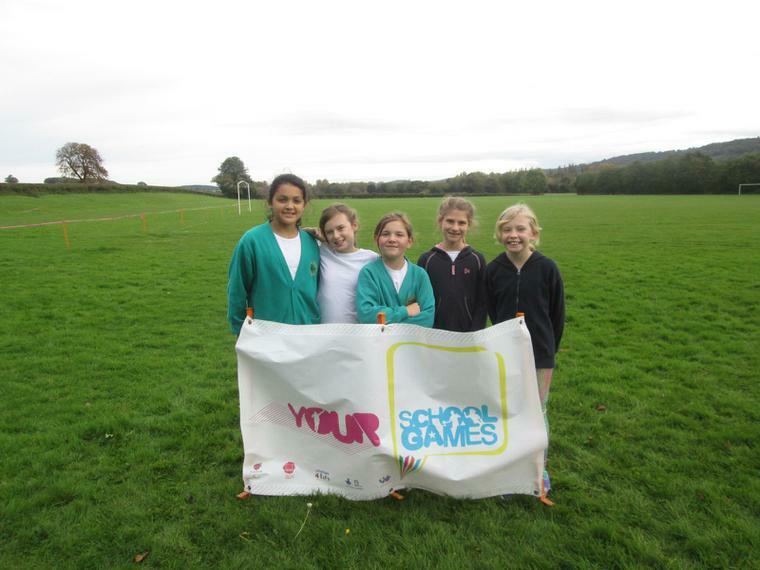 Wednesday saw children learning rugby and martial arts skills. 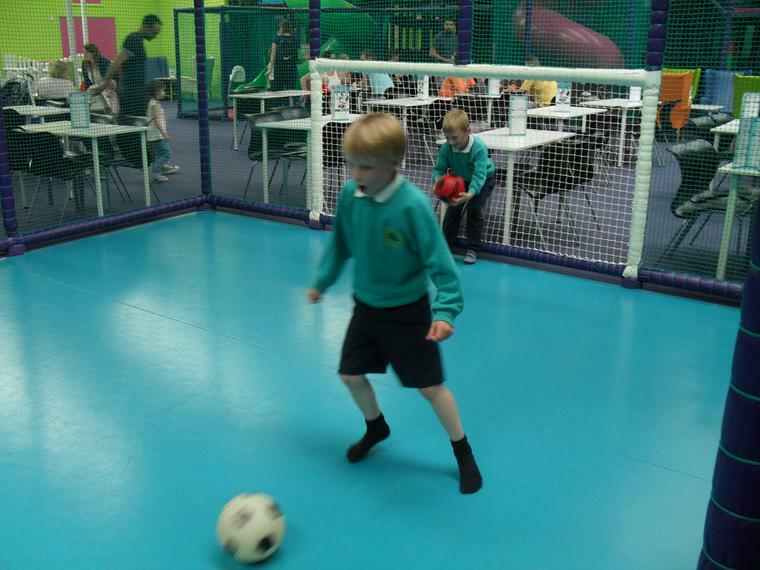 Thursday was action packed with football, drama, animal therapy and more Star Wars lightsabre twirling. Friday included Footloose dancing and more football. 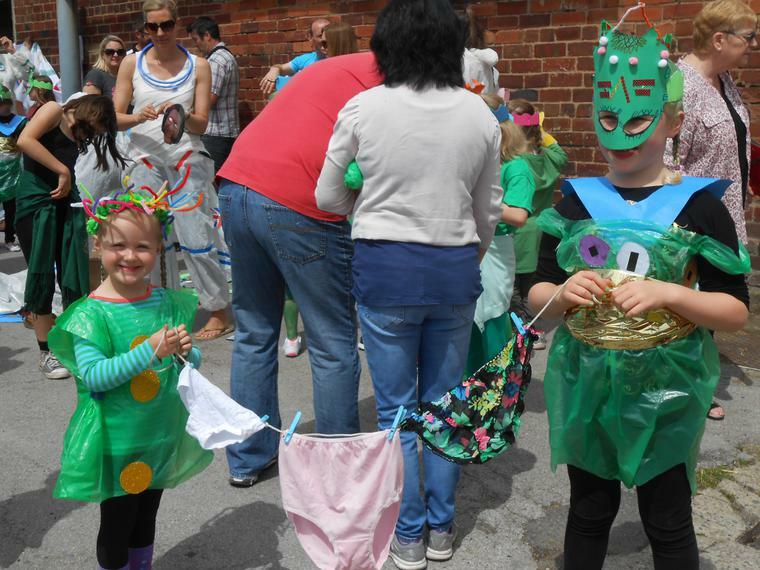 Children came dressed in their own clothes on Friday 10th June and brought a colour coded prize with them. These were all collected in class hampers. Please but a raffle ticket and you could be the lucky winner of one of seven hampers at the summer fayre on Friday 1st July. 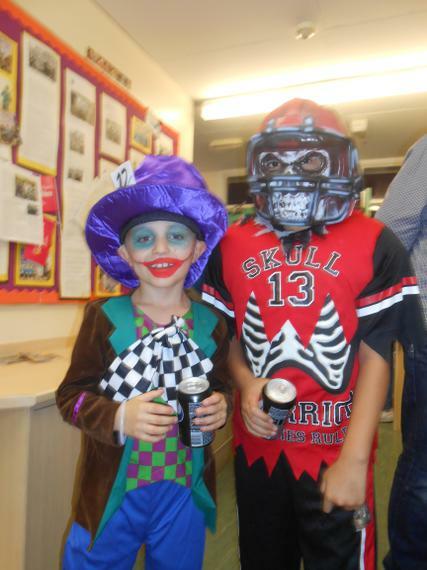 Ashfield students took part in the annual road safety quiz last night. Mr Horwood , our design and technology leader, set up a day of bridge building at Ashfield on Thursday 9th June. The aim of the day was to get better at evaluating and adapting plans as bridges were being made to a set of specifications. 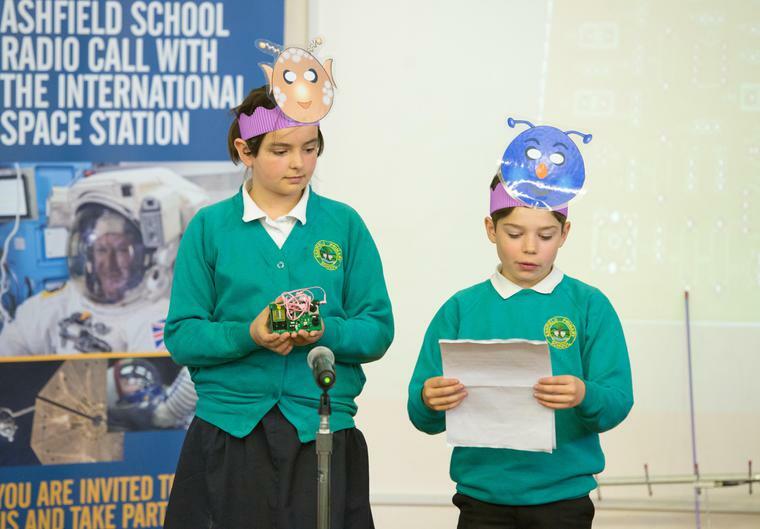 As you can see the whole school was thoroughly immersed in the project. Children made us very proud when they showed a growth mindset attitude - I can learn from this mistake. Please have a look at the class pages for more detail. Early Years will the billy goat make it? 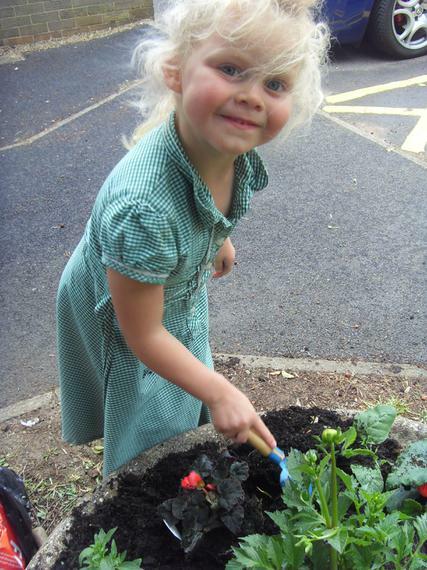 Mrs Heather Mothersdale will be teaching Year 2 Willow Class this half term as Miss Smith has moved back to London. The children have already made her feel very welcome. Thank you Willow Class. Year 6 Once again, Year 6 Oak did Ashfield proud with their positive work ethic during the formal SATs tests. They were so calm collected and mature. We will receive results early in July and then let individual children and parents know then. First we will check the marking and scores and decide whether we need to appeal against a marking decision. If this is the case we will let you know. 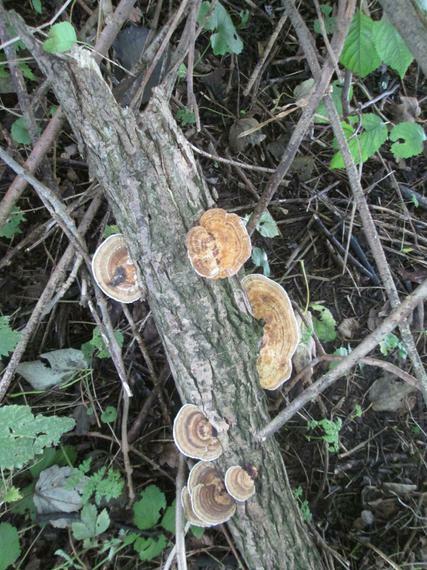 Year 2 Willow also had formal assessments. These assessments are not stand alone. They help to inform teacher assessments, based on the work they have done this year as well as the task they completed in May. We will let you know your children’s levels assessments in the end of year reports. 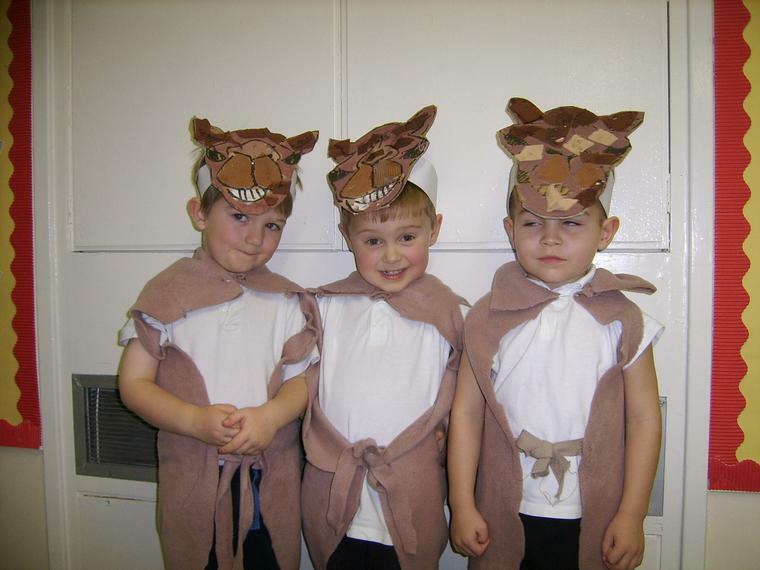 Year 1 Silver Birch phonics tests will take place in the week beginning 13th June. You will be informed of these results in your reports. This will be completed with a teacher on a one to one basis. The children are used to reading phonemes and words when we assess them most half terms for Read Write Inc. groups so this process should not worry them. I am so proud of everyone at Ashfield today. Your children were absolutely amazing. 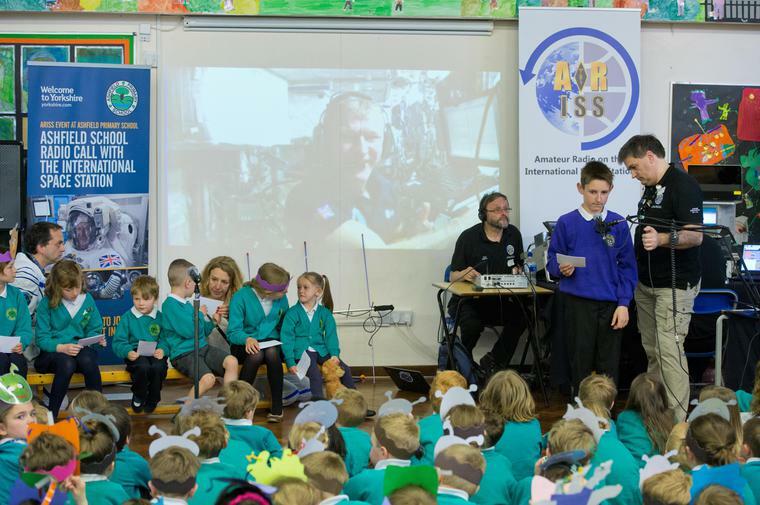 Each class presented some space related work to the school, visitors and a world wide audience on the internet. They showed so much enthusiasm and interest for their own presentations and each others. They were an absolute credit to you and Ashfield. 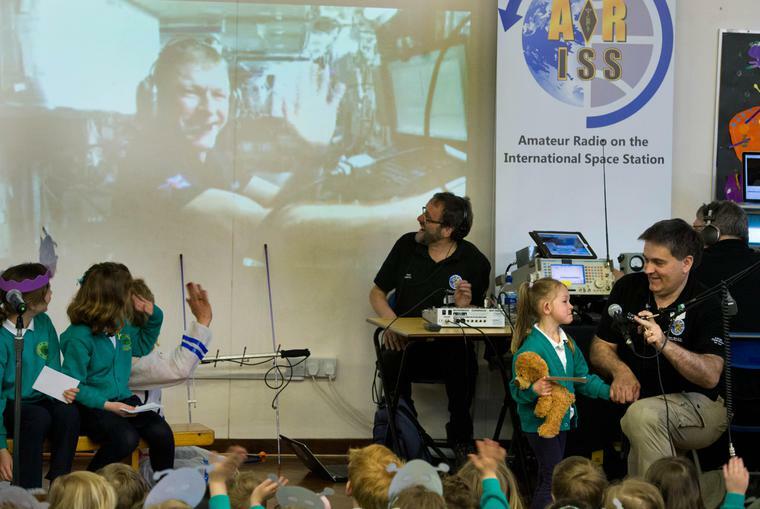 It is now only 7 days until our live link up with Tim Peake on board the International Space Station! 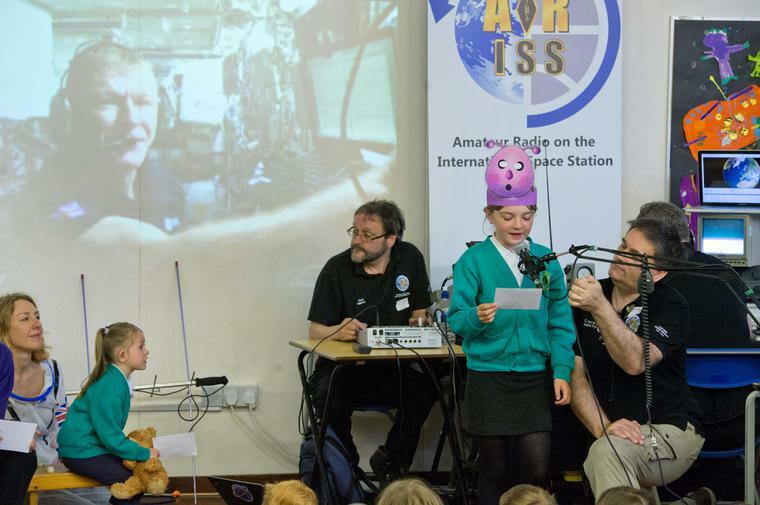 On Thursday 5th May crew will arrive at the crack of dawn to facilitate Ashfield children speaking to Tim. 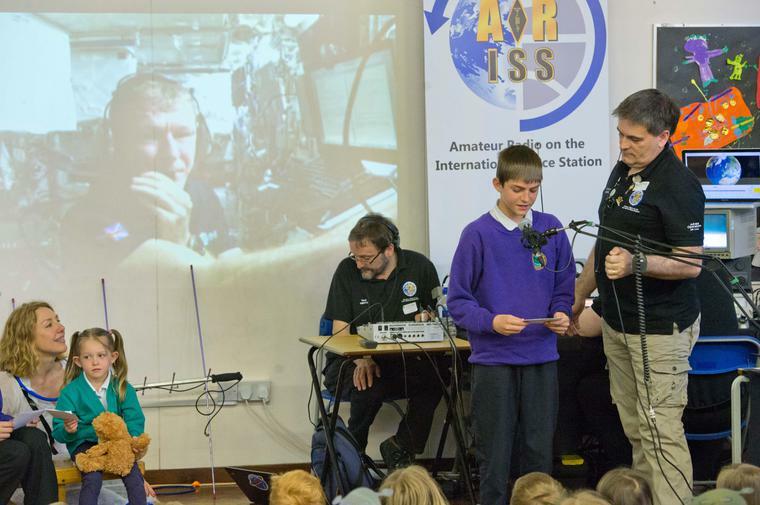 The linkup will be streamed live on the internet at https://principia.ariss.org/live/ and will also be shown on the big screen in Millennium Square in Leeds. 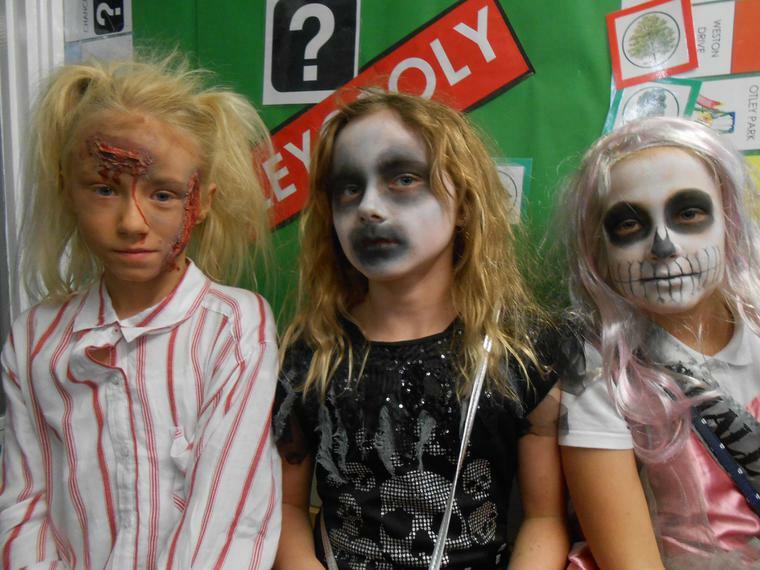 Children will need to arrive by 7:45am to be registered and into the hall by 8:00am. 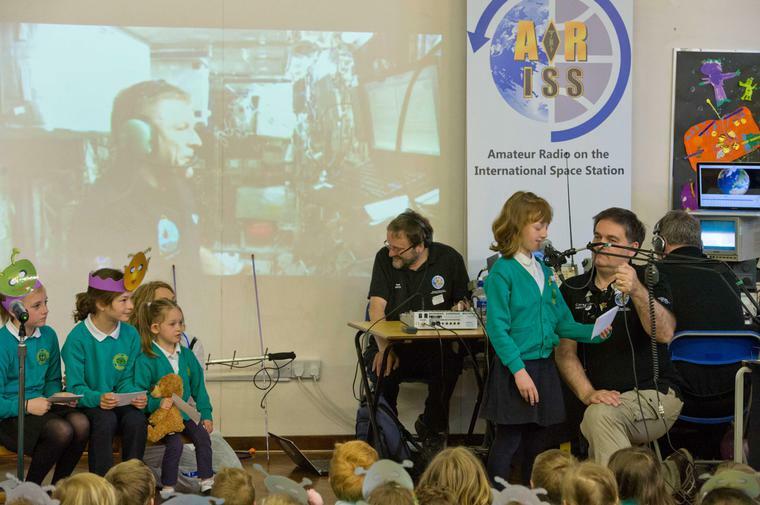 We will then stream a live production which will include work Ashfield children have done around our space topics including songs, poems, biological experiments with seeds taken to space, making crystal radios and rockets. 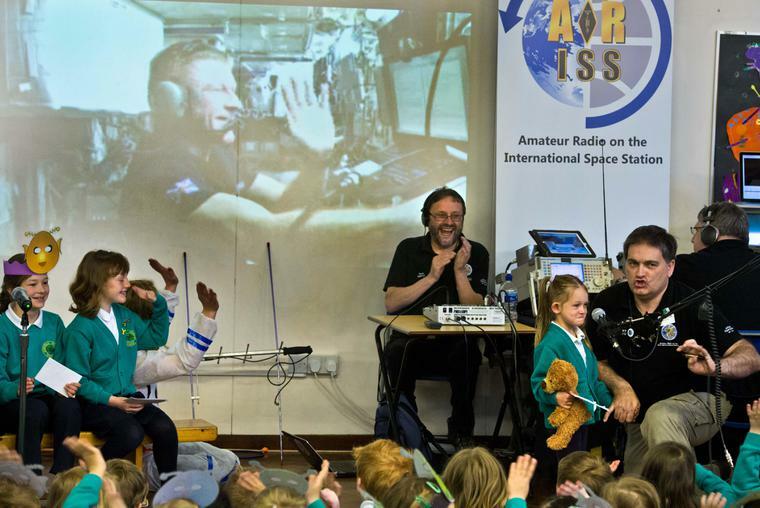 At 9:08am the live link up to Tim will commence and 10 children will ask Tim their questions. These have been chosen by ARISS in advance from a long list of 120 that Ashfield children wrote. 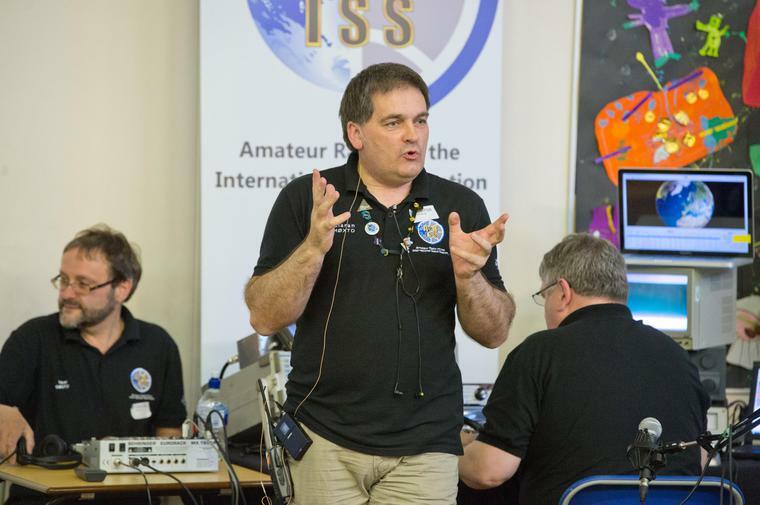 They were chosen by ARISS for their uniqueness and originality and will be answered live by Tim. Because all of the above will be live streamed on the internet it will be difficult if children arrive after 7:45am as it will cause noise and disruption. If you cannot make it to school at 7:45am, please bring your children for 10:00am instead. If either of these two options are hard for you, please let us know so we can help find a solution. 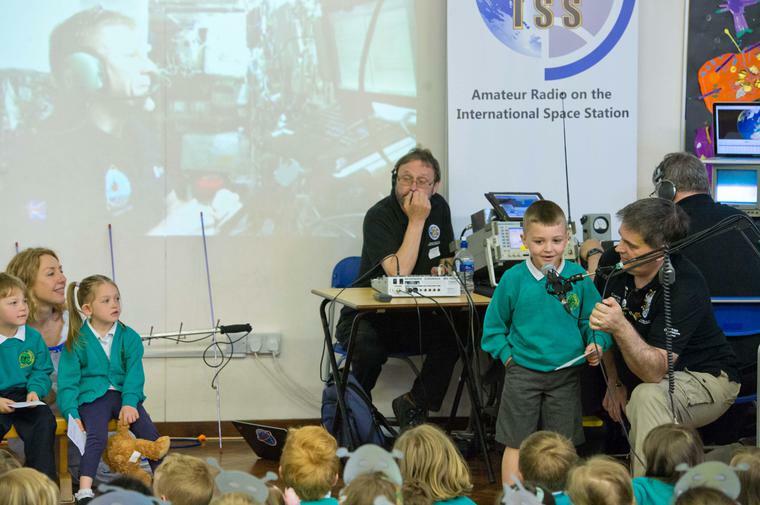 Unfortunately, we had no say in the timing of the event, as it is all dictated by the location of the space station in relation to the school to give the longest contact time with Tim. 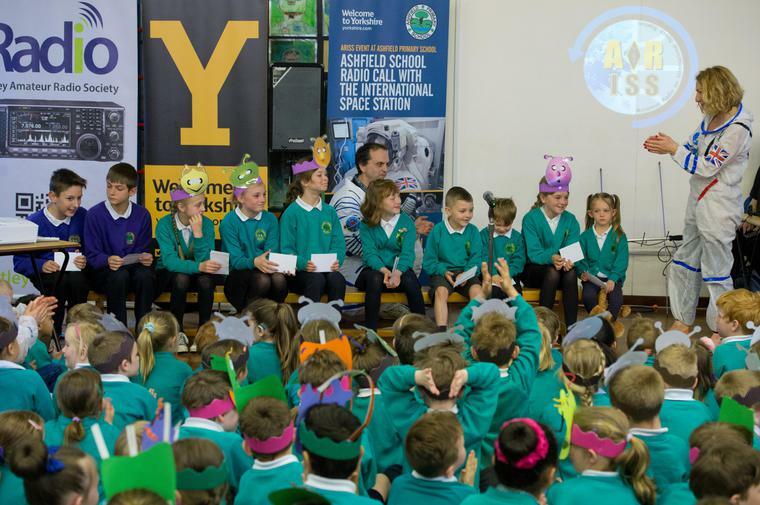 Children should wear their smart Ashfield uniforms so they are ambassadors for the school. 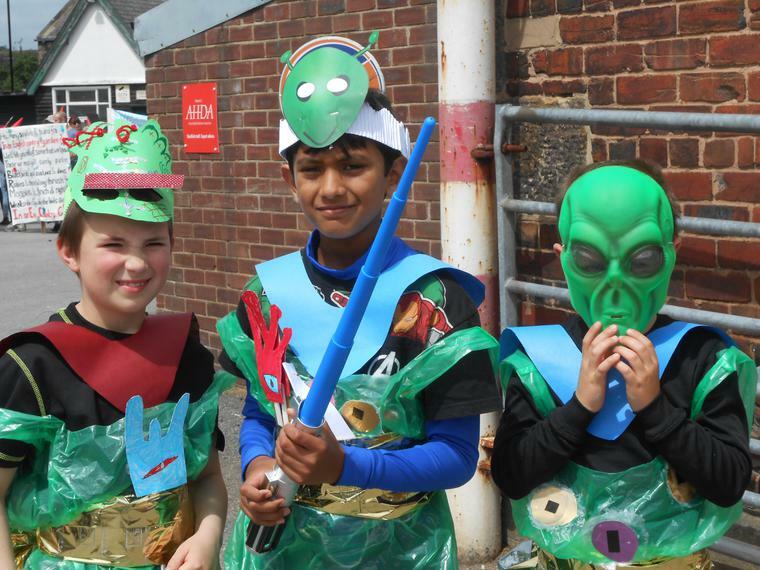 They are making alien masks in school, which they will wear to show off our space theme and give a real primary school flavour. 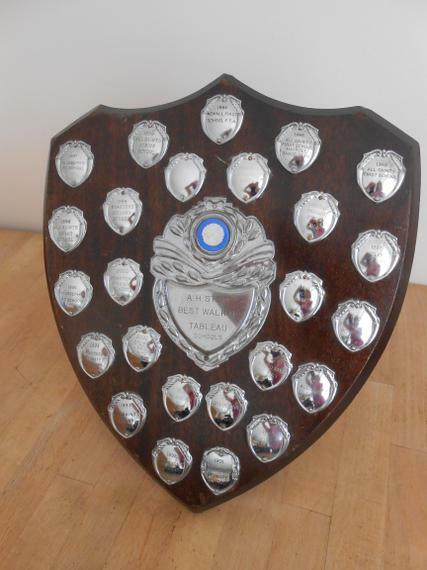 Of the ten schools who won this prize we are the only 3-11 primary school in the country! This Saturday 15 children represented Ashfield in a ceremonial cycle prior to the main men's race. They cycled from Manchester Square / Boroughgate to Beech Hill car park on Westgate. Lot's of people were there lining the route to wave and encourage them. Thank you if you were among the crowd. Ashfield's proud cyclists warming up the route for the men's race. 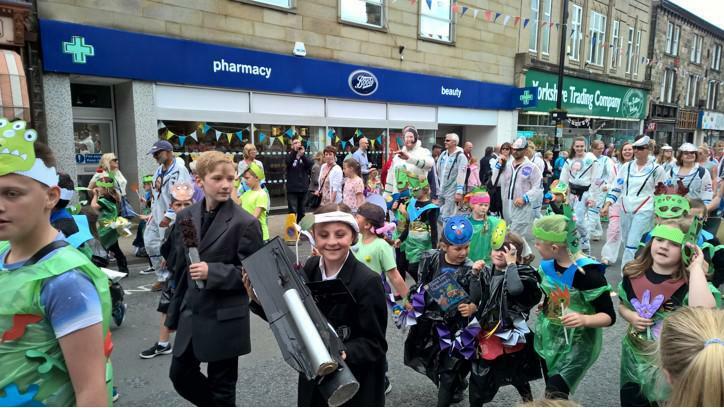 Ashfield Primary School leads the Tour de Yorkshire through Otley! 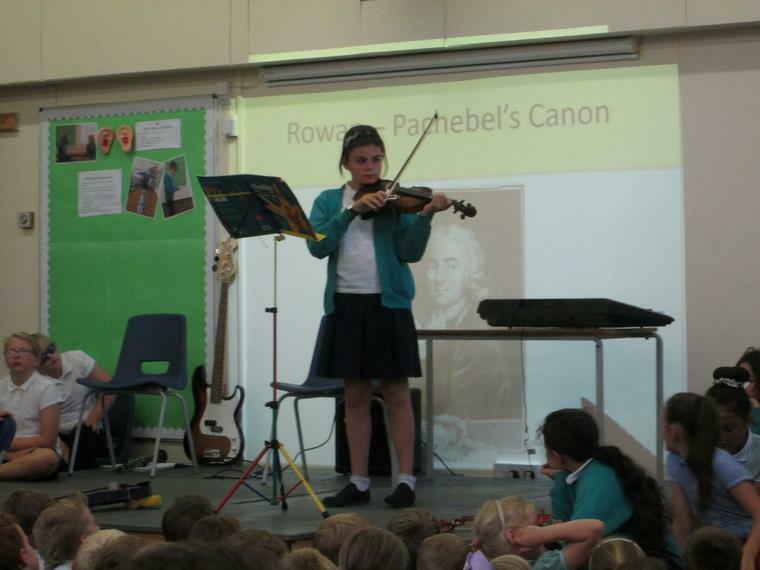 "Thank you all so much for giving me the opportunity to come into your lovely school. 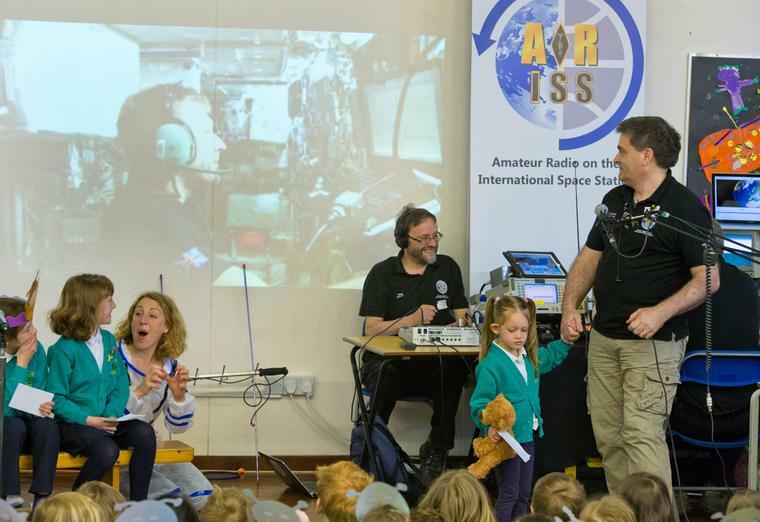 The children were fantastically behaved and interesting with their questions etc., you should be very proud of them. As I left in my car, paused to let a little boy and his mum cross the road, he pointed and shouted out "that's an author". Really made my day, bless him. Keep up your amazing work." It's that time of year again and Ashfield pupils, staff and parents are donning their bicycle helmets and heading in on two wheels instead of four! Two weeks of pedal pushing with the promise of glory at the end of the fortnight. No mean feat, as Yorkshire at this time of year can throw hail stones, rain, wind and even snow at us - but we keep on pedaling with true grit. For the last three years we have earned the top spot out of all schools in Leeds, been in the top ten in Yorkshire and managed to score enough points to finish in the best 200 overall out of thousands of schools across England, Ireland, Scotland and Wales. Scores are based on the percentage of school members who cycle or scoot to school all fortnight out of the schools full capacity/potential (including parents and staff!). Hopefully this year we will see equivalent success! 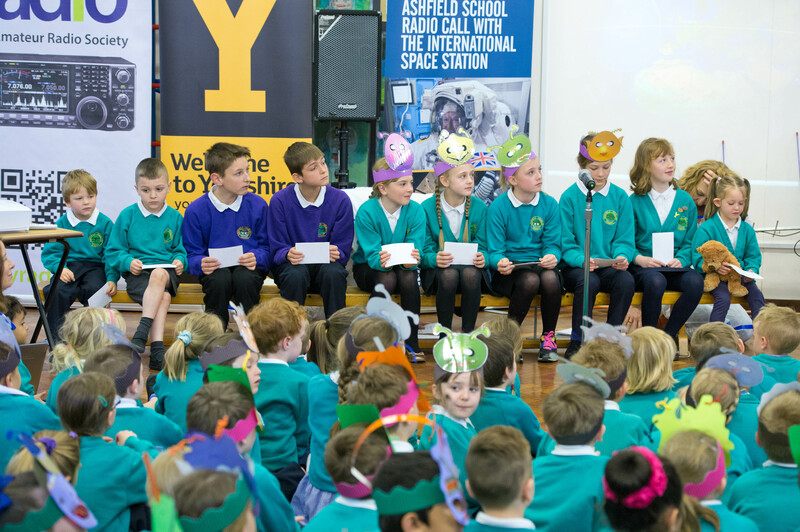 Last year in May 2015, we had election fever in Ashfield as we put on a mock general election. We wanted the children to understand one of the British values of democracy. 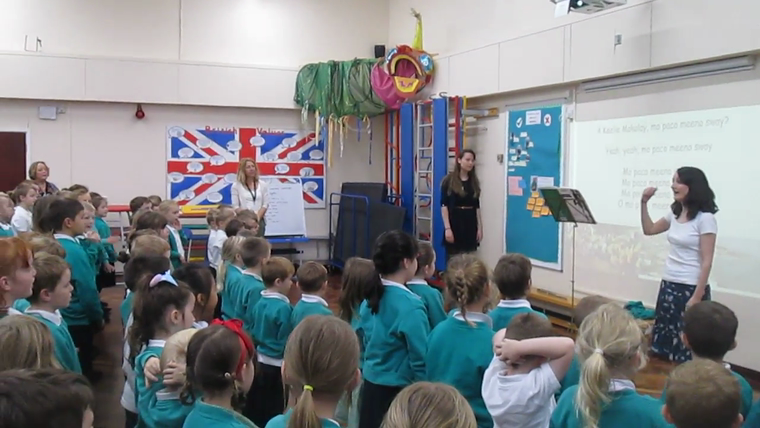 To follow up this good start, we have invited in members of political parties to talk to the children about what being British means to them. In January we had Natalie Bennett from the Green Party. Today, Thursday 28th May, Nick Rutherford of the Labour Party came to talk to the children and on Tuesday 2nd May Pat Latty from the Conservative Party will be joining us. 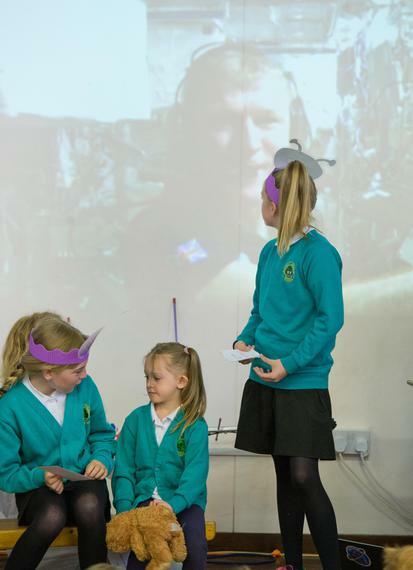 Your children asked some thought provoking questions, which has certainly made our visitors think. Invites have been sent to all other major political parties - just to make sure we are completely impartial. International Guinea Pig Day or Sports Relief 2016? We skipped in relay throughout the day. Look at Class Pages for more images. Yes the staff squeezed into child sized T shirts! 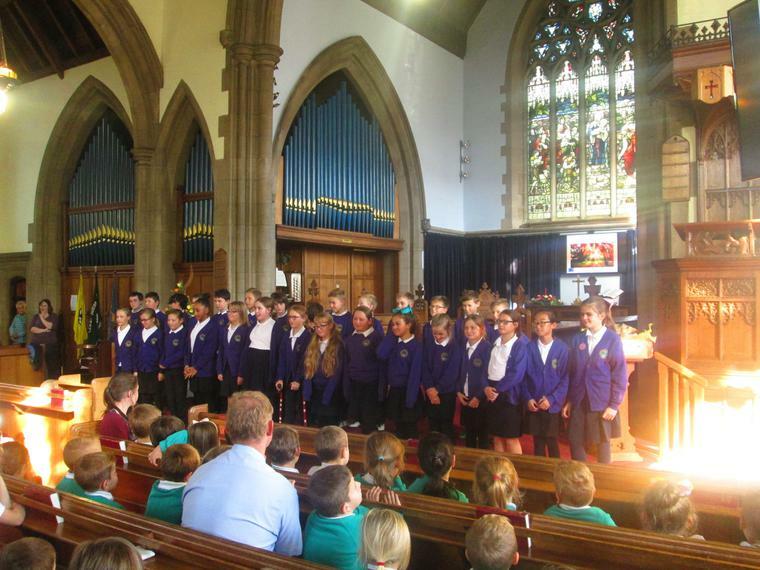 Ashfield KS2 Choir sang "Three Little Birds," "Sunshine" and "Sing" at a concert with all the Family of Schools. It was lovely to join in with all the other Otley, Pool and Bramhope children and staff. 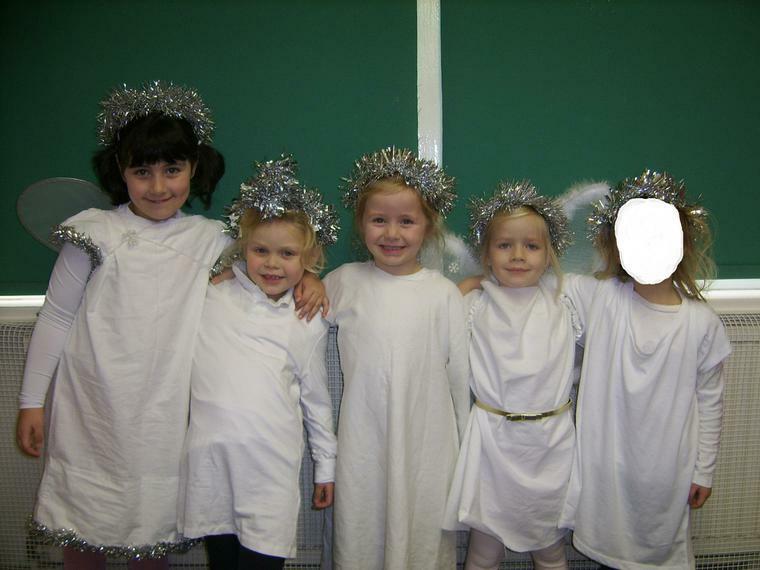 Our children not only sang like angels, they also were impeccably behaved during rehearsals and waiting back stage. 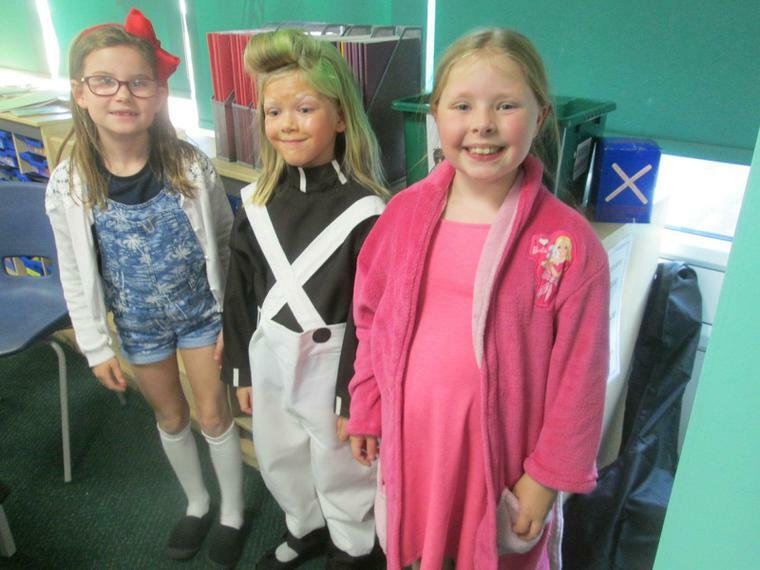 Can you guess which characters the children came as? 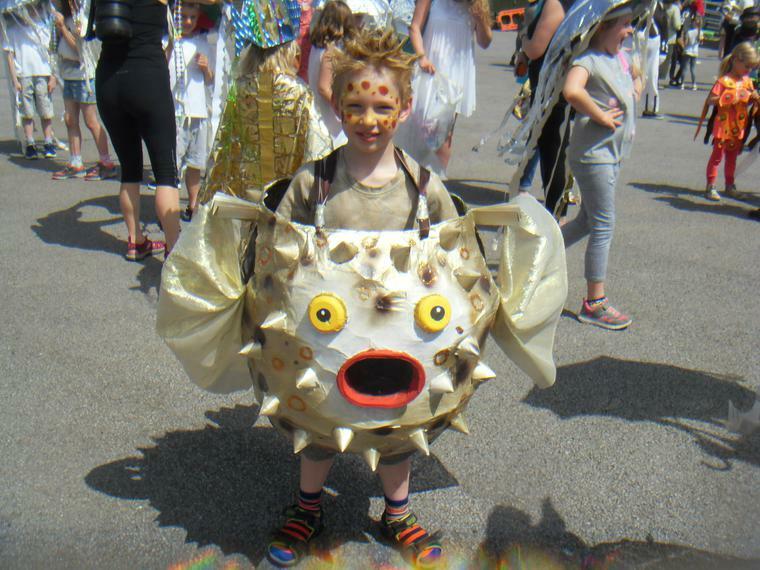 Thank you to all adults who helped to create such imaginative costumes. A huge thank you to Mrs Willford for leading our bid for re-accreditation. 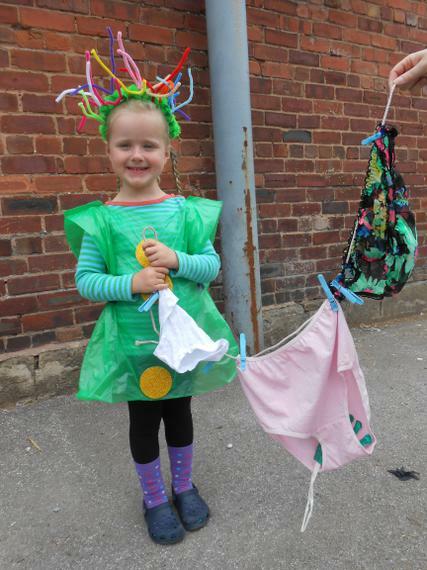 She put a lot of energy into making sure the assessor saw all the healthy things Ashfield has to offer. 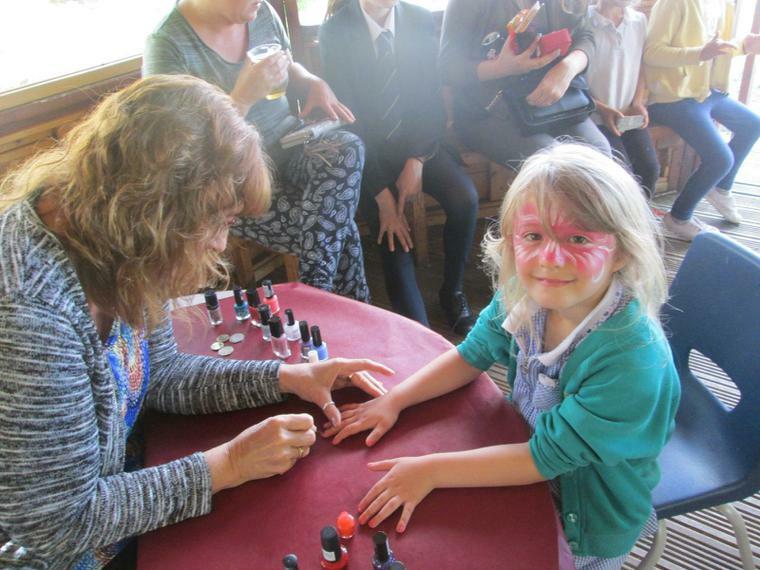 We're glad that you enjoyed our Mother's Day celebration in Early Years. 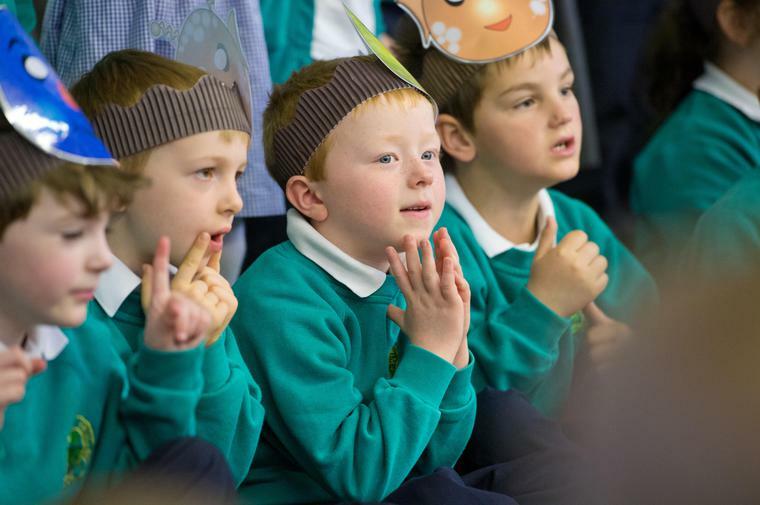 Children could invite their special adult into school. It was lovely to see dads, grandparents and aunties celebrating with us. 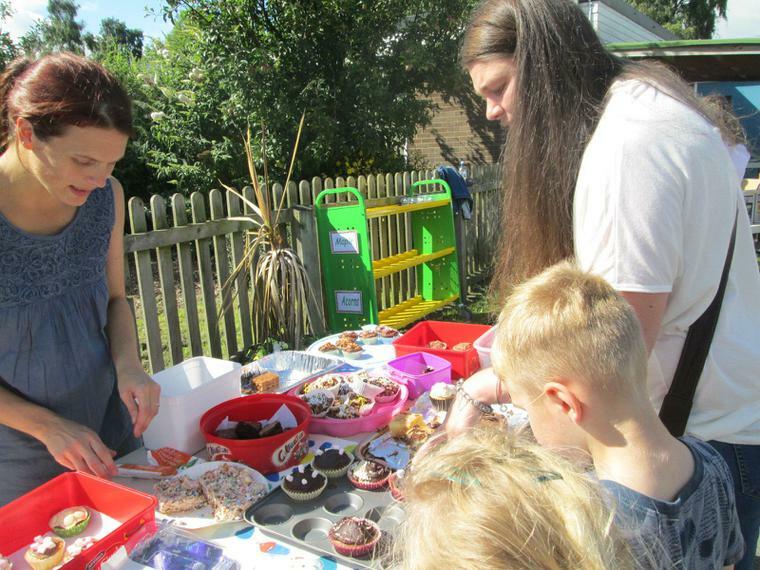 Buns were baked, Cards were painted, playdough was sculpted, songs were sweetly sung and adults the child's special adults were given a huge hug. "I just wanted to send a big thank you to the Early Years team for the fantastic Mother's Day assembly today. 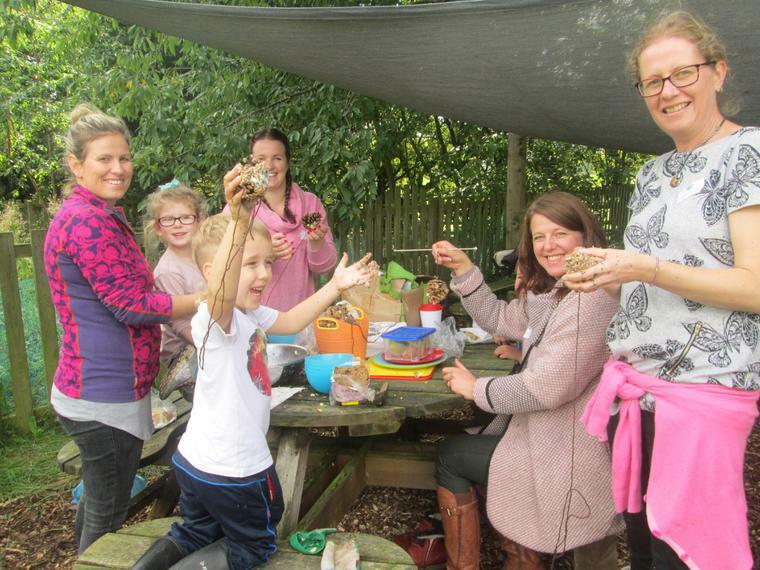 It was clear that all the staff had gone above and beyond to make this event so special, even making buns in their own time! The songs the children learnt were so lovely and the flowers and card were a very personal touch. My daughter has really enjoyed keeping the details of the show a "secret" from me (in a way that only a four-year old can!) 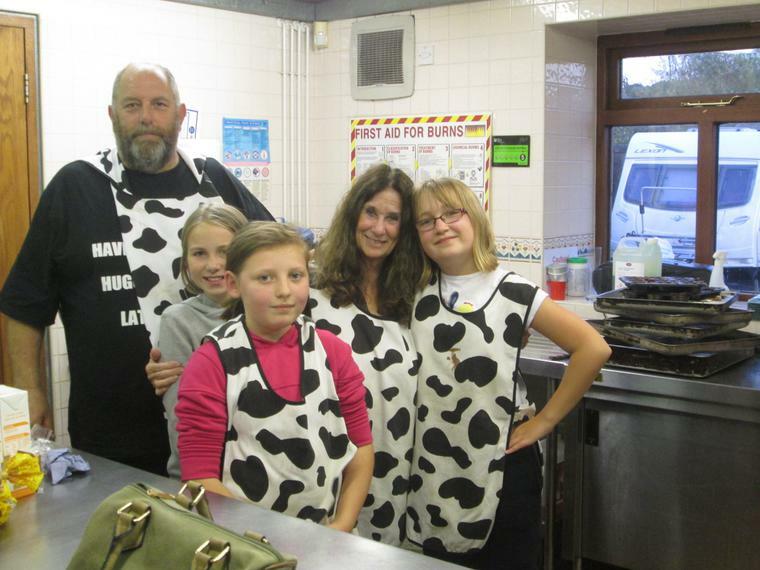 It is occasions like this when I feel so privileged to be part of the Ashfield family." 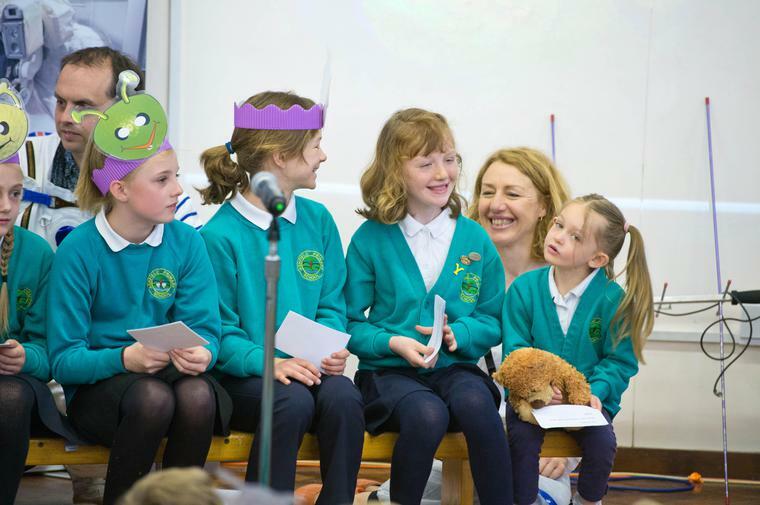 "I just wanted to say how wonderful I thought the Acorn's Mother's Day assembly was today. To invite the mums and other carers in to school- have such lovely songs, cakes and cards....it was really special. As a mam, thanks for such a great memory and as a governor, thanks for all the time and effort that was put in. 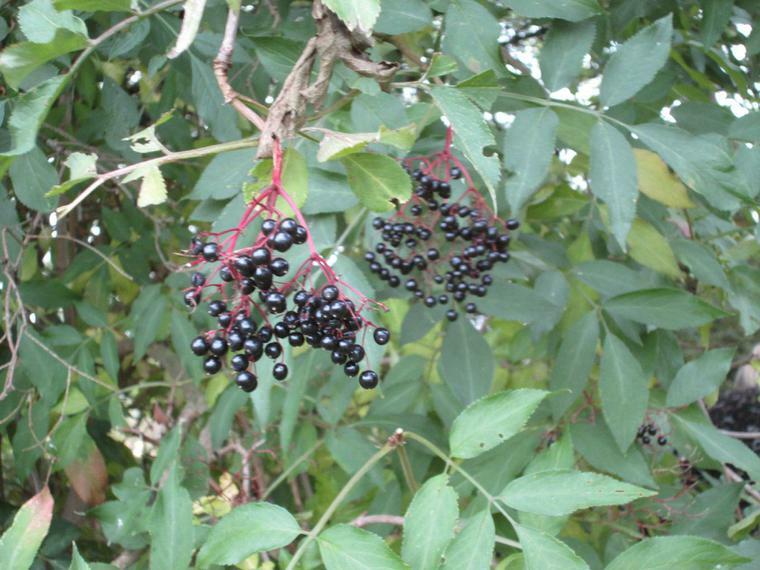 It is with good reason that the nursery has such a great reputation." So we must say a big Ashfield thank you to our parents and carers in turn. It's the home / school partnership that counts! 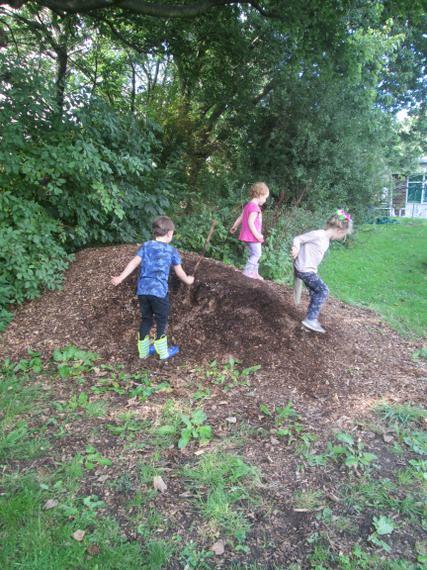 Elm, Rowan , Larch and Silver Birch were all eligible to play. Rowan rolled and landed on Chance! Elm Class also landed on Chance. They won tea and cakes with me - Yeah! We are very excited today to be hosting a Science, Technology, Engineering and Maths Festival at Ashfield. All the classes are putting on stalls to inform , challenge and entertain each other. 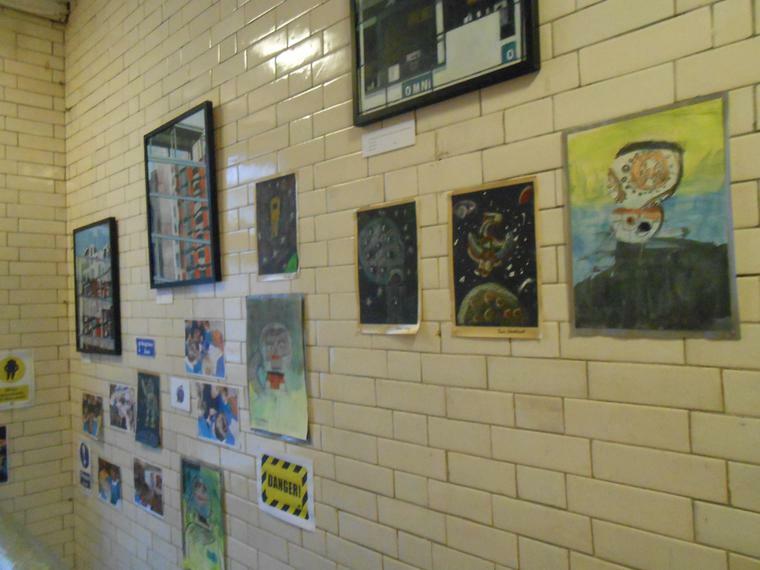 We also have visitors from all the local schools: All Saints, Bramhope, PHGS, Pool, St Joseph's, Westgate and The Whartons who have also designed interesting exhibitions to share. 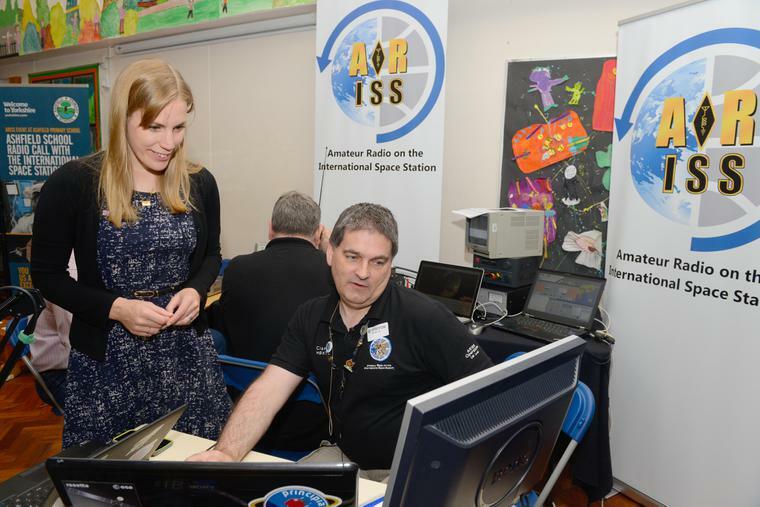 Exhibitors from Otley Amateur Radio Society, Leeds University, Radio Society of Great Britain (RSGB) and Eureka Museum. 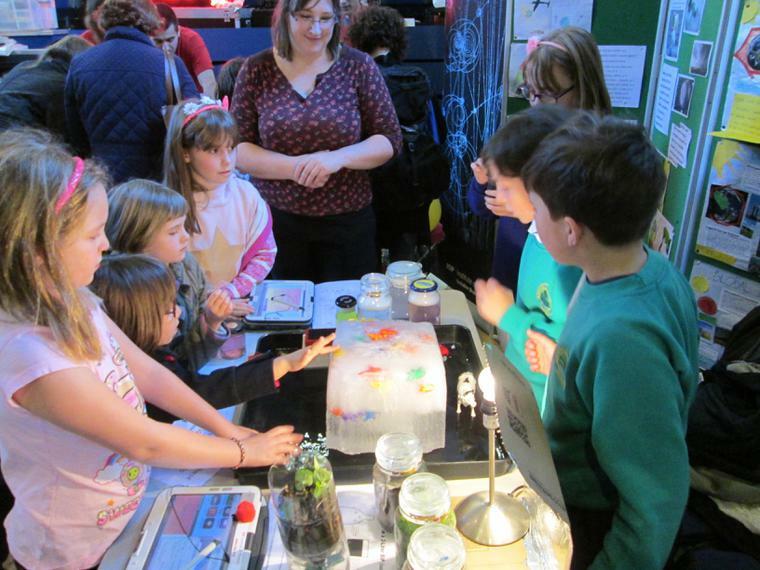 Here is a flavour of all the exhibitions your children had the chance to visit today. 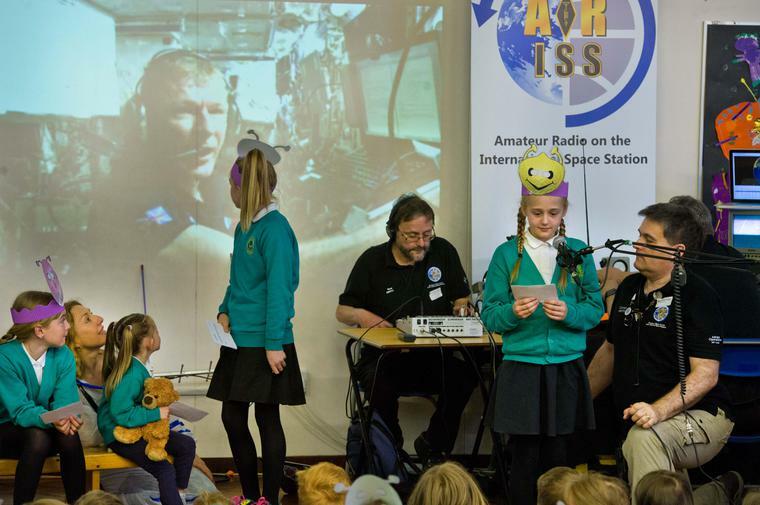 Don't forget Dr Marty Jopson's science show at Ashfield tonight at 6pm or 7pm (ticket only due to fire regulations). 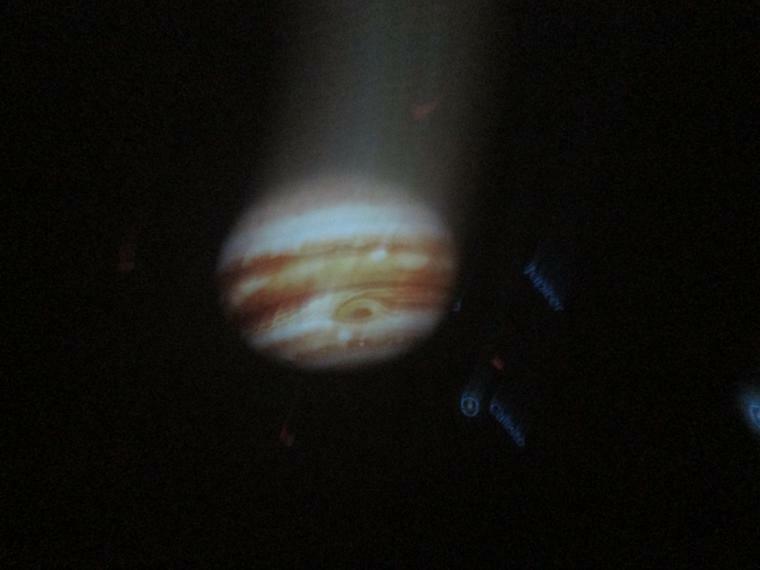 You can also have a chance to see Bradford Astronomy Society at work. Let's hope it's a clear night! 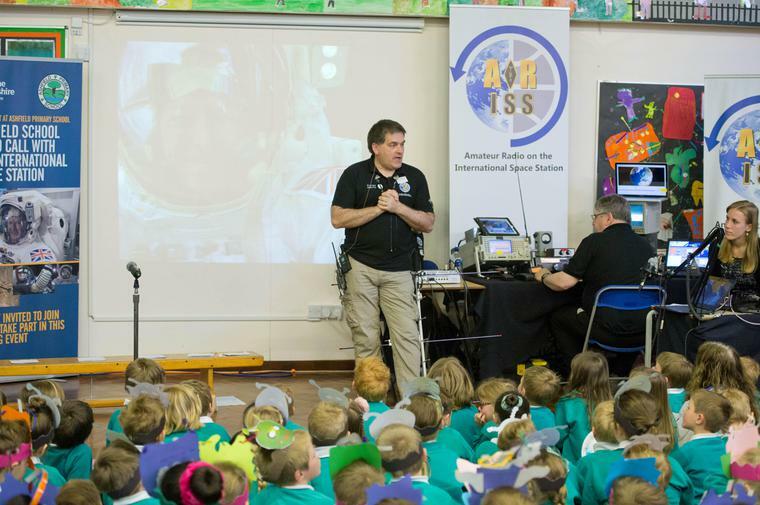 Marty helped to plan Ashfield's bid to link up to Tim Peake on the International Space Station. 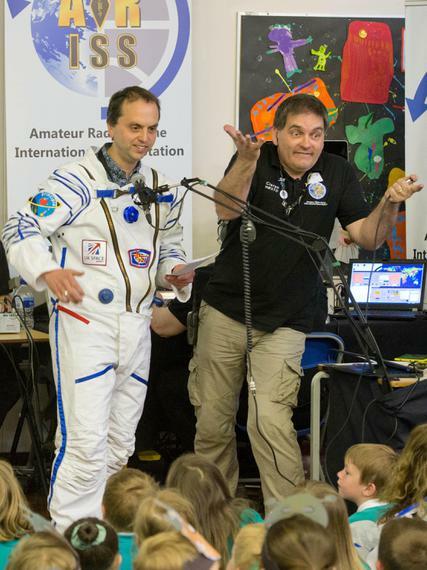 Part of the bid was for Marty to deliver a science show all about being in space. 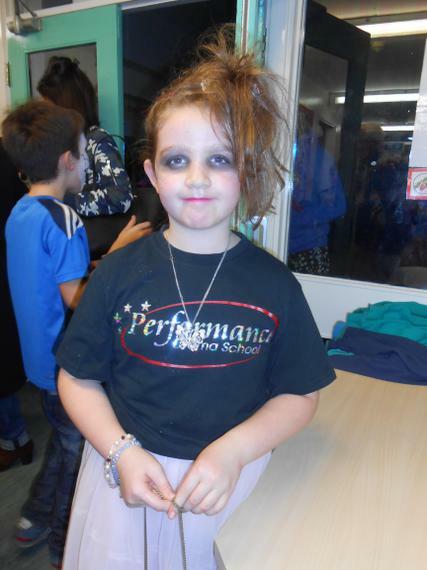 Here are some photos of the evening performance. 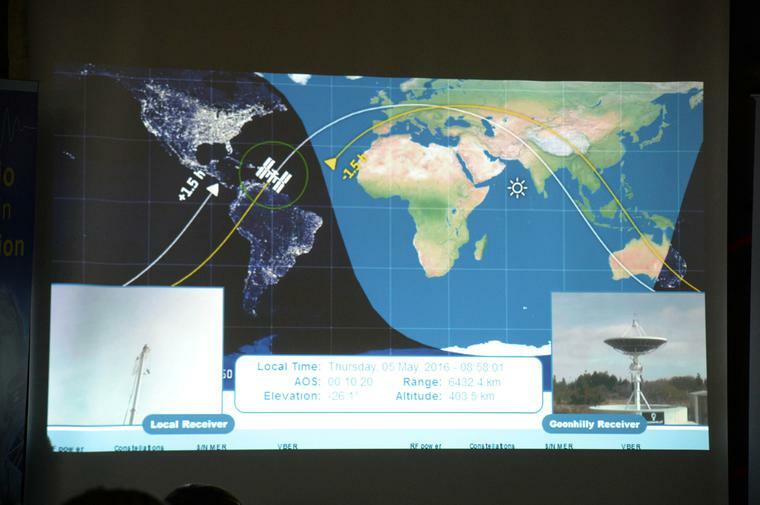 So fast I didn't catch the rocket! I hope you all have a relaxing half term. We come back to school on Monday 22nd February. This month we sold 160 books at our book fair, which meant we earned £560 of commission, which bought us 99 books. I hope your child/children enjoy one from the school library soon. Thank you to everyone who supported our book fair. I hope you have all managed to secure a convenient time slot to meet with your child's teacher. If not, please let us know and we will make an appointment to suit you. Please take the time to fill in our parent / carer questionnaire as you visit - we value your opinions. Britain is a democracy. As part of our work on British values, Ashfield closely followed the run up to the 2015 May general election and we had our own election with a secret ballot. We are following this up looking at each political party and asking them to say what they believe are British values. This week Natalie Bennett of the Green Party came to speak to the children in assembly and answer their questions. We are of course inviting representatives of other political parties to talk to the children and answer questions over this term. If you have any suggestions of potential guest speakers, please let us know. I've been watching maths all around Ashfield this week. 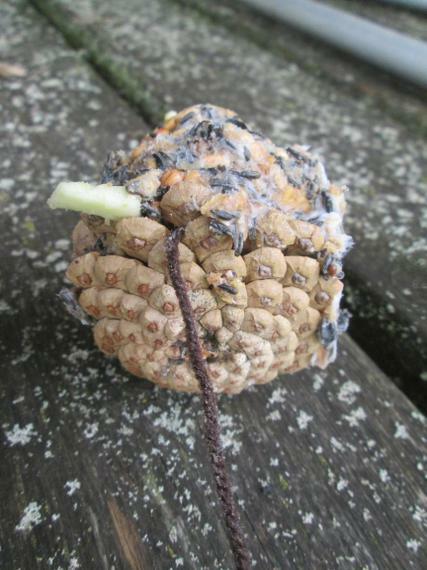 The photos above are from Acorn pattern making. I hope you enjoy seeing your child's work next week in parent consultation evening (03:02:16). You will also be informed of workshops for parents to show you how we are learning maths in school and some activities and games you can play with your children at home. 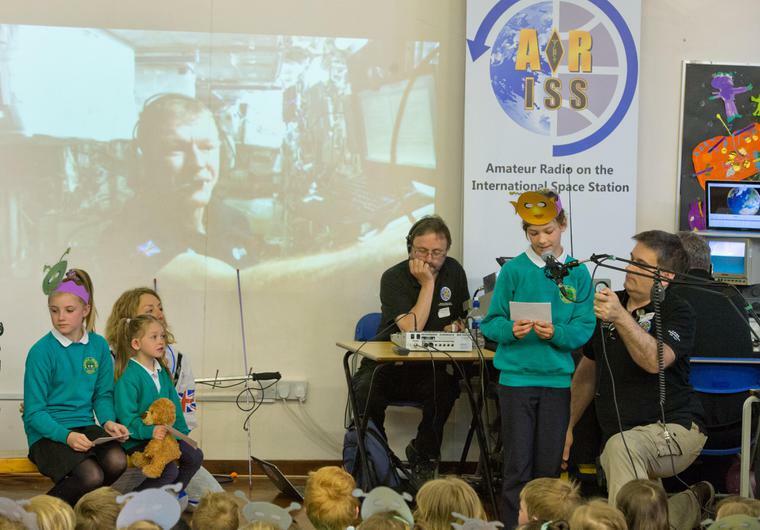 Around Ashfield the children have been following Tim Peake's Space Exploration on board the International Space Station. 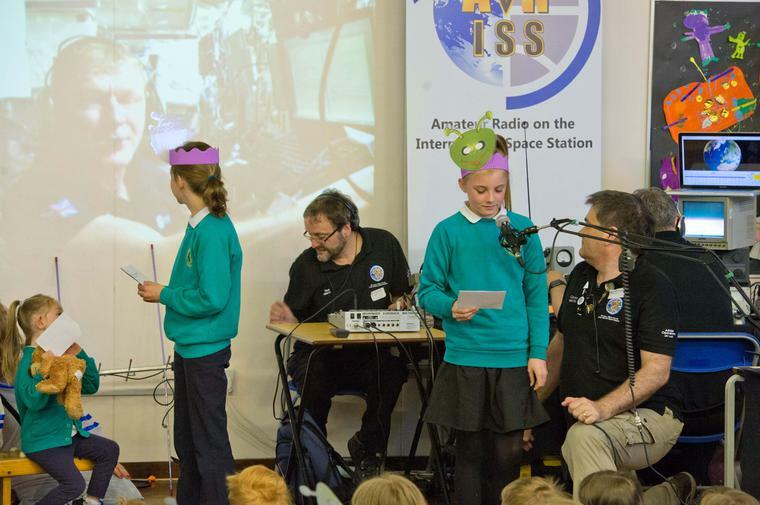 We watched and listened to Sandringham School, the first of the ten winning schools, having their live radio link up to Tim on 8th January. 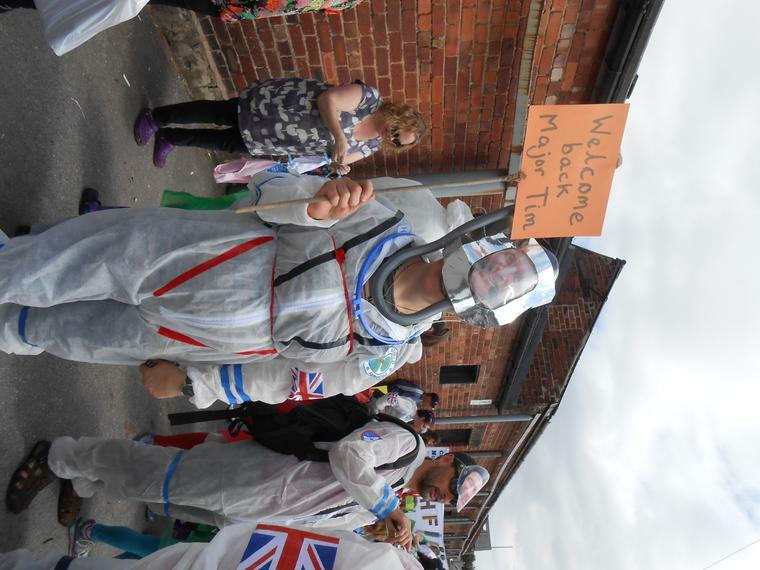 We're busy with space related projects as we look forward to our turn to talk to Tim. 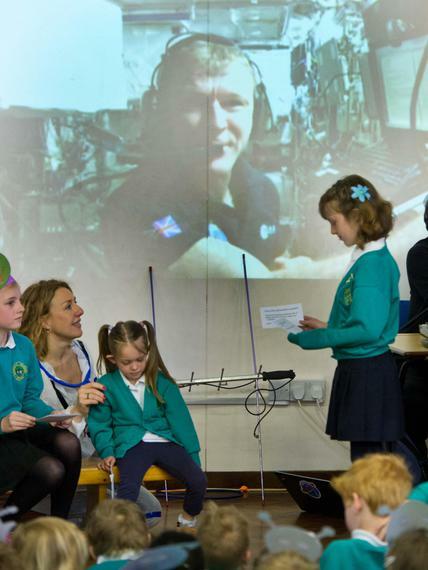 The photos show some letters, art work, and modelling of the International Space Station. We'll let you know as soon as we know the date of our live link up to the Tim. What an amazing Christmas celebration! 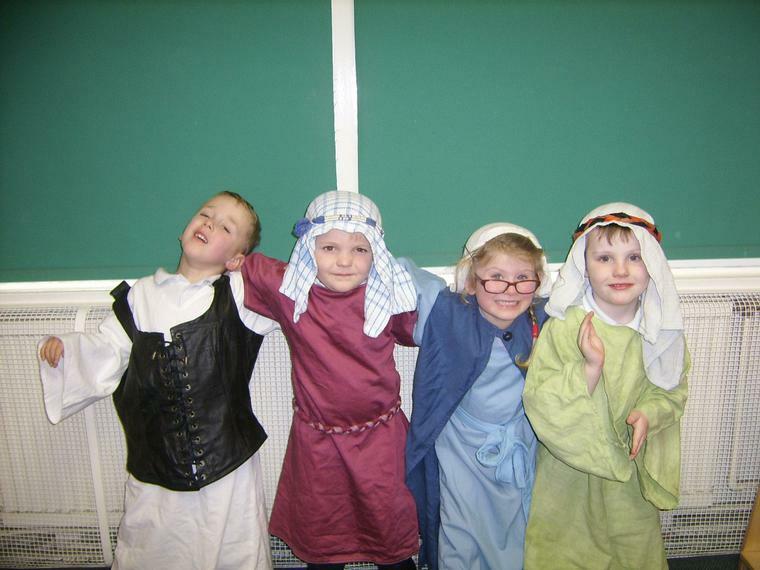 KS1 children were superb at telling the Christmas story so clearly with words, songs and acting. 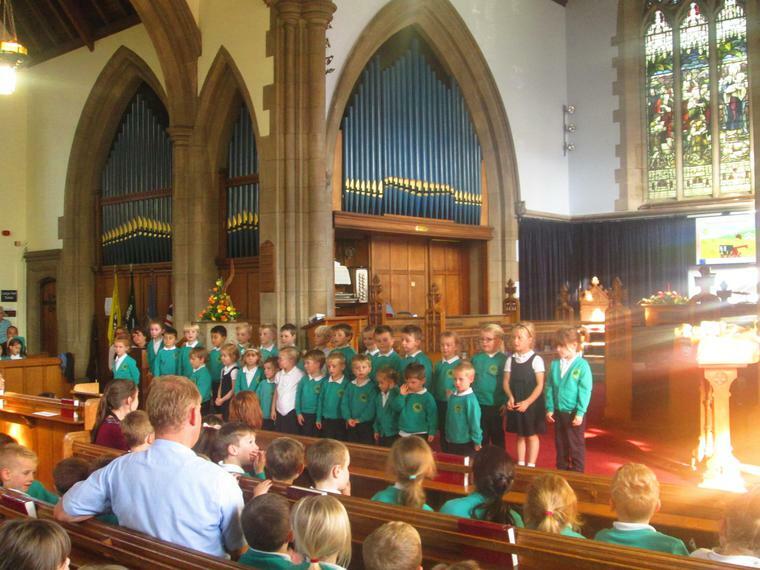 Early Years and KS2 children helped the carols to sound so full in the church environment. 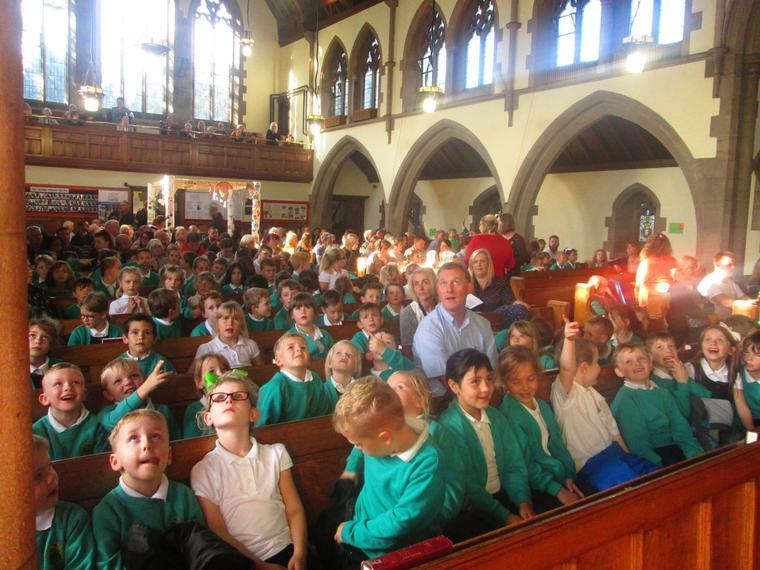 All children were so sensible with the candles - with any other children I would have been very nervous, but we know how reliable Ashfield children can be. 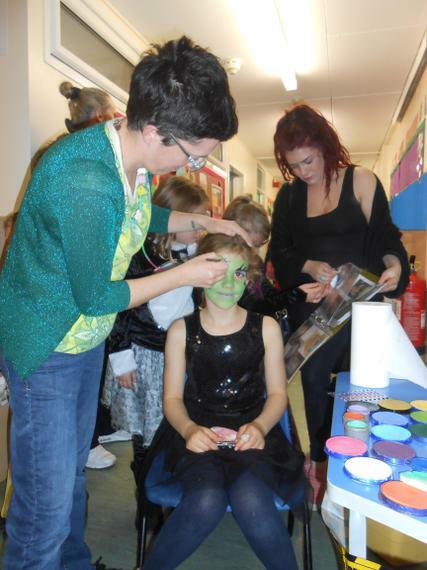 What made the event extra special was the amount of parents, carers and extended family members who found the time to join us. We really appreciated your support. Thank you. 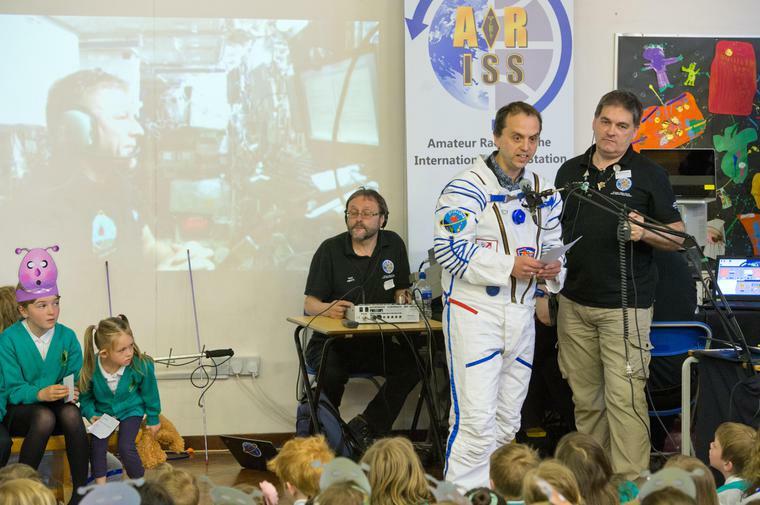 Children are watching BBC1 Blast off Live on Tuesday 15th December at 10:30 am, with Professor Brian Cox and Dara O'Briain, in preparation for talking to Tim Peake on the International Space Station in 2016. Why not set your televisions to record? Thank you to our parents and friends for coming along to support us. 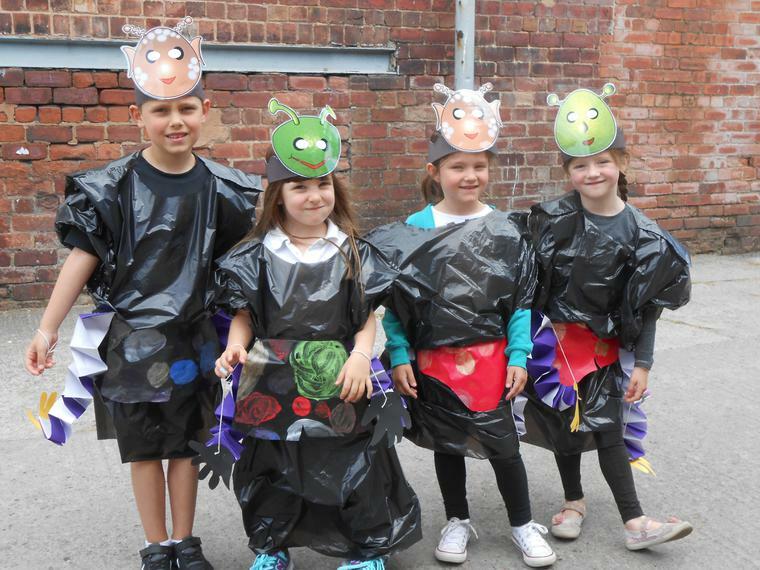 Otley was named as the start of the second stage route and five Ashfield children got to represent the town at the launch today at Otley courthouse in Otley T shirts. 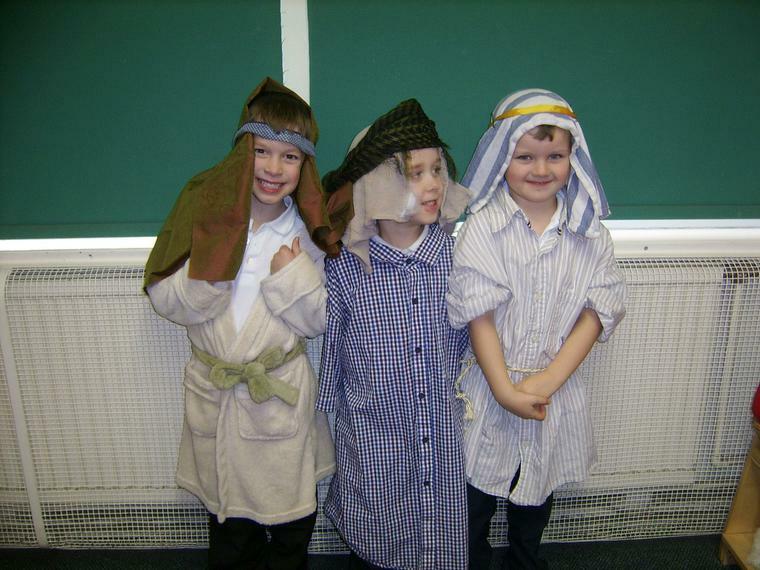 Maple Class presented a super nativity. 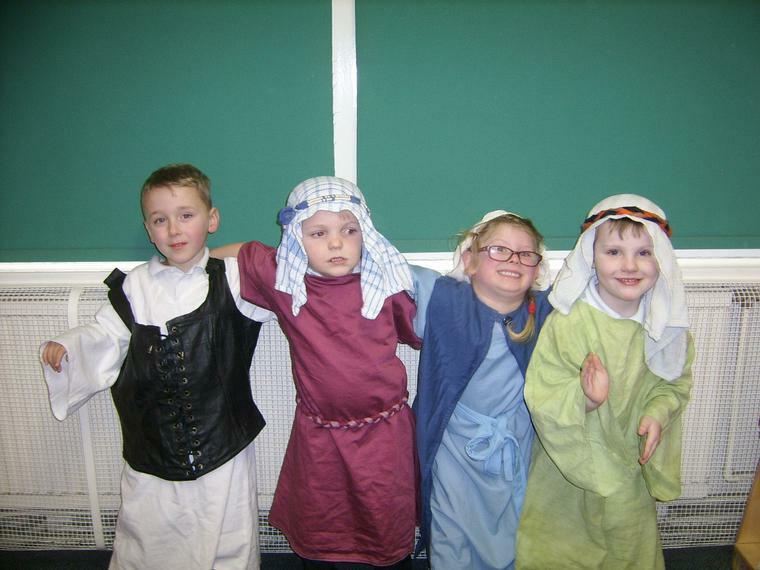 They retold the Christmas story with costumes, songs, dances, acting and narration beautifully. Thank you to all the friends and family who came to support them, share some festive snacks and enjoy their work in Maple profiles. We hope you enjoyed Friends of Ashfield's Christmas disco last night, which raised £866 which will be spent on activities for your children. Many thanks to all who helped and supported the occasion. We look forward to seeing you next week for Early Years' Christmas production at 2pm on Tuesday 8th December and on Wednesday 9th December at 2pm or Thursday 10th December at 6pm for KS2's production of Hansel and Gretel. Don't miss out on our Chrstingle on Thursday 17th December at 1.45pm at Bridge Street Church. This will be led by KS1. Amy Shaffrey in Early Years - attending a 'party'. 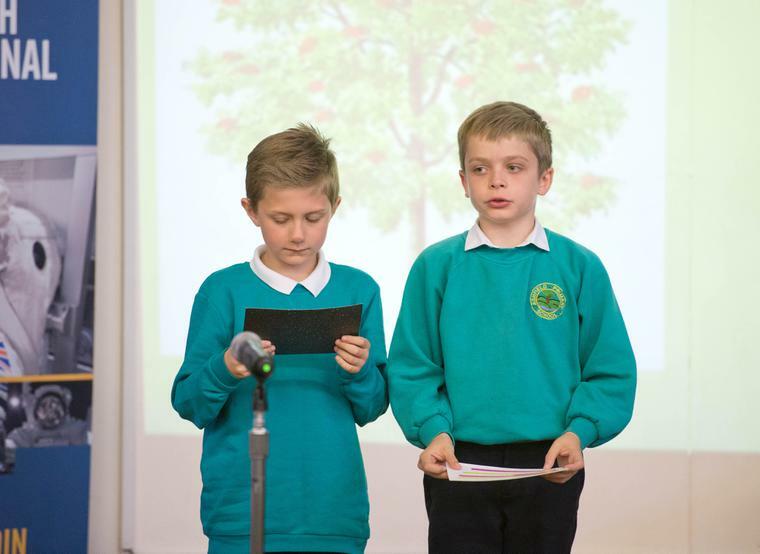 Governors joined staff and pupils in Ashfield on Tuesday 24th November. They were here to see what it feels like to be in school when the most important people are around - of course the children! Look at our governors' page to see what the children learned about them in a quick assembly quiz. 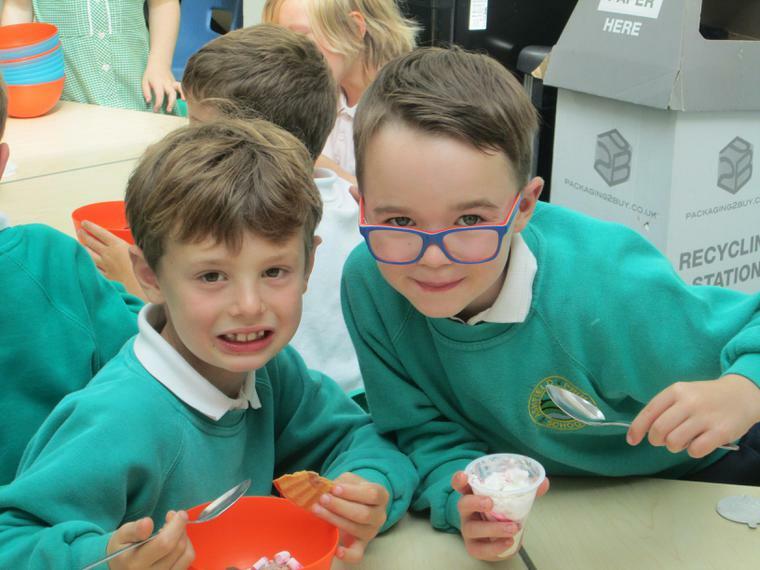 Thanks for a great Governors Day in school, everyone at school was very welcoming and enthusiastic about having us with them for the day allowing us to get involved with every aspect of the school day. As always, I was proud of all the children and staff and for the opportunity to be involved with Ashfield Primary School. If you could say a huge thank you to our pupils who welcomed us, asked us some tough questions and made us all feel privileged to aid in their learning, if only for one day. 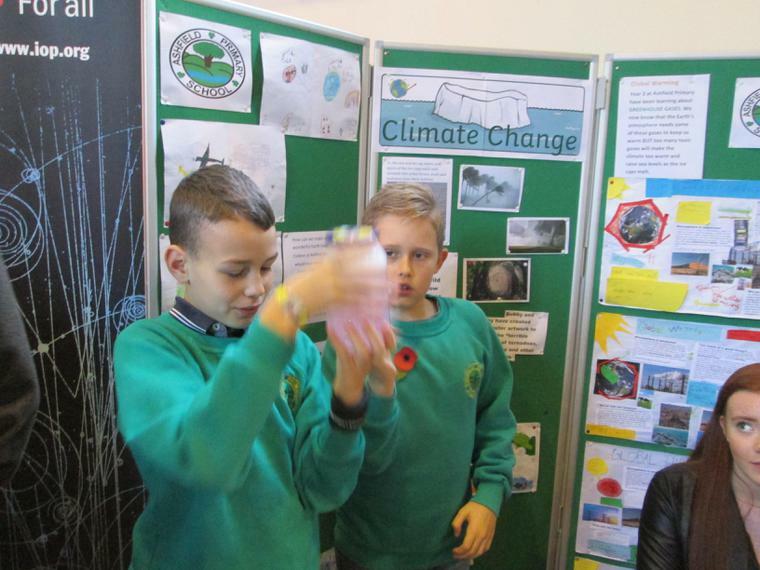 Our pupils were engaging and welcomed the governors. I am sure I speak for our governors when I say we have a deeper and greater appreciation of the support, commitment and genuine hard work all our staff put in, day in day out, I know I certainly do. I thoroughly enjoyed my afternoon in school and was really amazed at how approachable and confident the pupils seemed. At lunchtime I couldn't keep up with the questions they were firing at me. The children and teachers seem comfortable and happy in their learning environment, which in my eyes makes a happy school, thank you, staff and the pupils for letting me join in. Hear hear. It was a great day. Thanks very much. 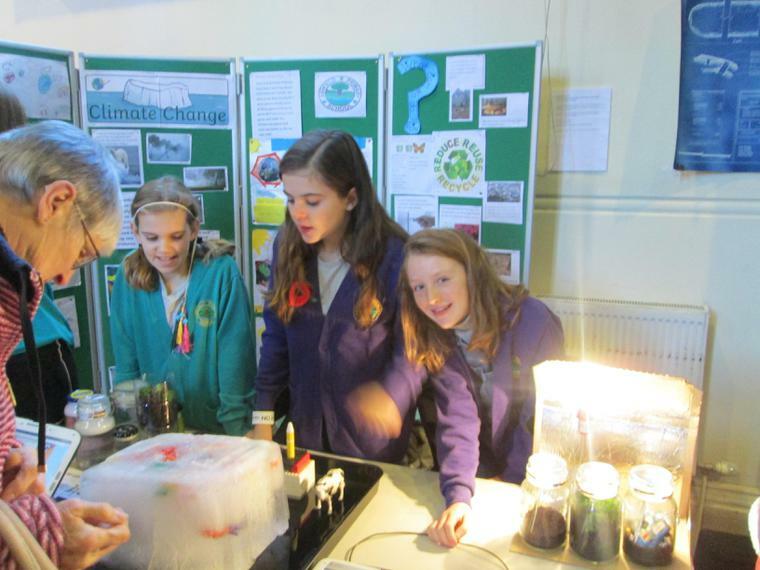 Pupils and staff represented Ashfield on Saturday 14th November at Otley's science festival at the Courthouse. 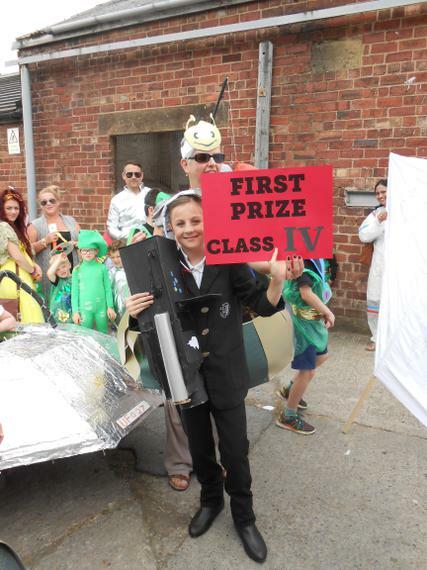 Ashfield's theme was kitchen sink science. 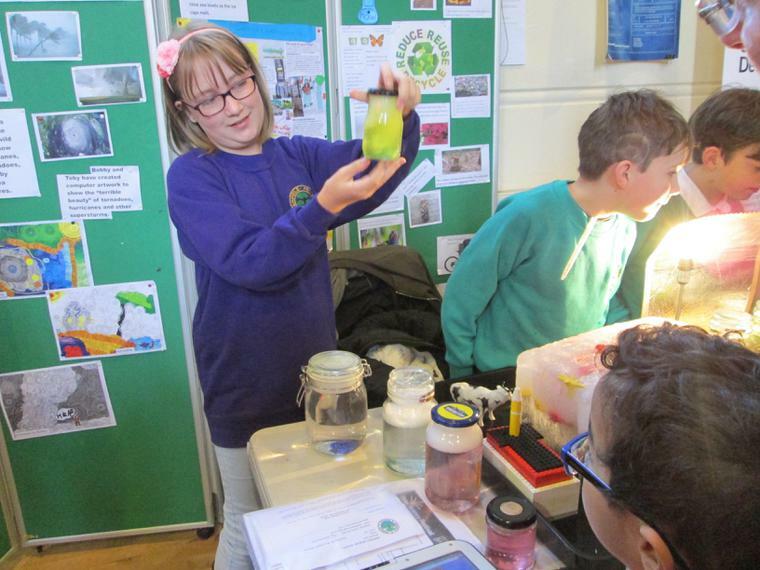 Children showed how you can tell if an egg is raw or boiled using inertia theory; they explained how an egg can float in salt water; how cream is made when fat molecules clump together and how carbon dioxide bubbles are formed in fizzy drinks. 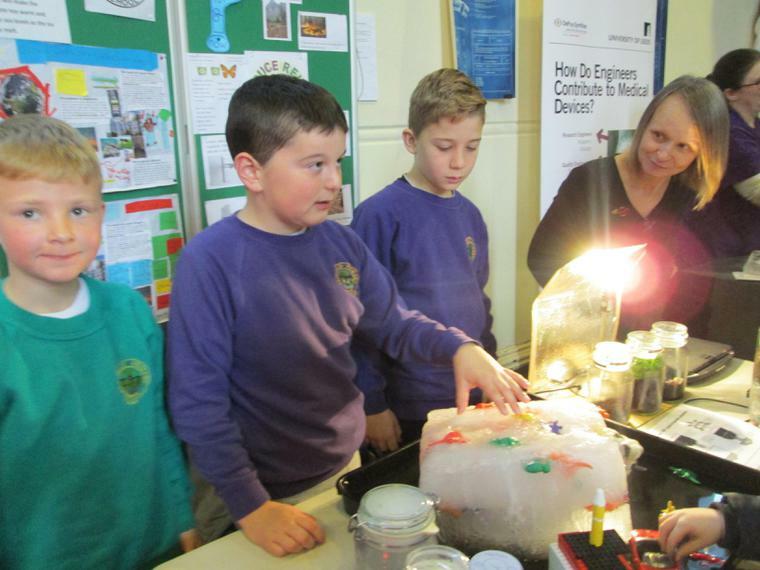 Staff and visitors to our stall complemented the children on their scientific knowledge, enthusiasm and communication skills. We were very proud. As part of our Healthy Schools initiative, Year Six leaders, Frankie Braithwaite, Mia Donaldson and Amy Doran set up Ashfield’s walking club with Mr Patel’s help. 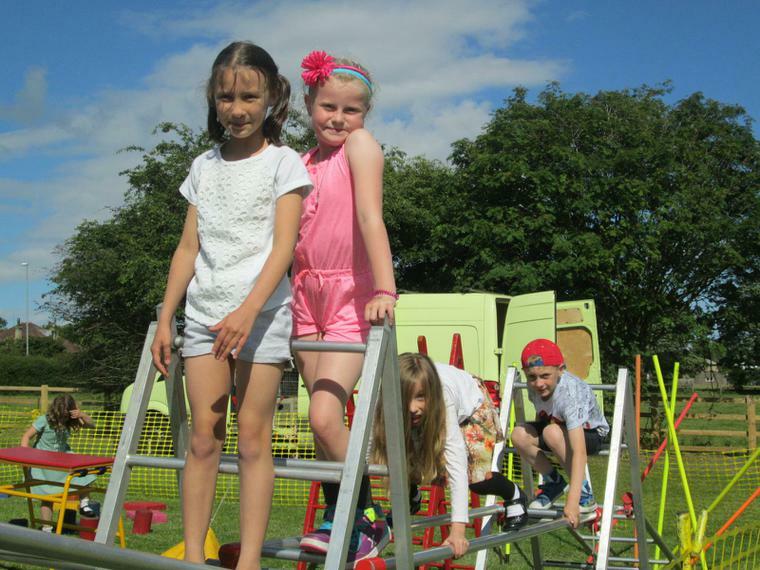 Children and their adults are challenged to complete as many laps as they can around our playground circuit. 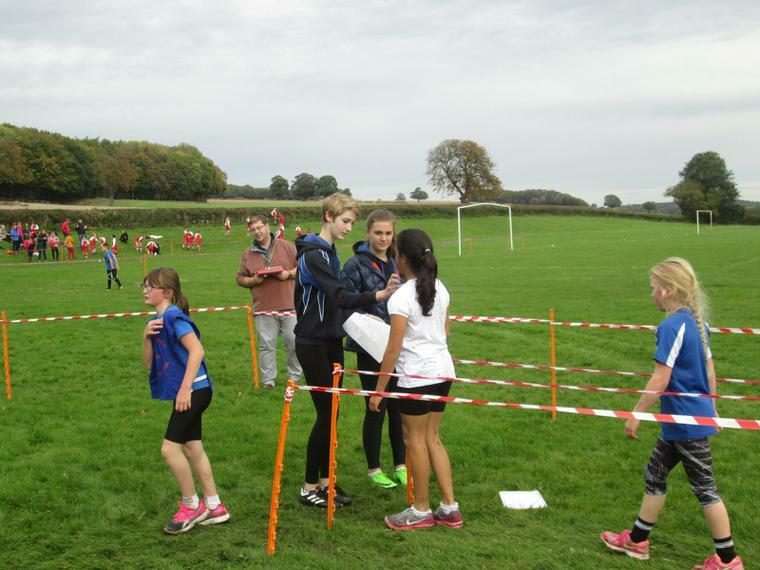 Lolly pop sticks are given to the participants to mark the laps. Class teachers are collecting the data and children doing well will be celebrated with in Friday assemblies. Walking Club runs from 8:20 to 8:40 every morning.